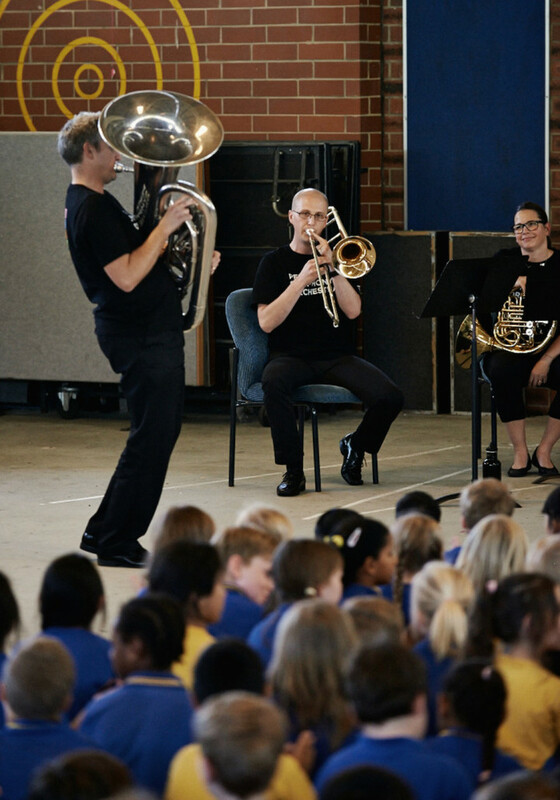 Perth Symphony took it’s Brass quintet to East Kenwick Primary School on Monday November 9, 2015. 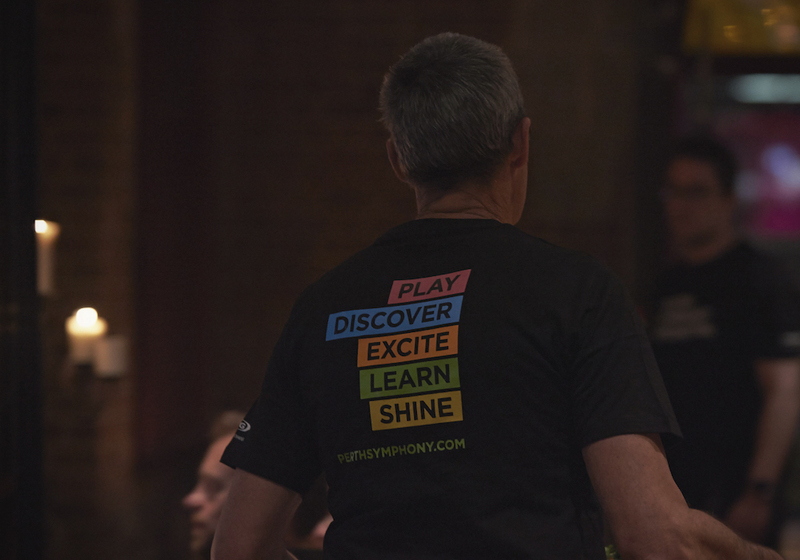 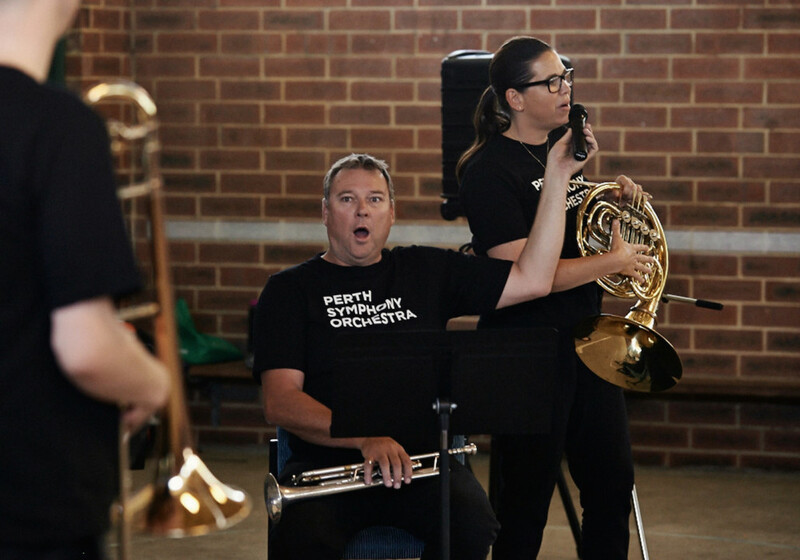 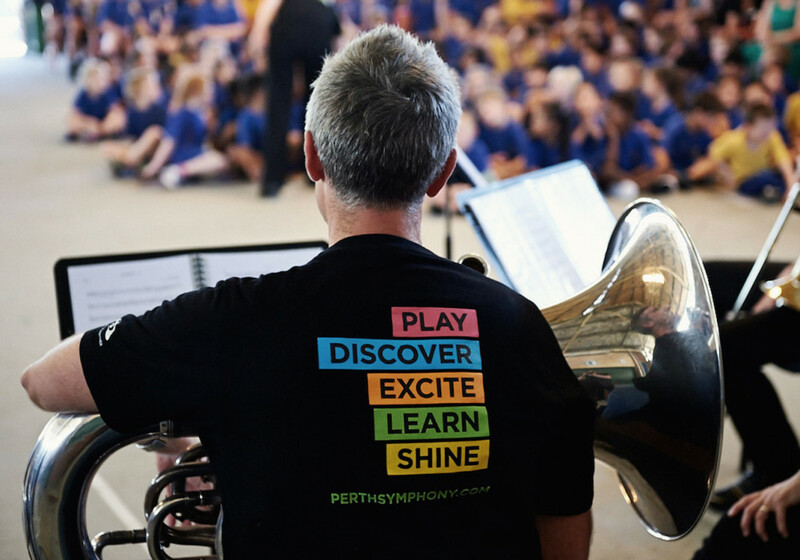 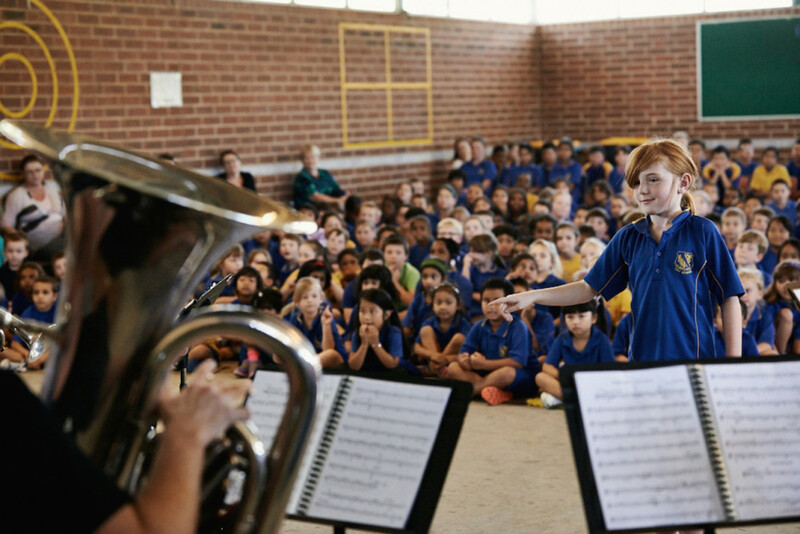 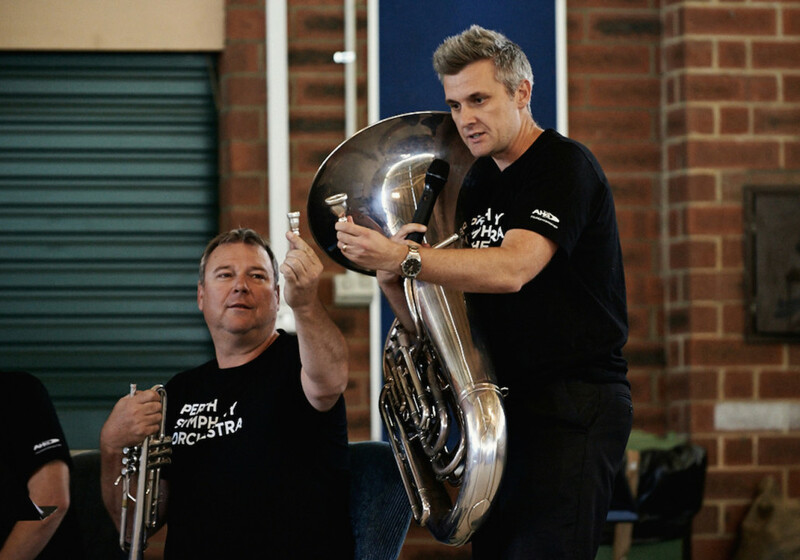 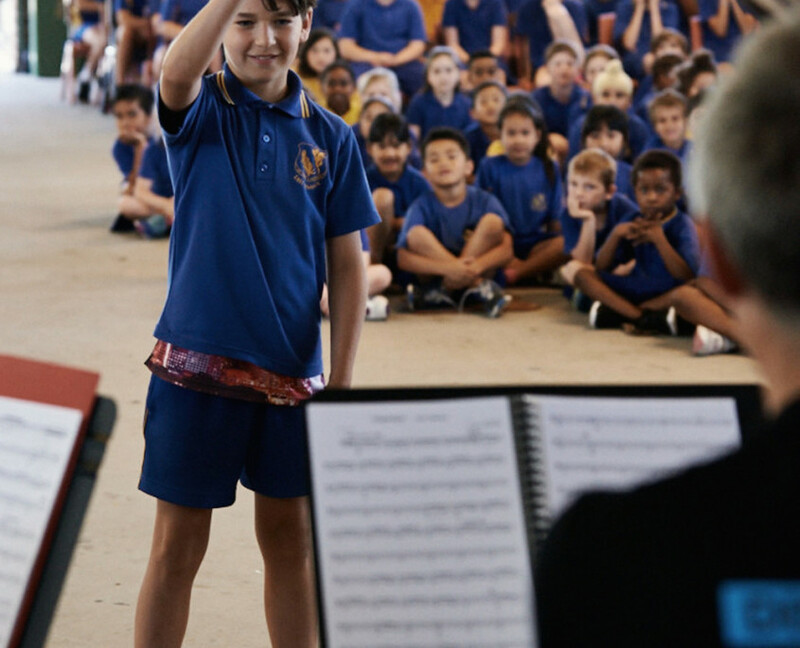 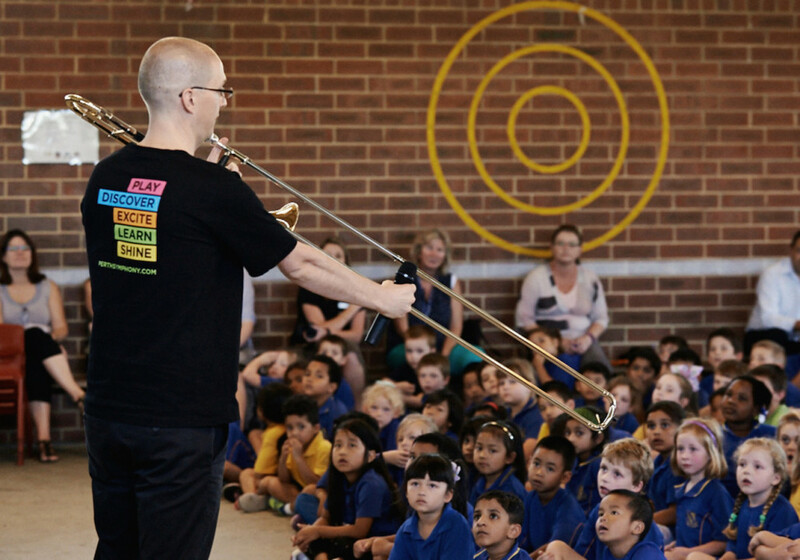 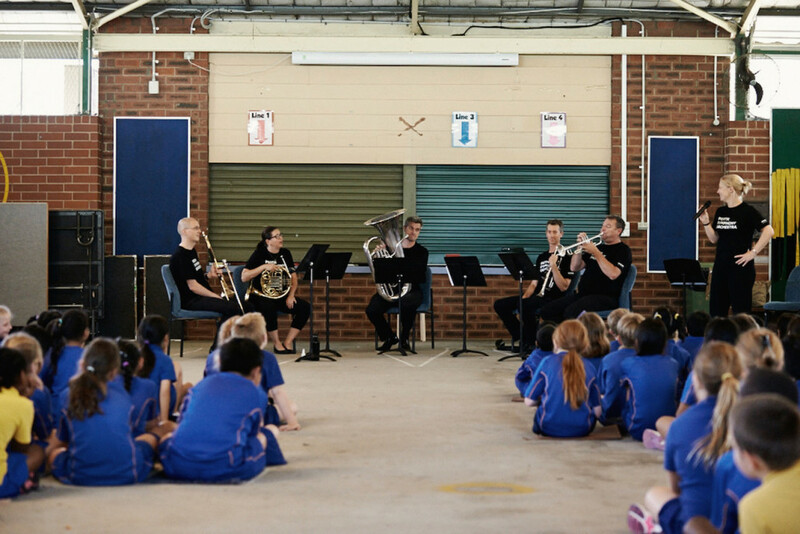 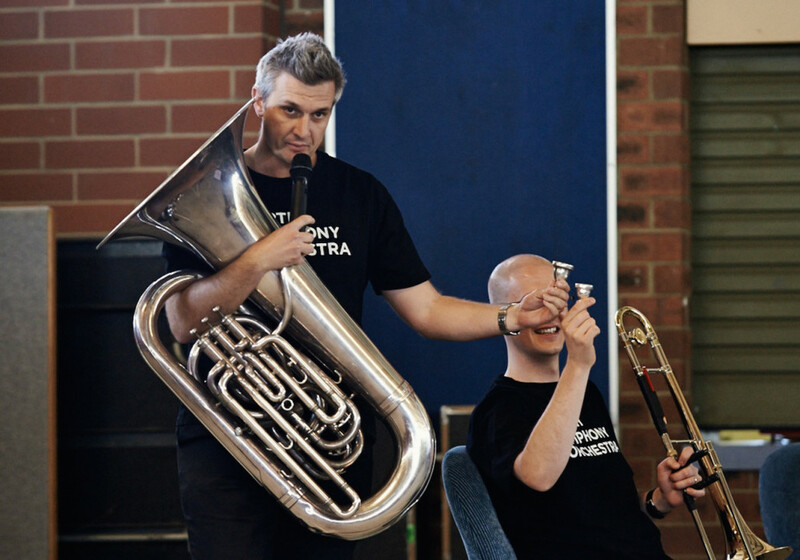 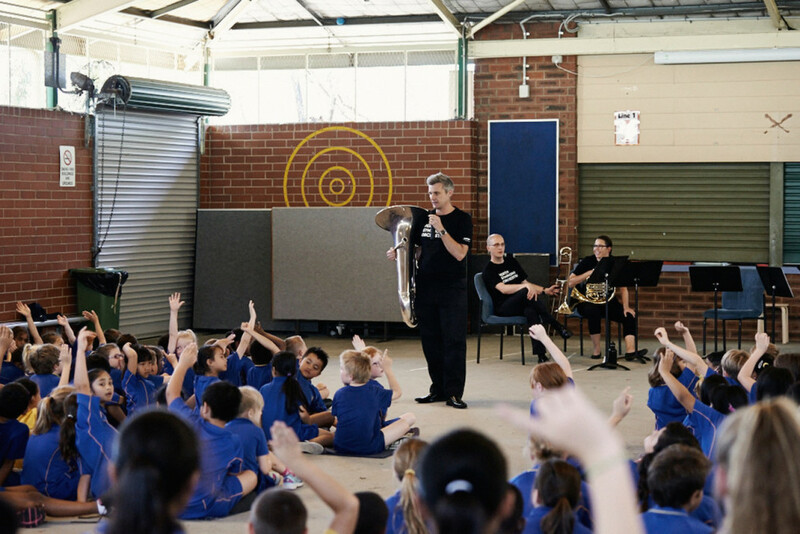 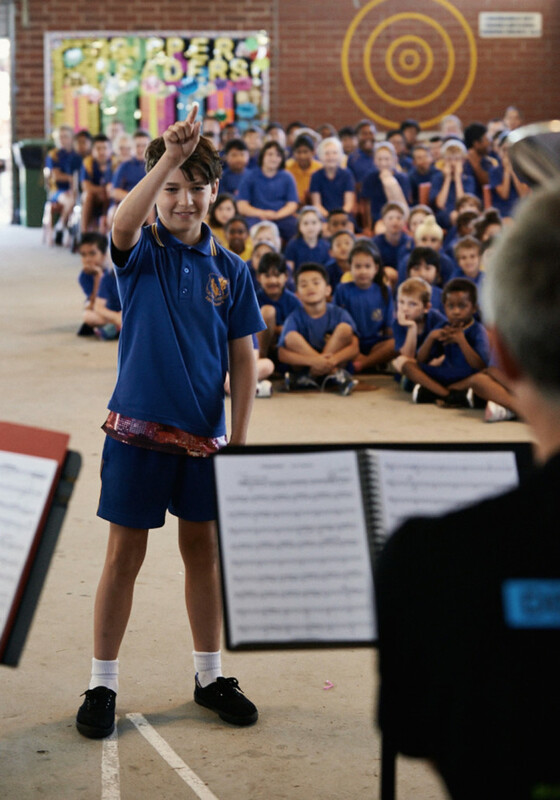 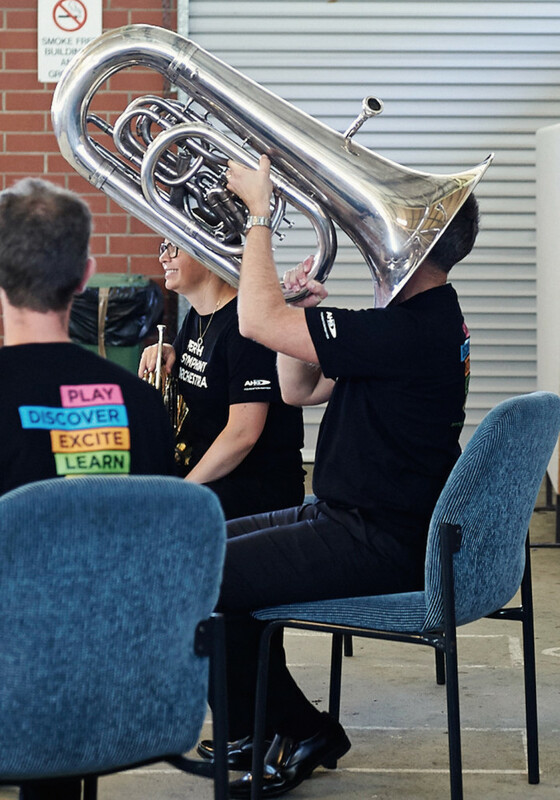 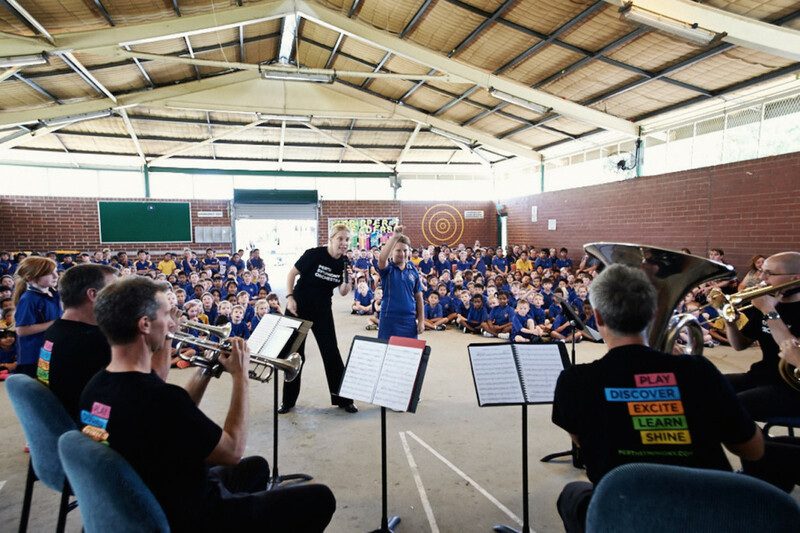 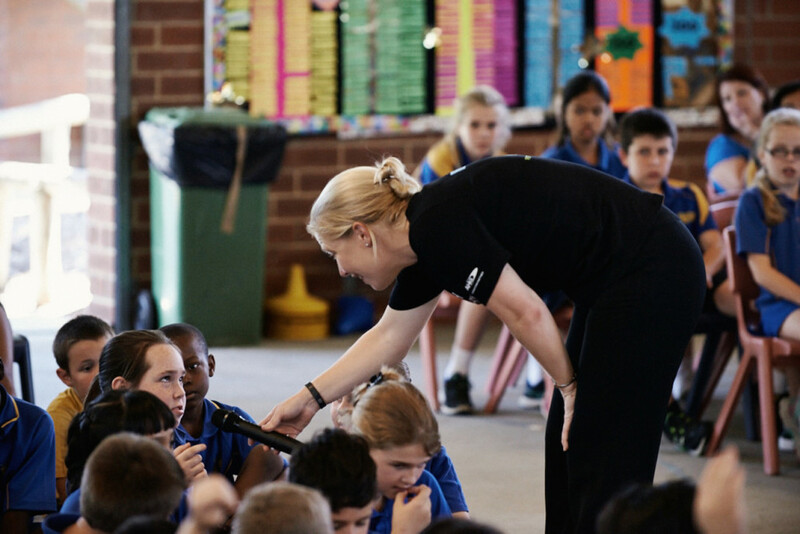 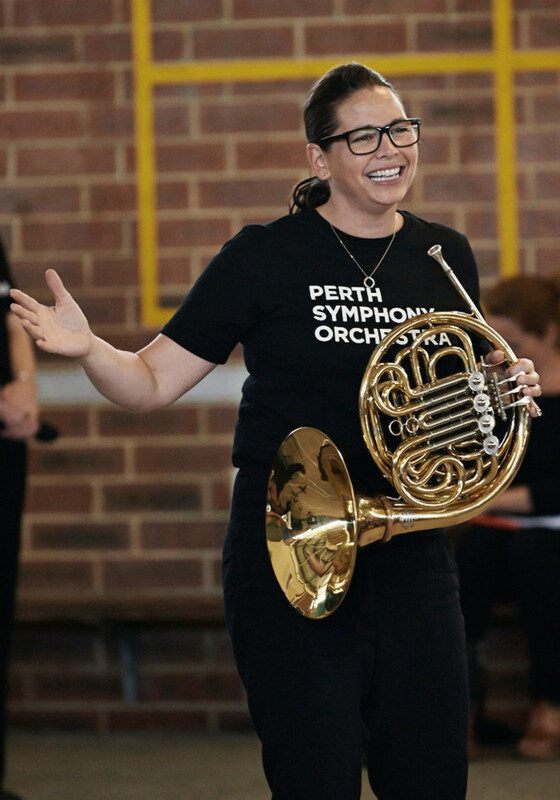 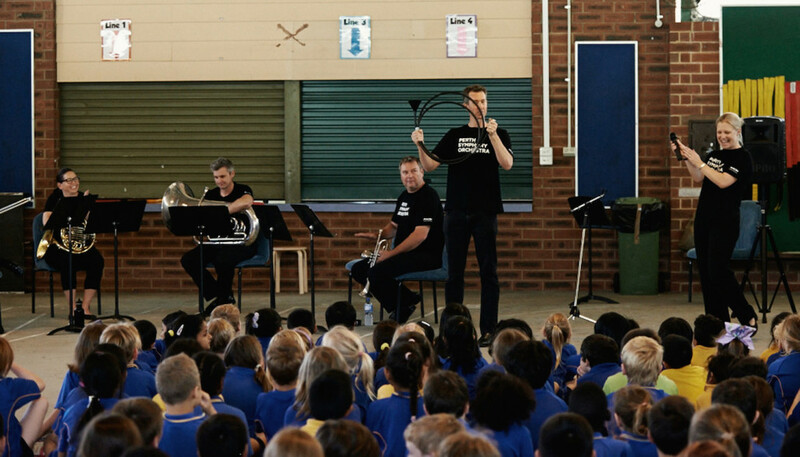 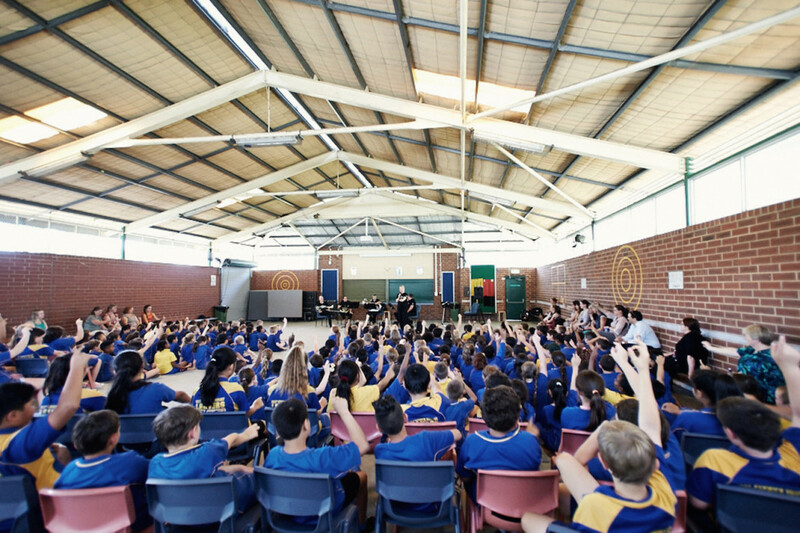 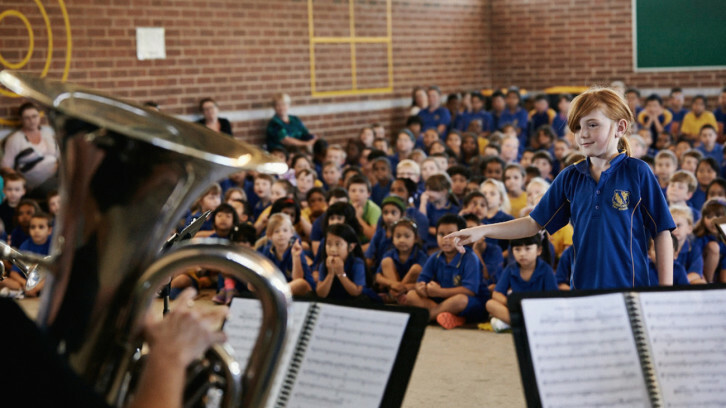 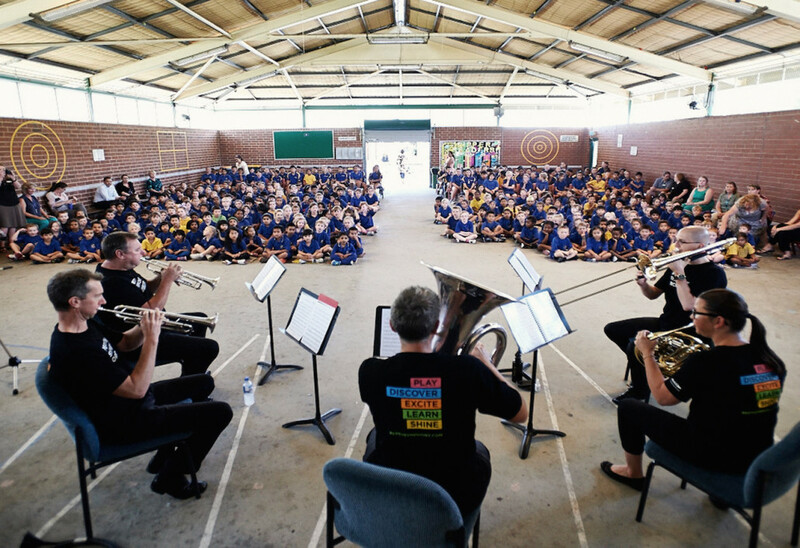 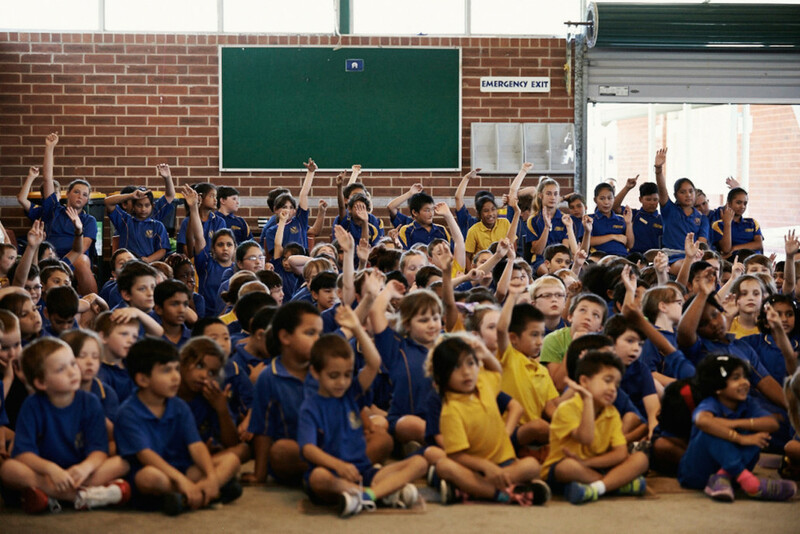 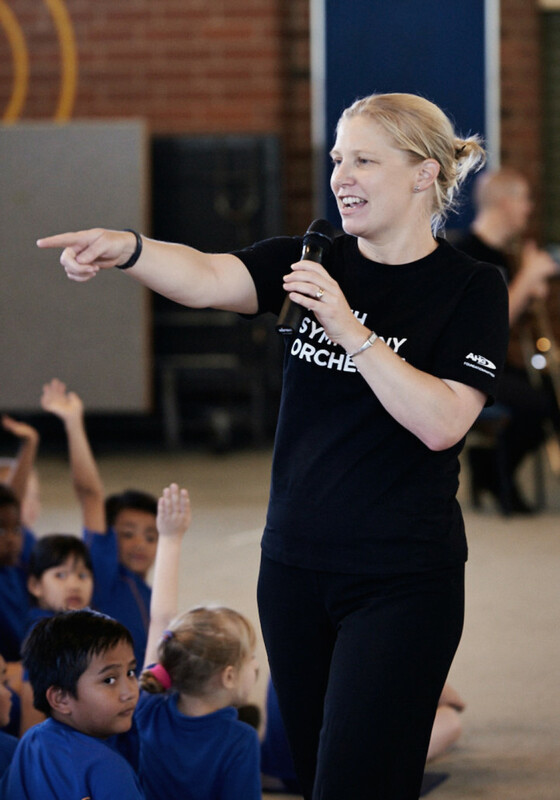 Hosted by Bronwyn – PSO Education and Community Coordinator – the kids learnt about the brass family and got to interact with our musicians – even trying to get the musicians to play their instruments backwards! 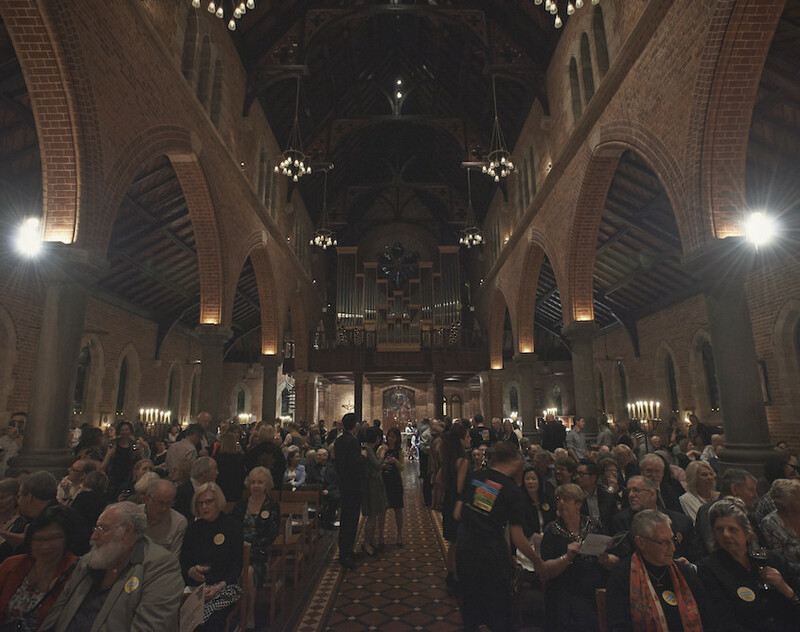 Photo credits to Richard Jefferson Photography. 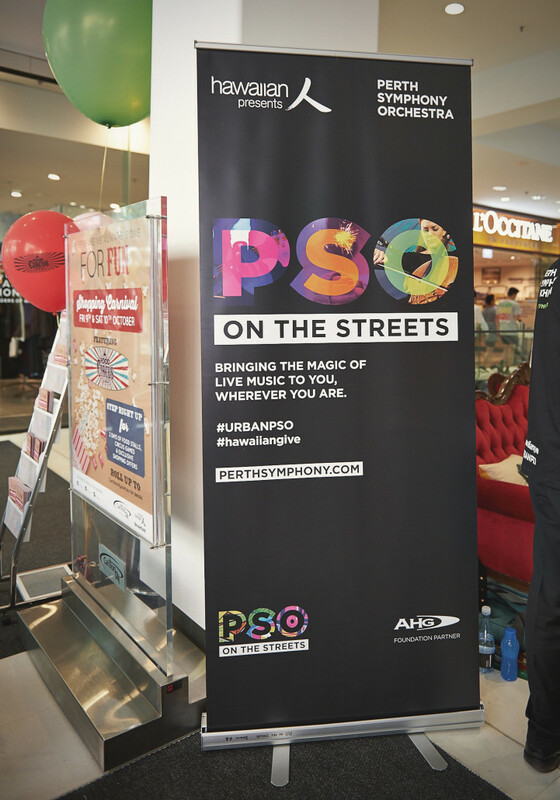 Hawaiian Presents ‘PSO on the Streets’ is a new initiative which takes music out of the concert hall and into the community. 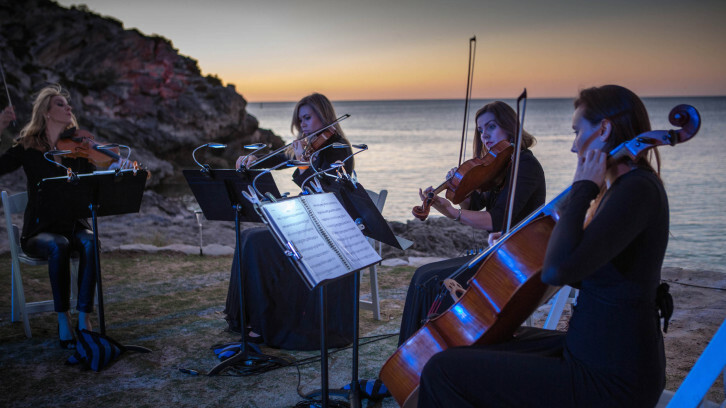 Four chamber ensembles, comprising musicians from each section of the orchestra (strings, woodwind, brass and percussion), have been popping up in Hawaiian-owned properties across the metropolitan area, with the aim of inspiring and growing people’s love of music. 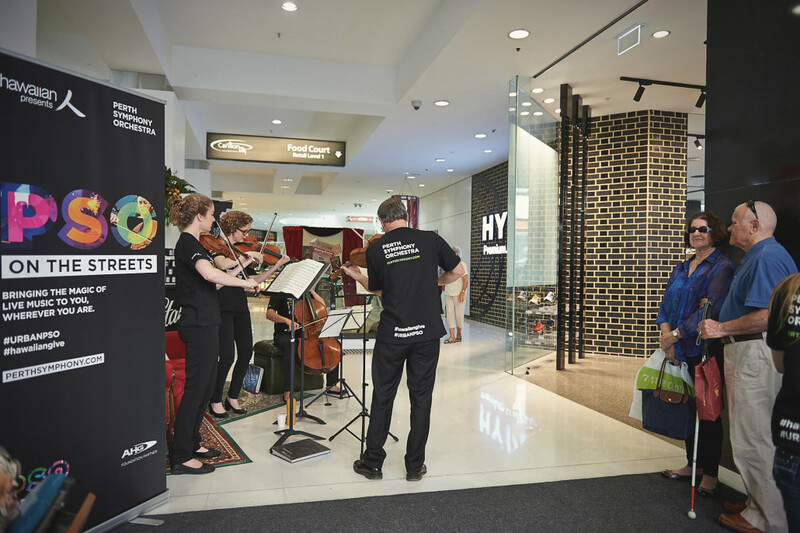 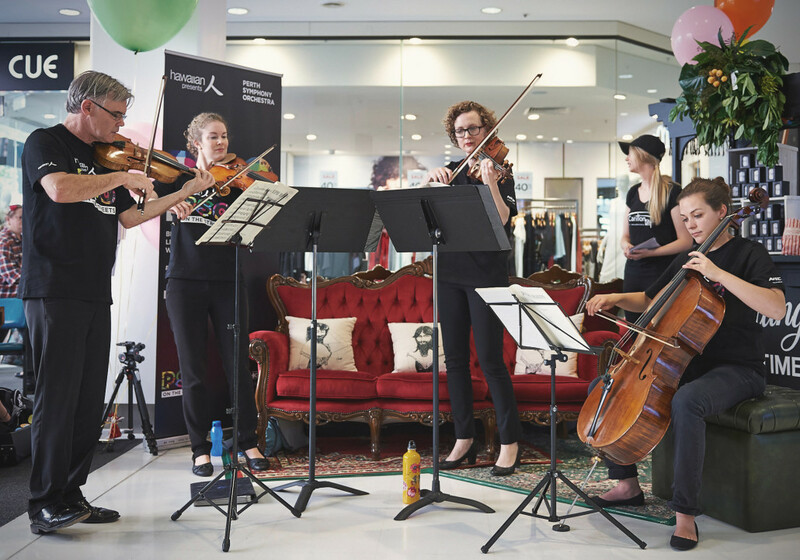 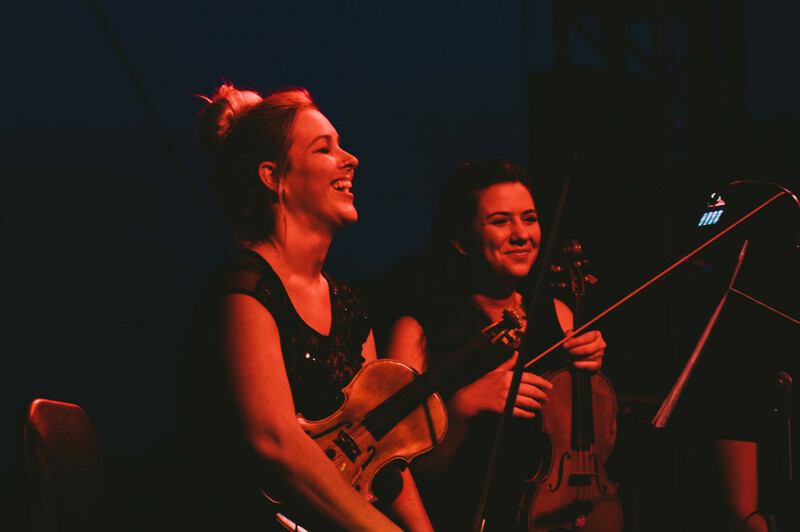 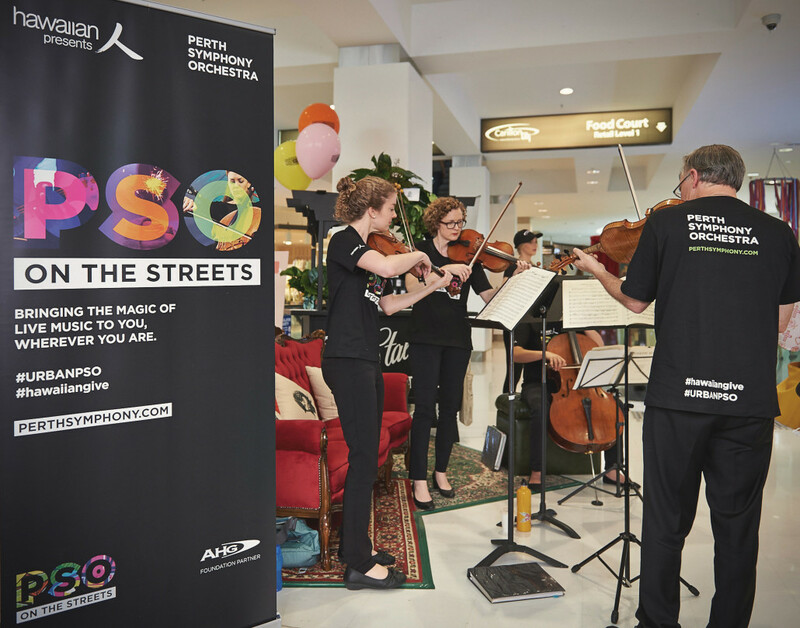 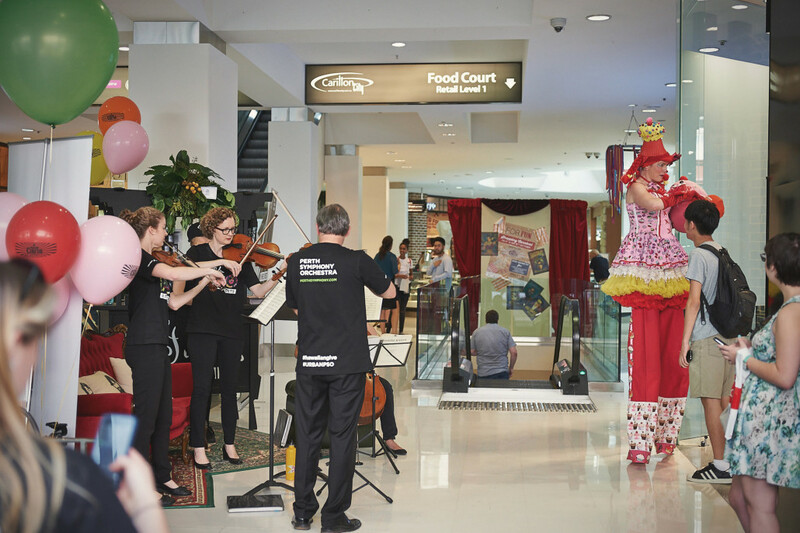 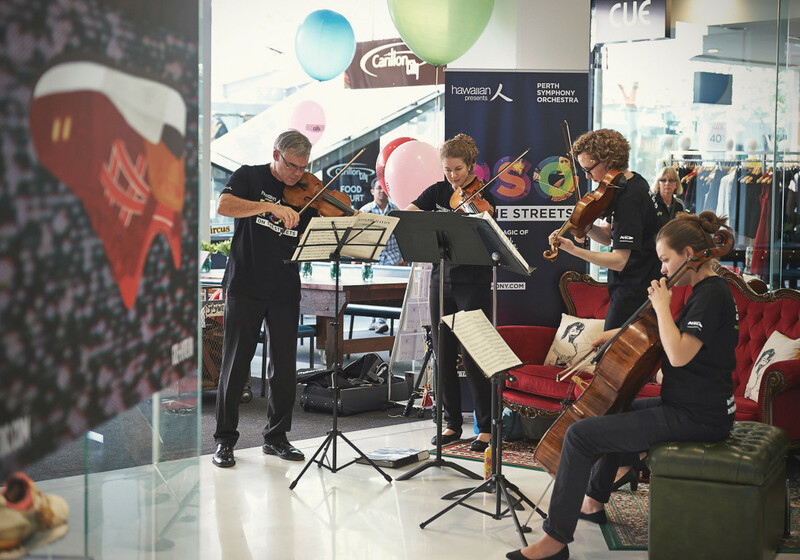 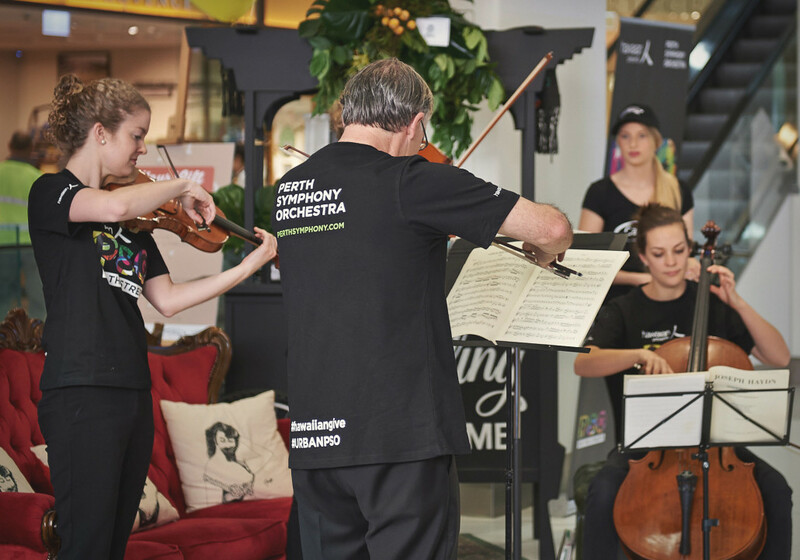 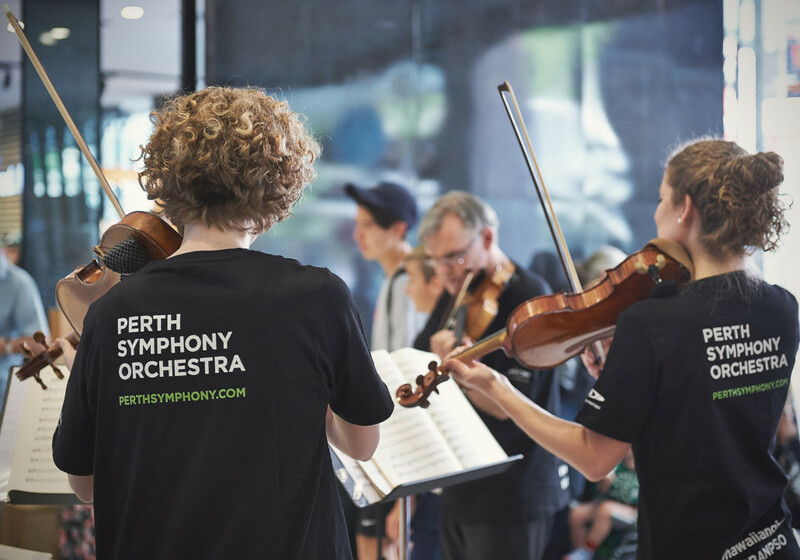 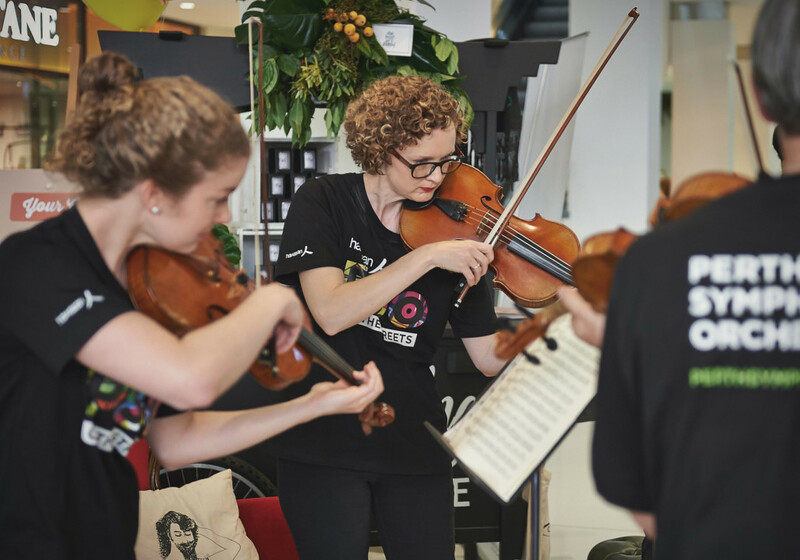 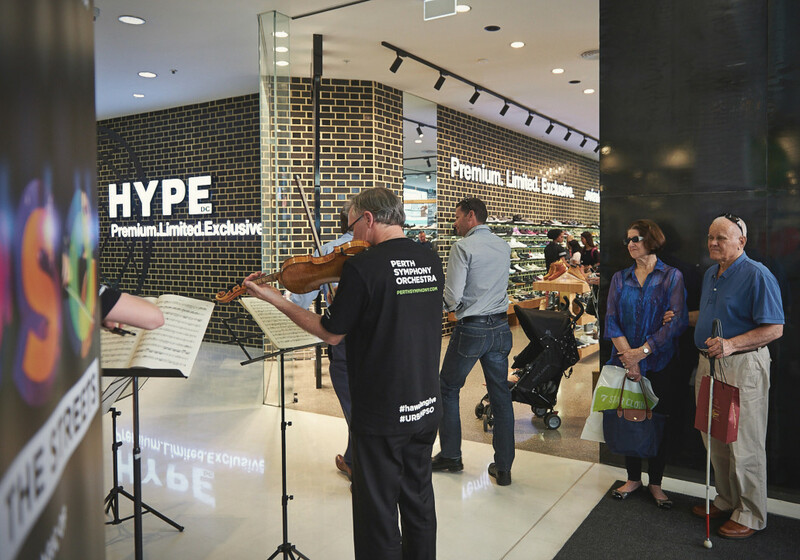 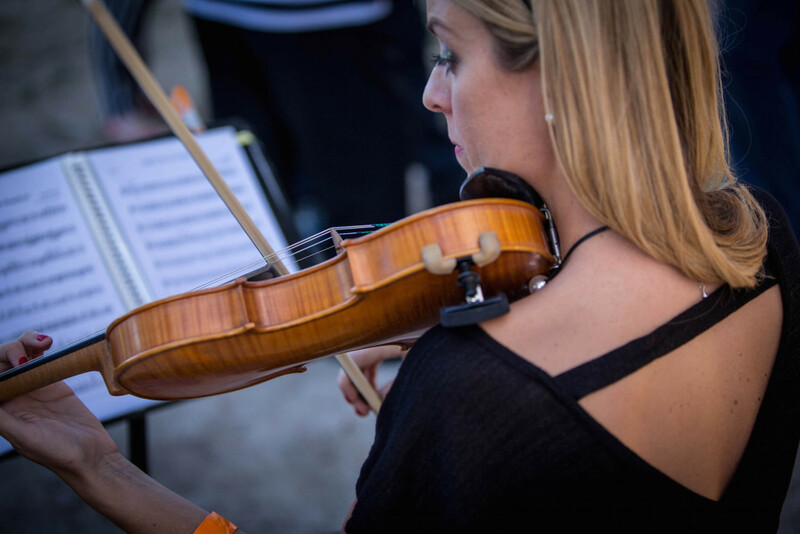 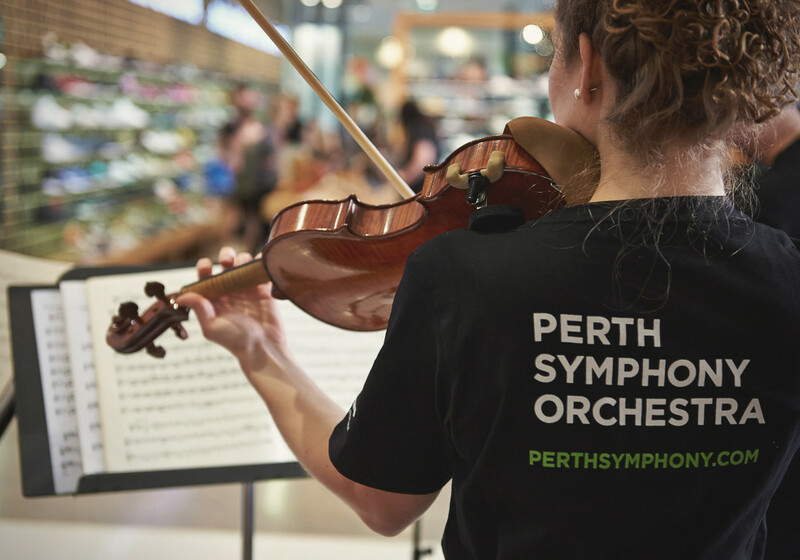 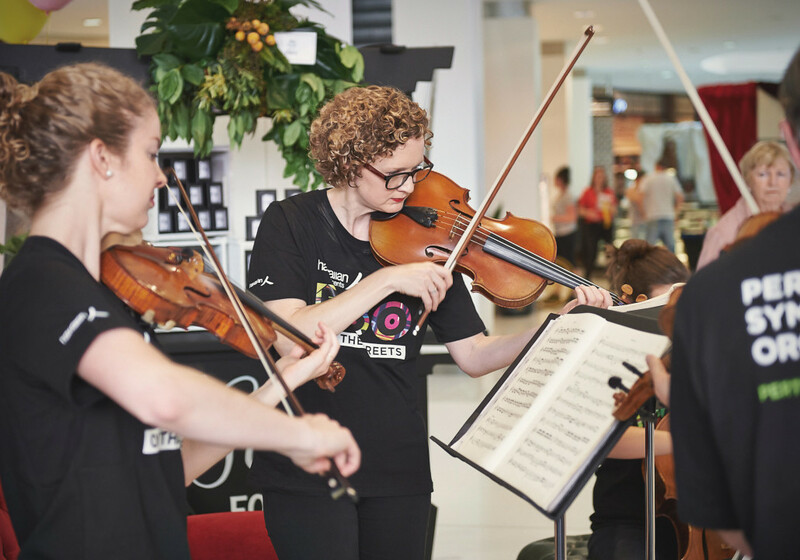 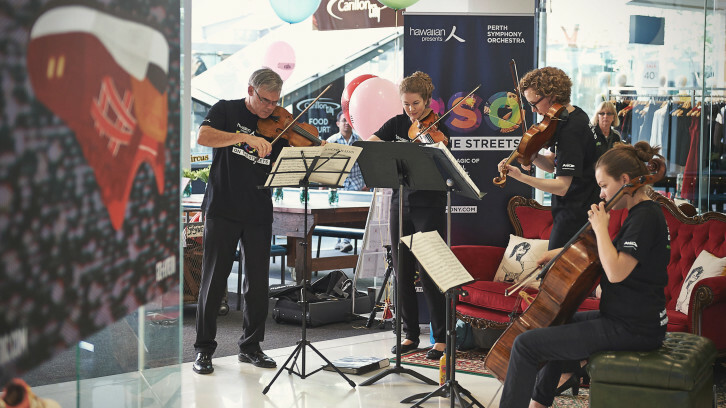 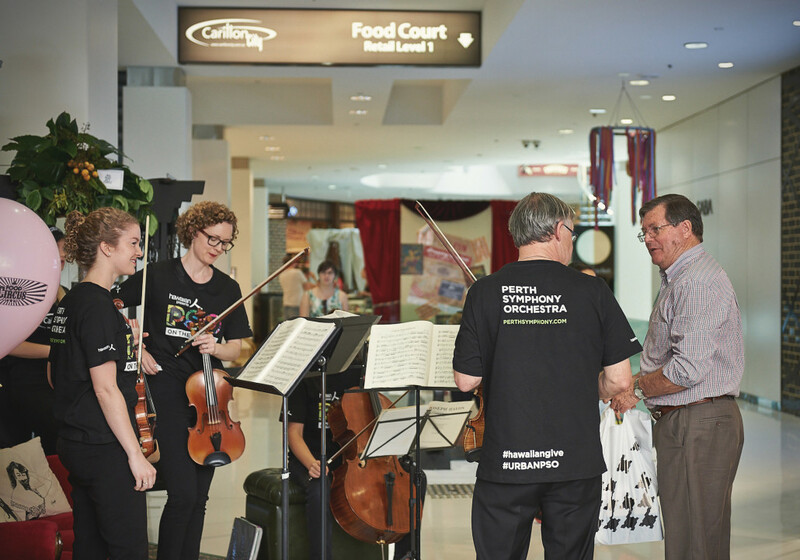 The #urbanPSO string quartet appeared at Carillon City in Perth, bringing their world class music to the streets for a free, one hour pop up performance! 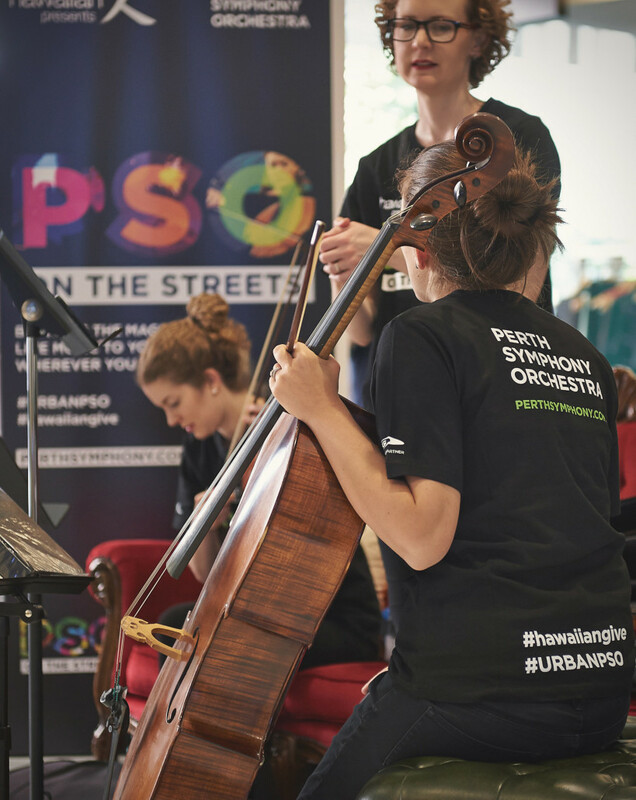 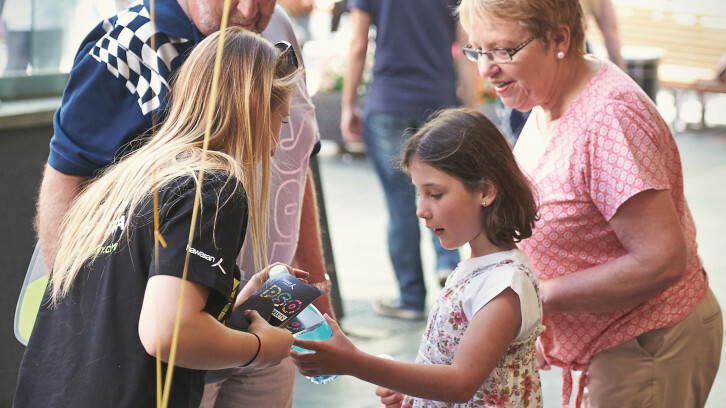 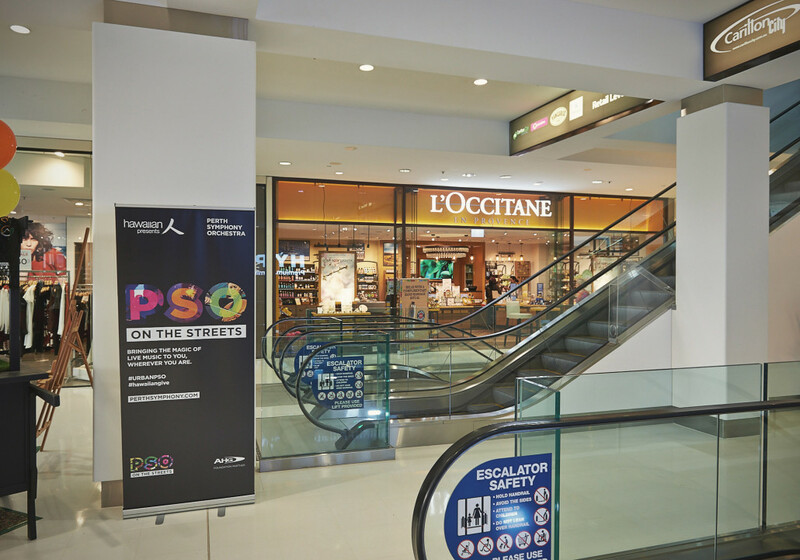 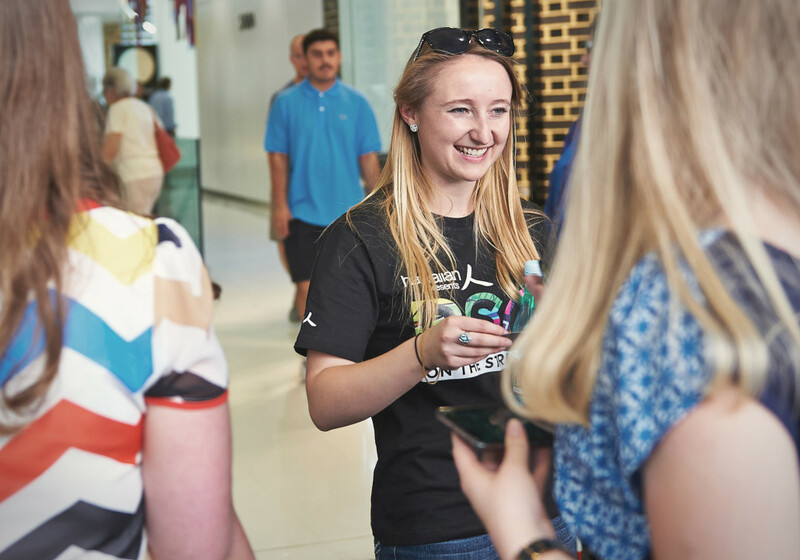 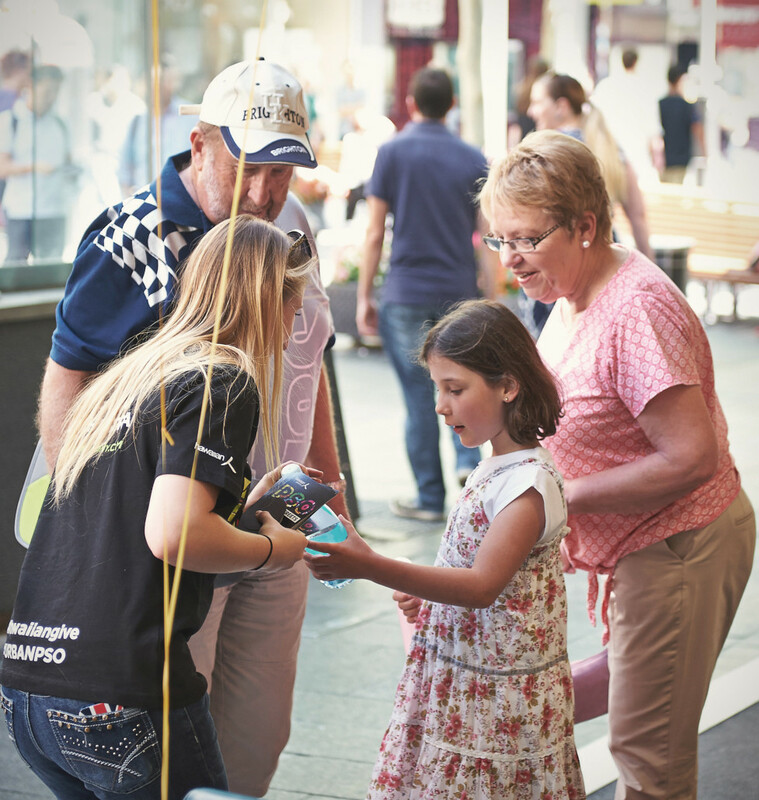 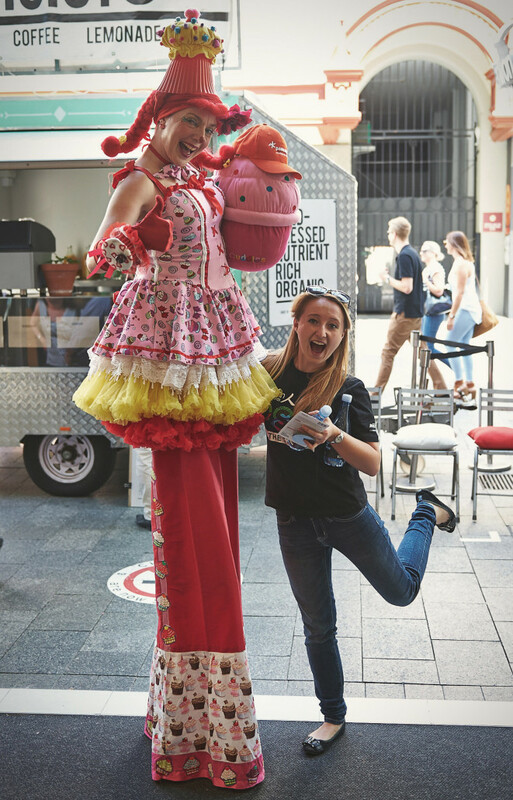 Follow #UrbanPSO to find out where we will be popping up next. 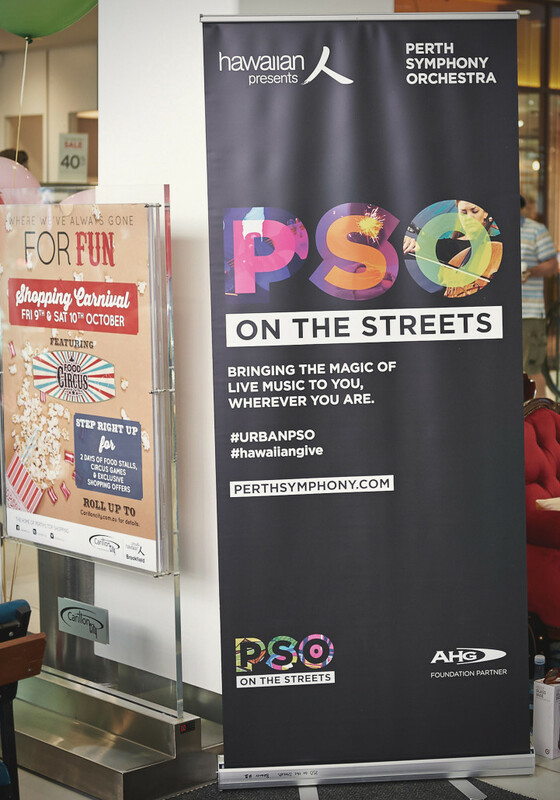 Hawaiian Presents ‘PSO on the Streets’ is a new initiative which takes music out of the concert hall and into the community. 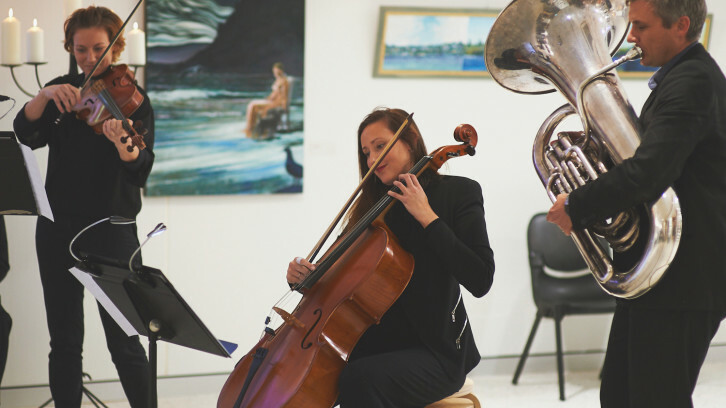 Four chamber ensembles, comprising musicians from each section of the orchestra (strings, woodwind, brass and percussion), have been popping up in Hawaiian-owned properties across the metropolitan area. 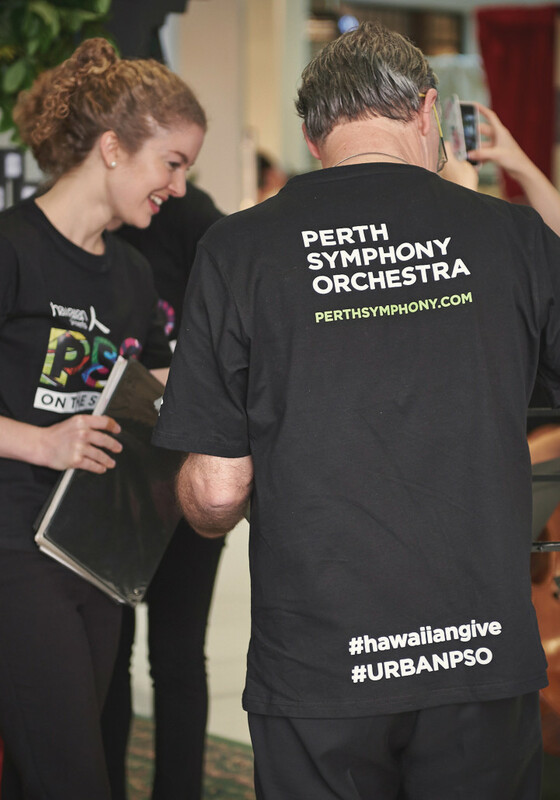 With help from Hawaiian we can now bring our world-class musicians to the streets of the community to inspire and grow people’s love of music. 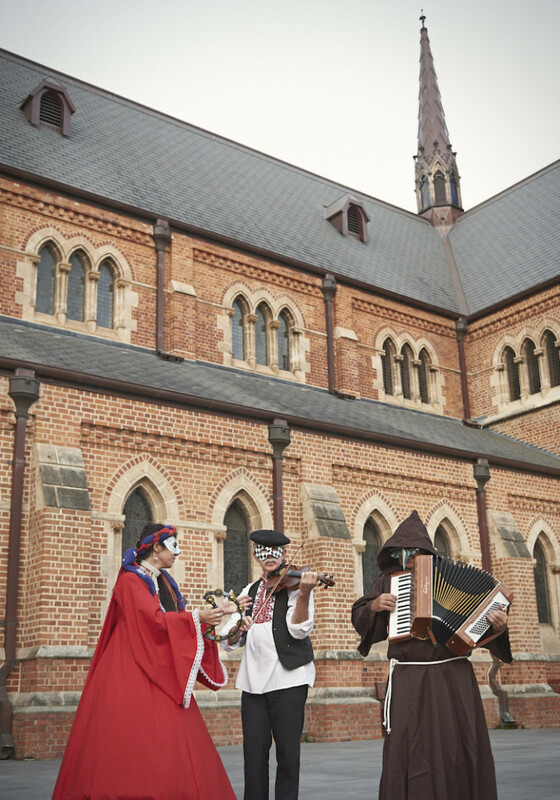 Watch this space for more magical moments. 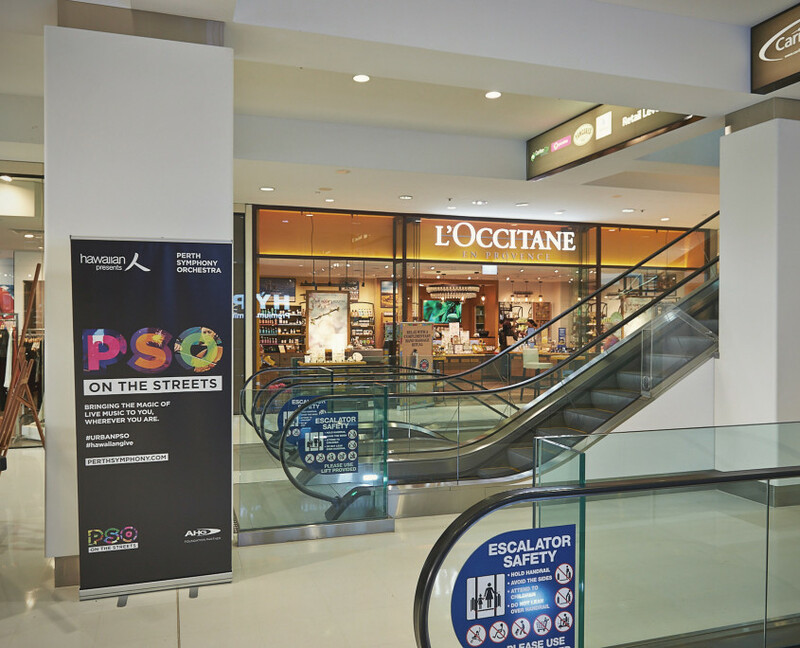 Follow #UrbanPSO to find out where we will be popping up next. 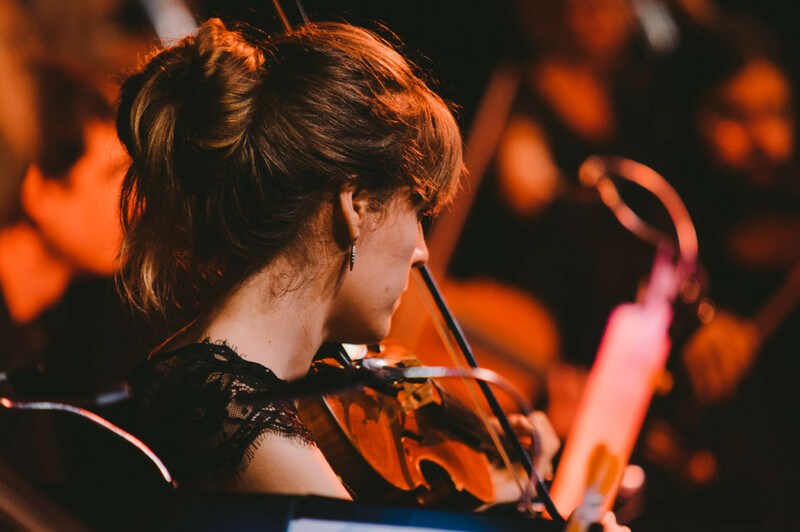 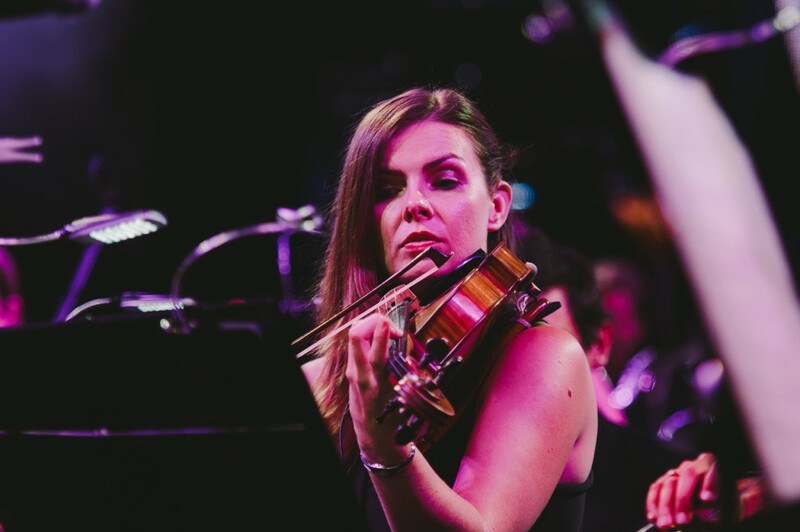 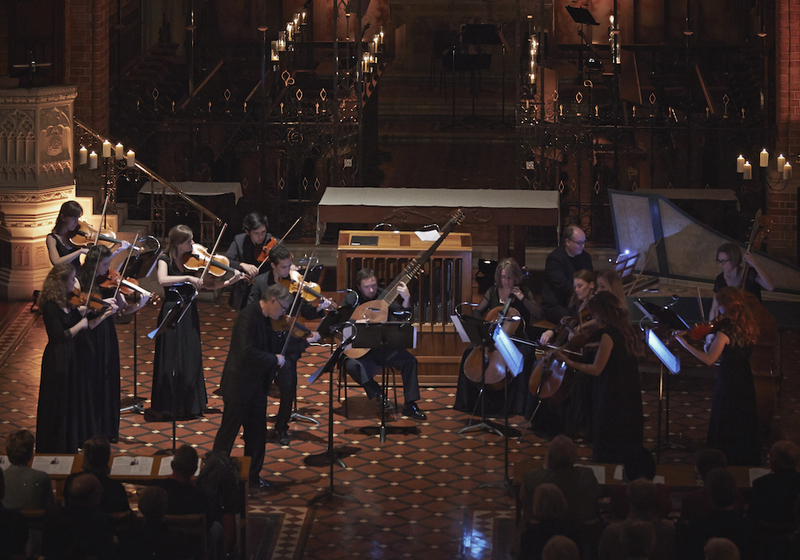 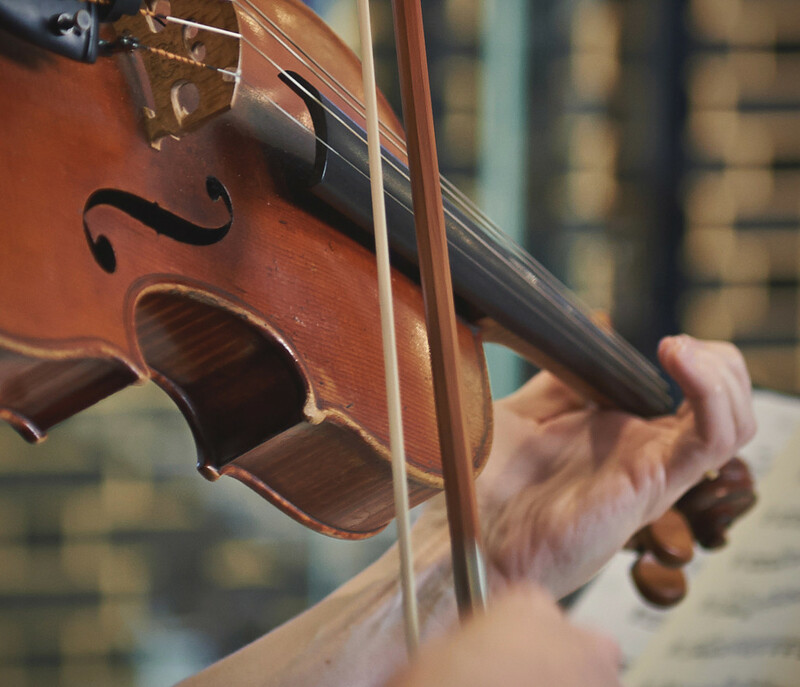 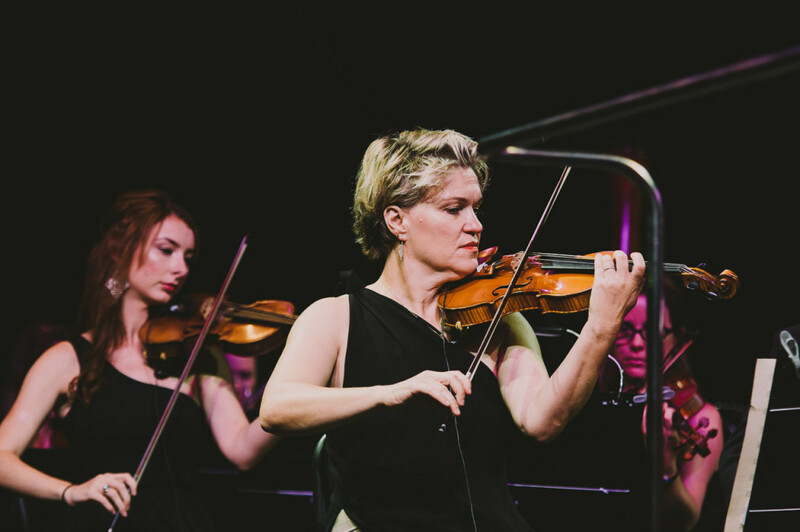 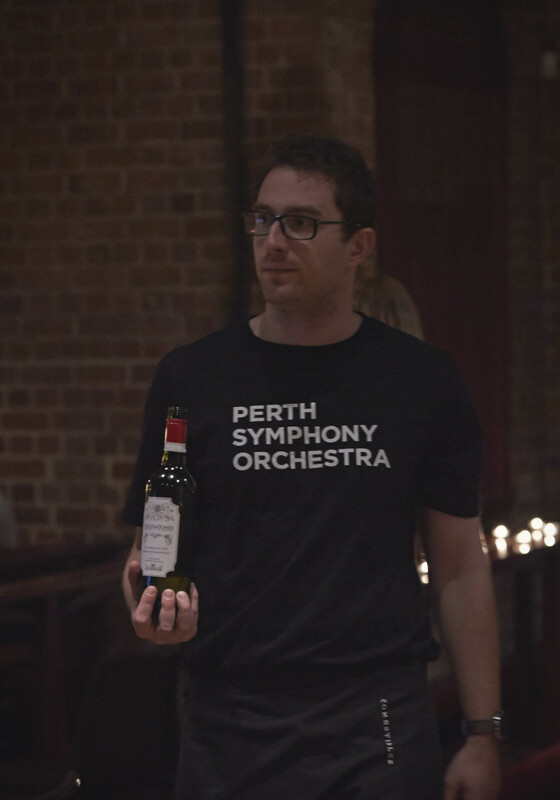 Perth Chamber Orchestra returned to the heart of Perth city with their critically acclaimed ‘Vivaldi by Candlelight’ concert. 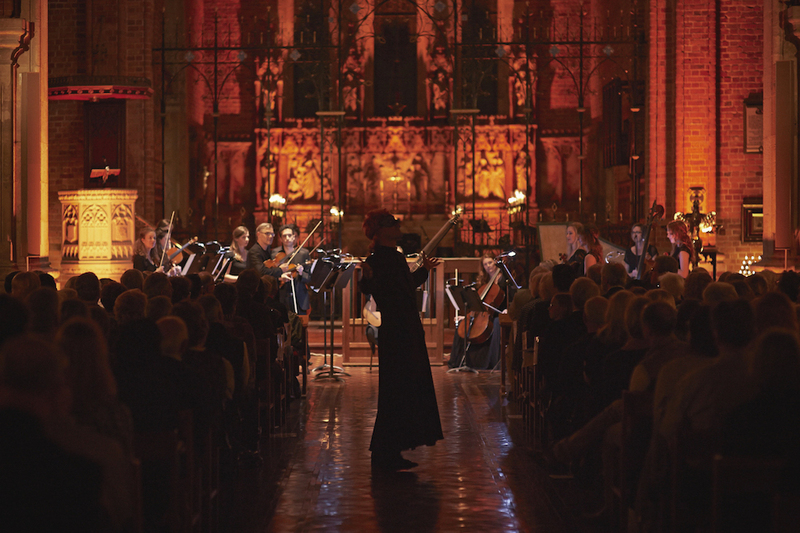 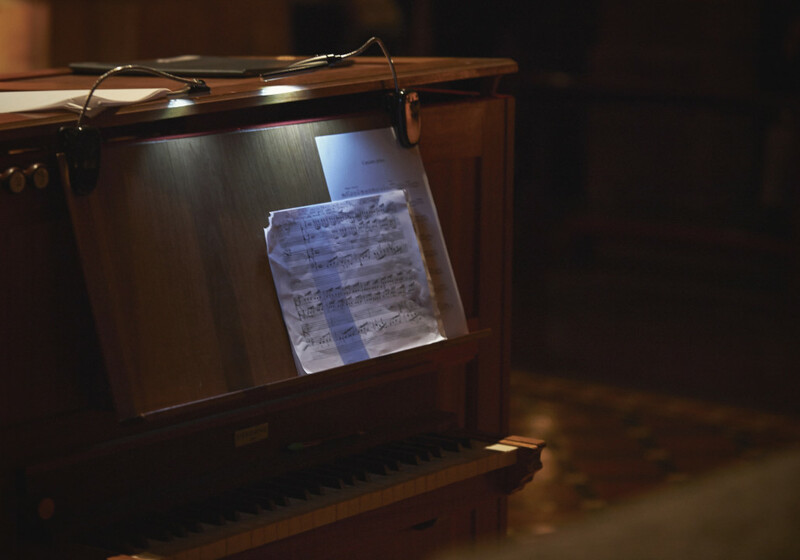 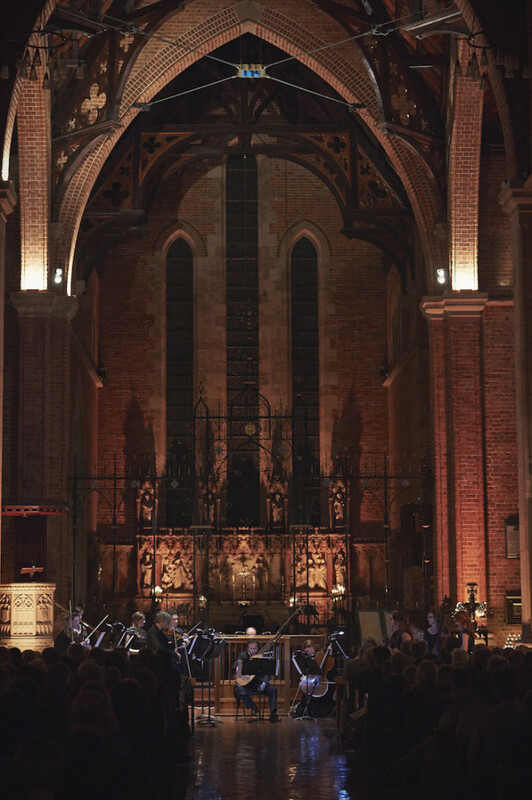 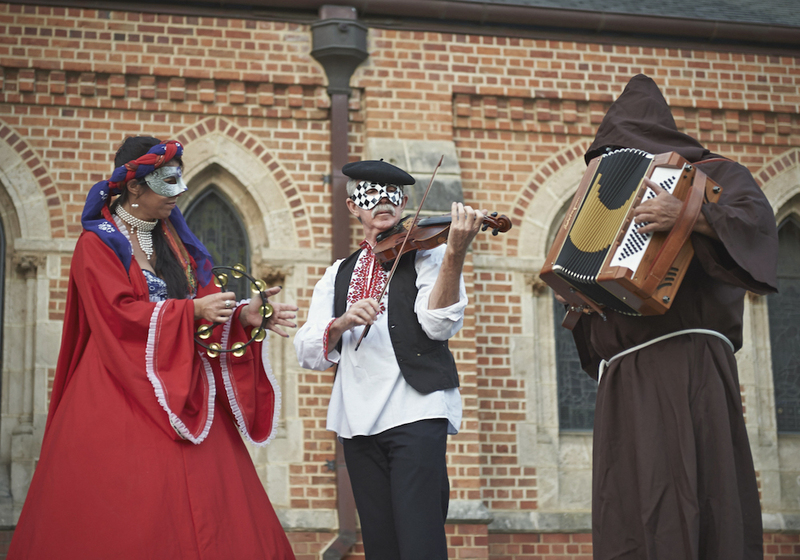 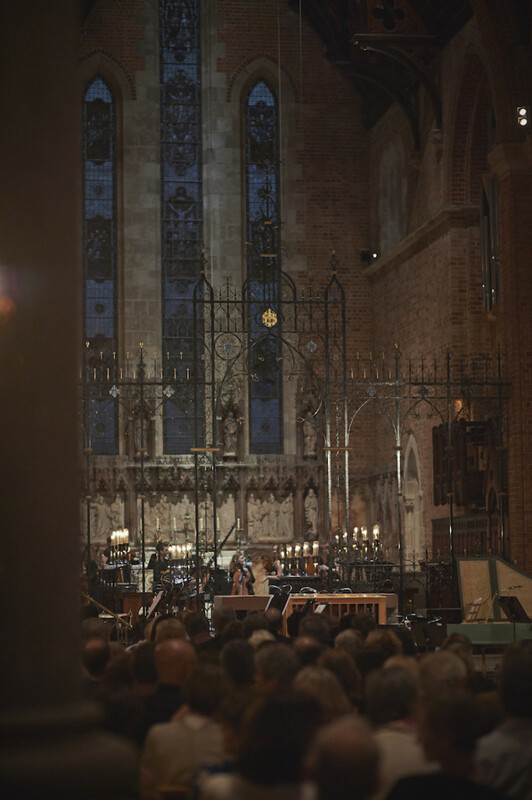 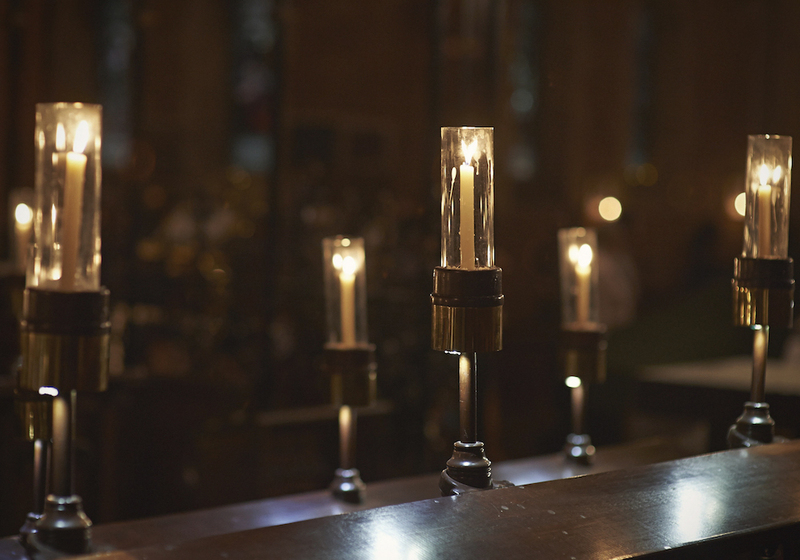 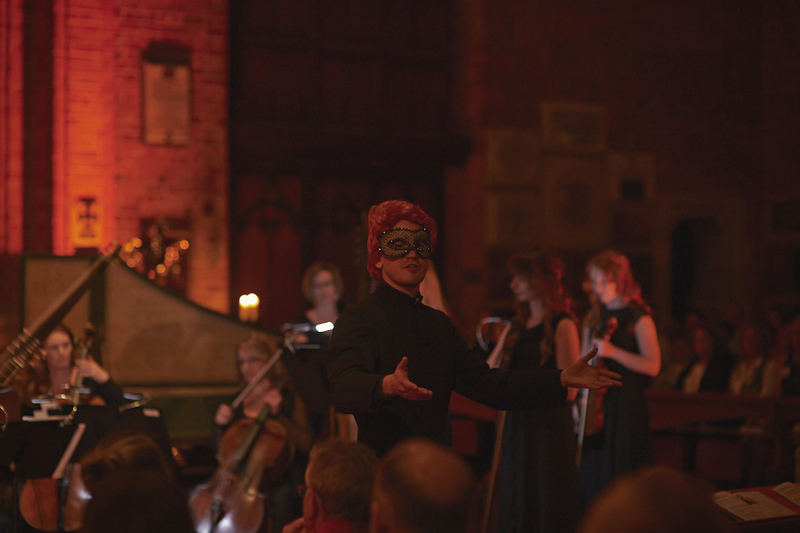 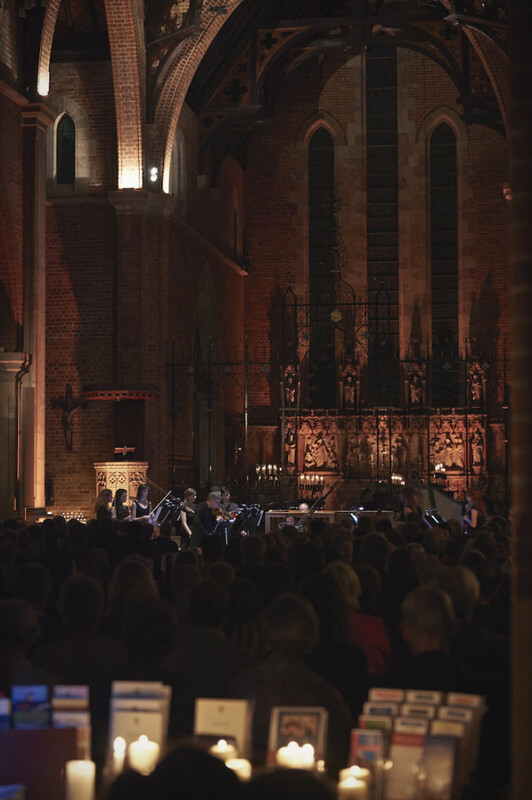 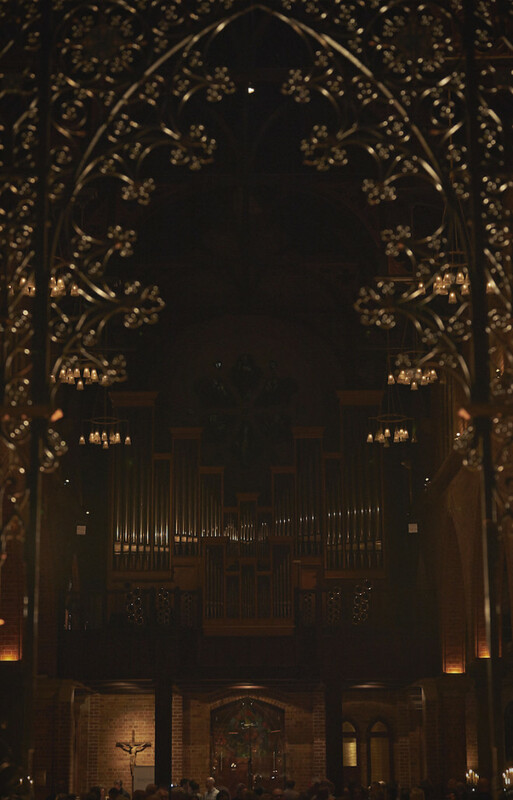 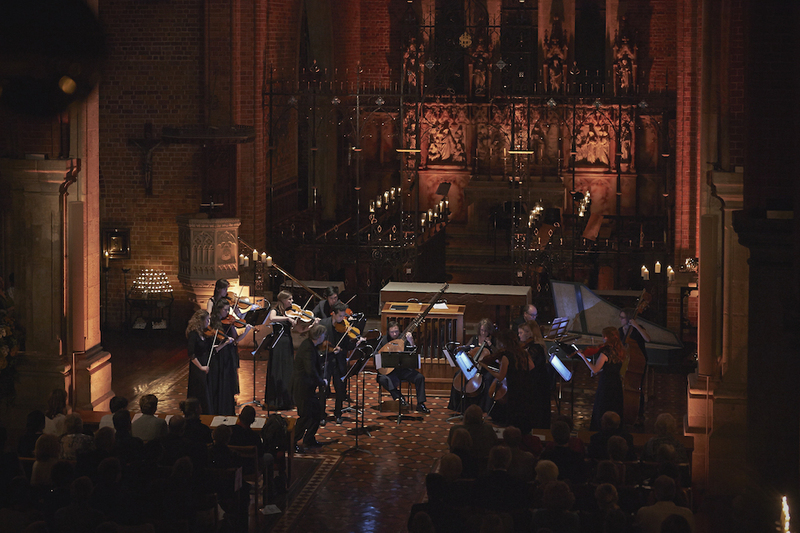 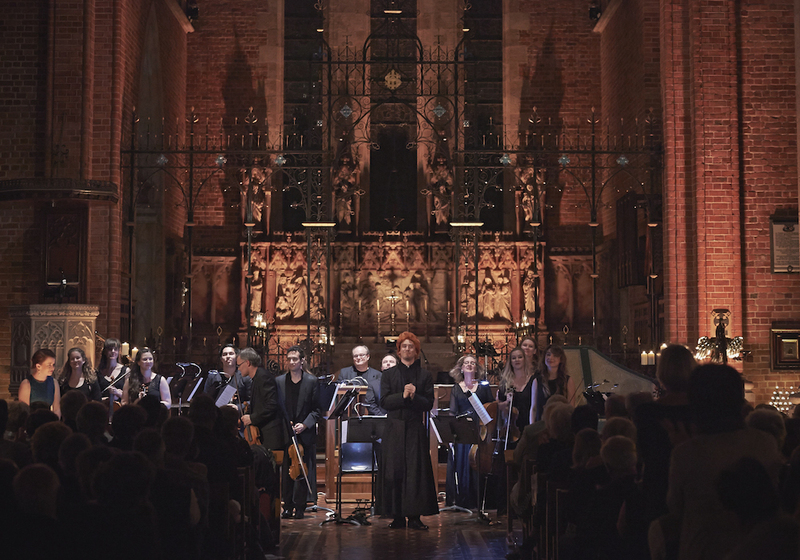 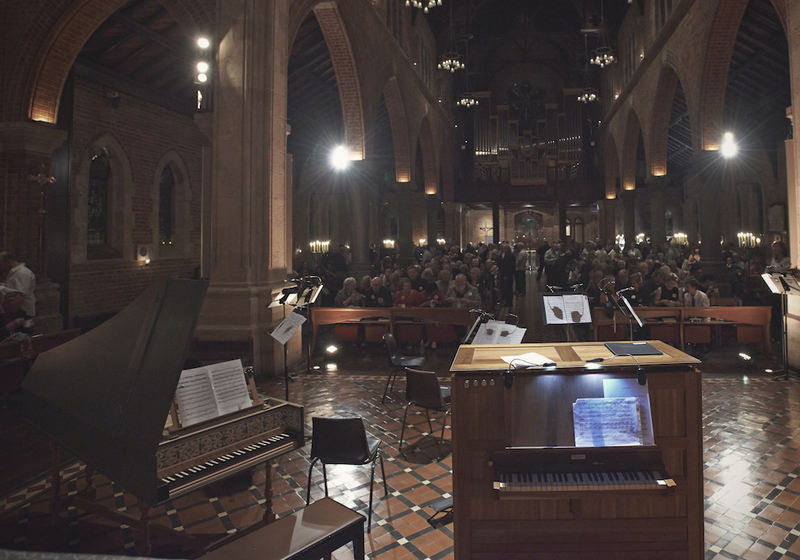 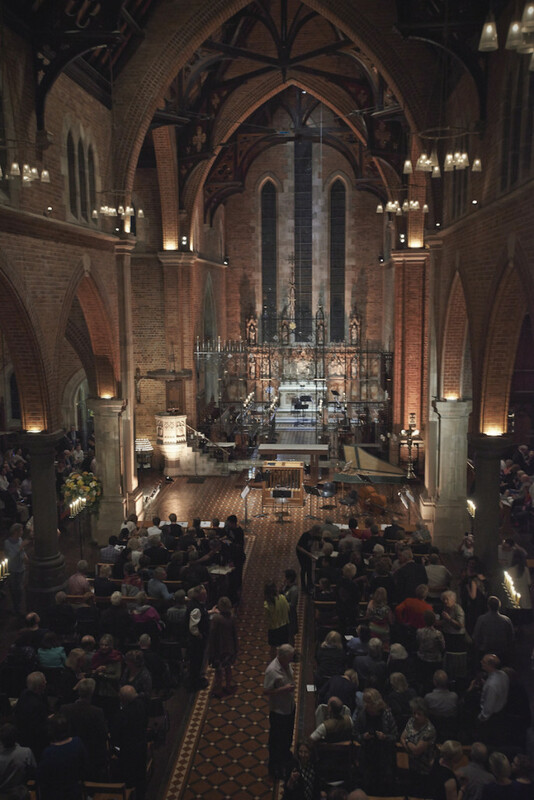 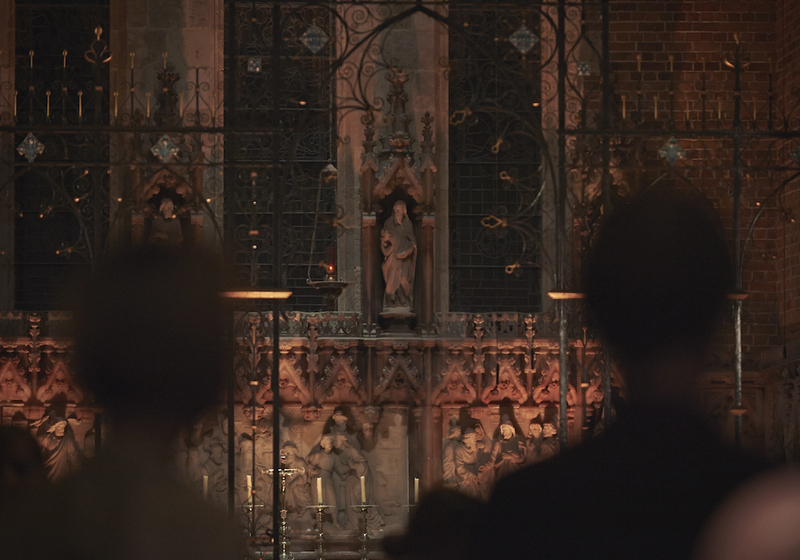 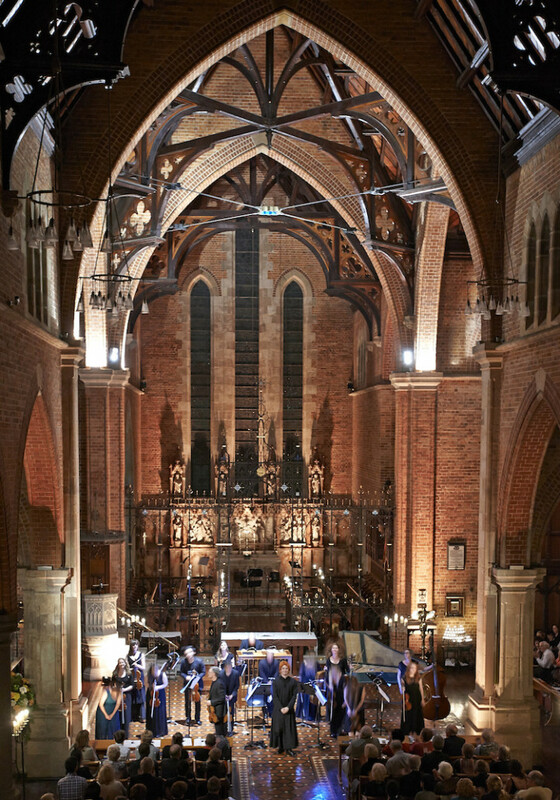 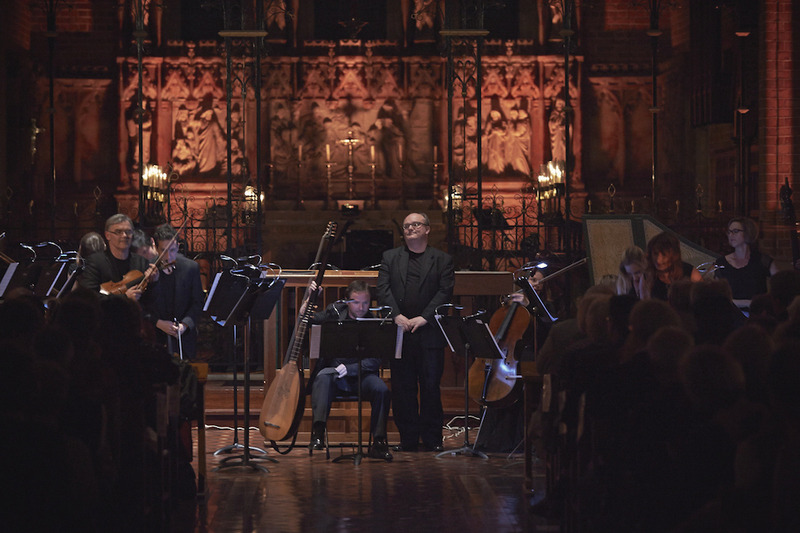 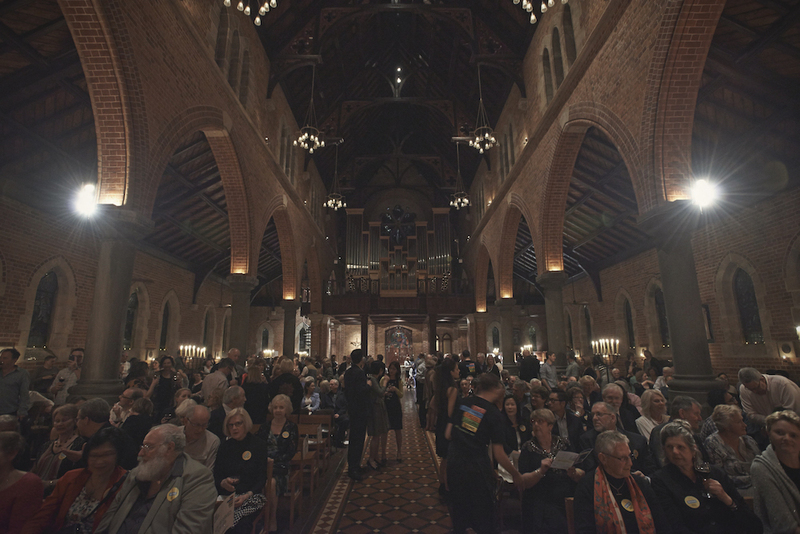 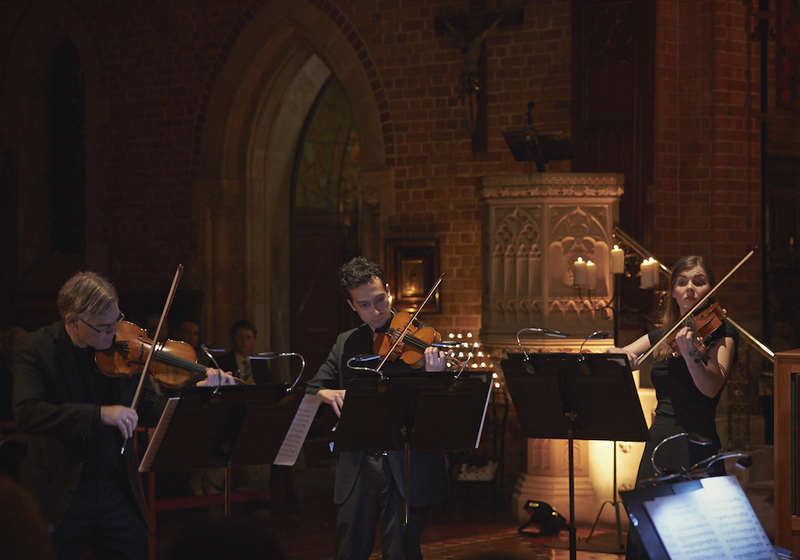 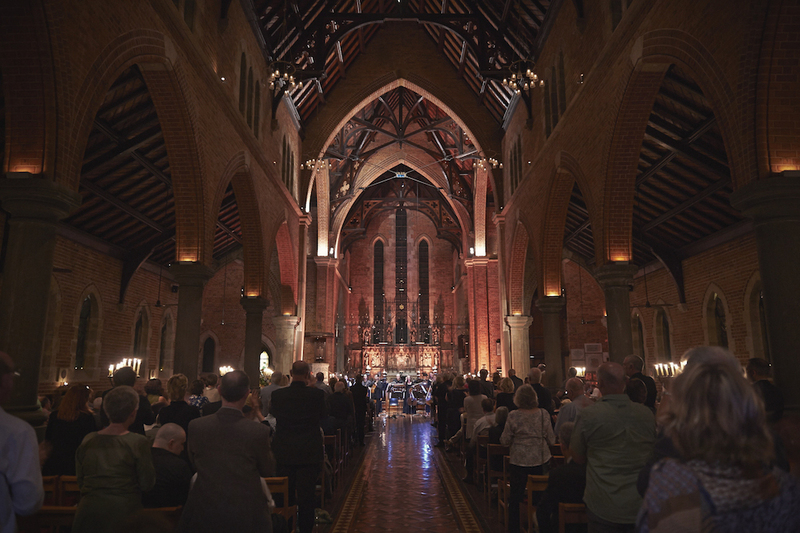 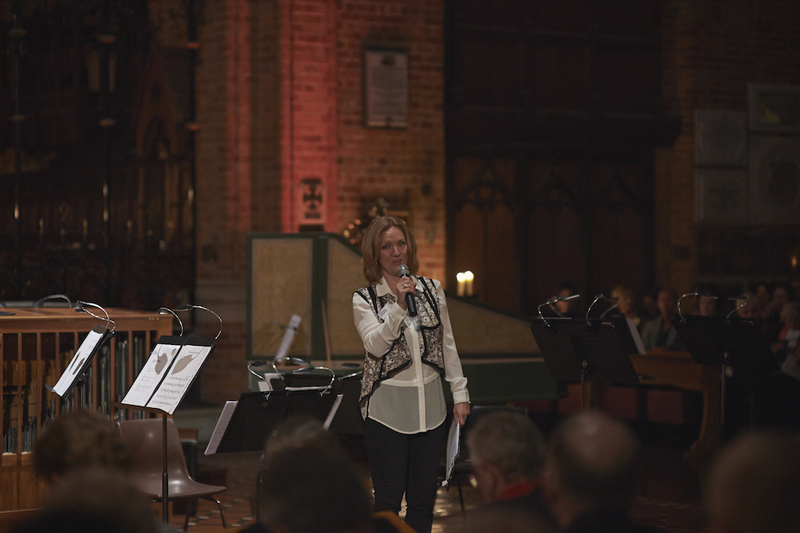 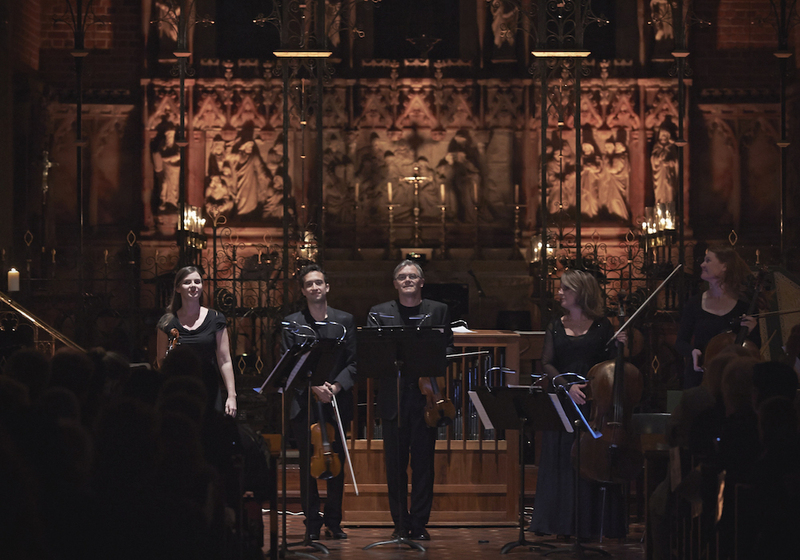 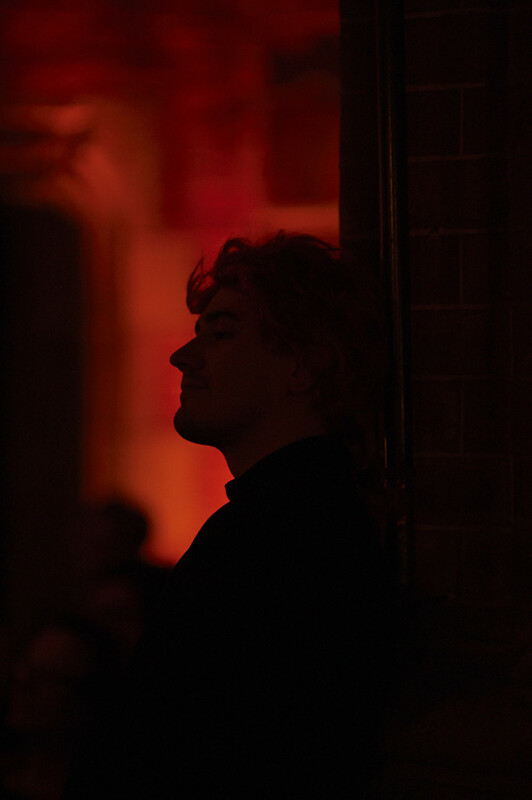 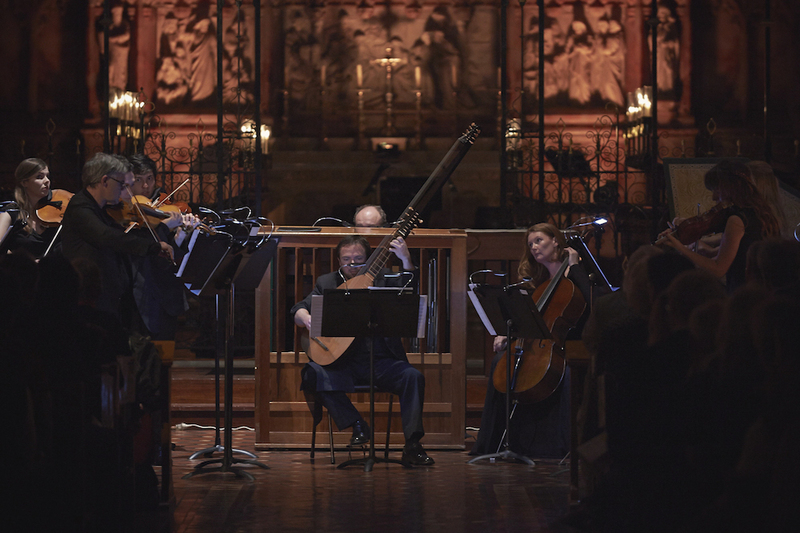 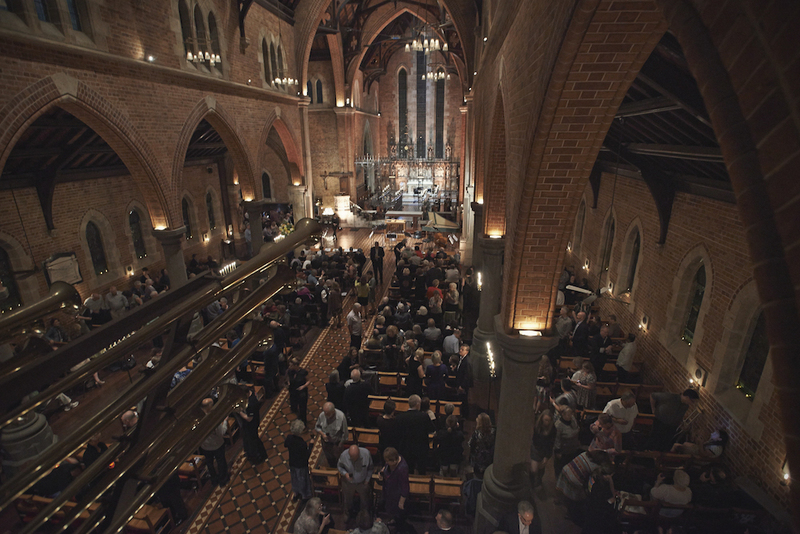 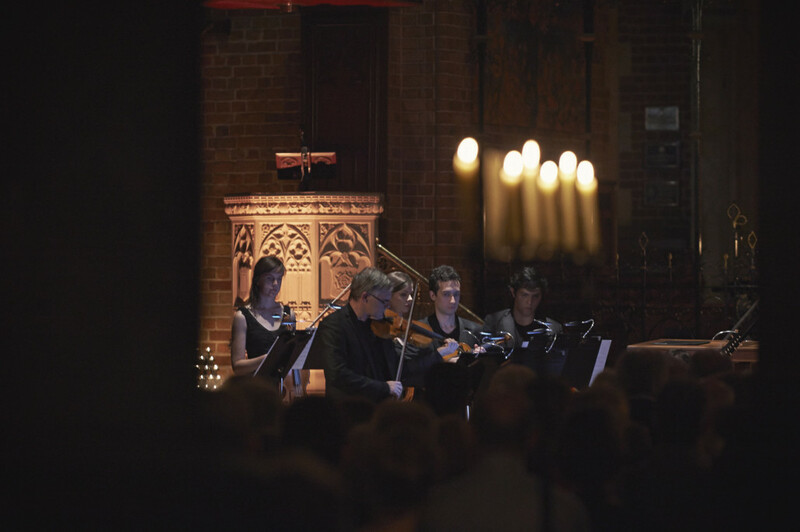 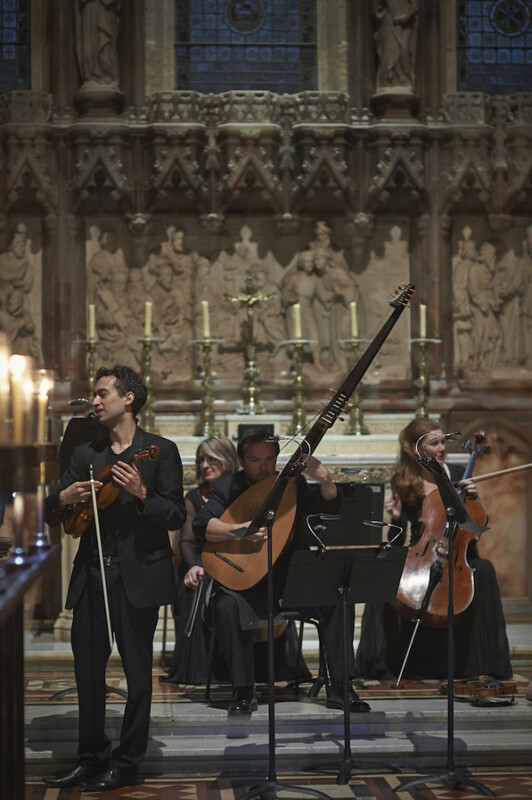 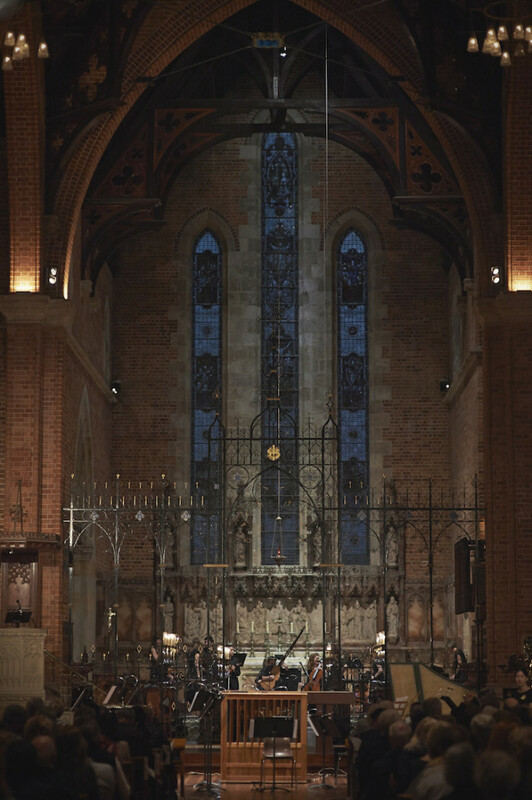 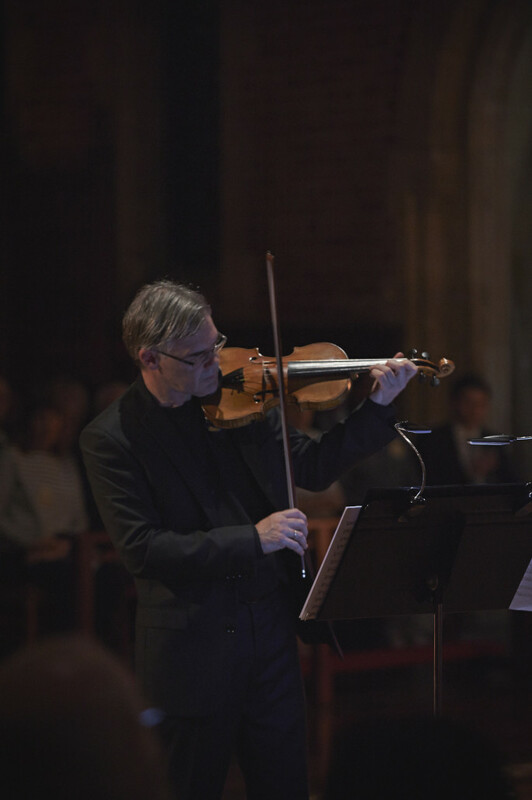 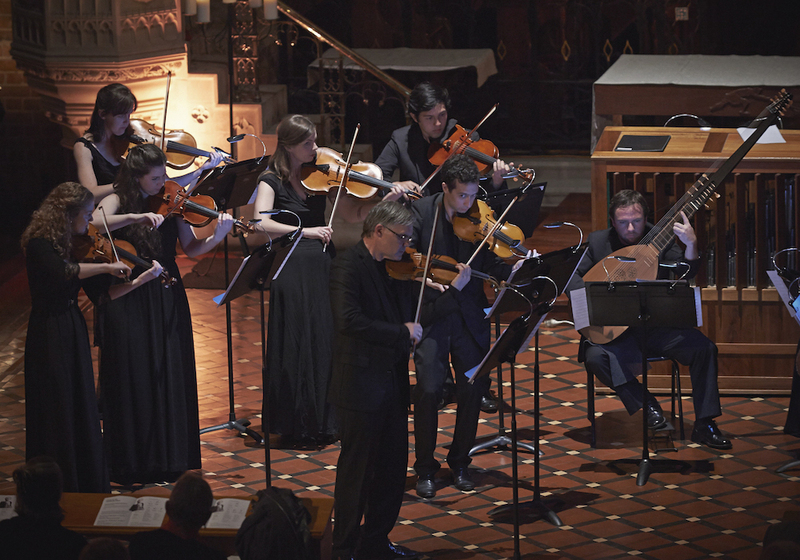 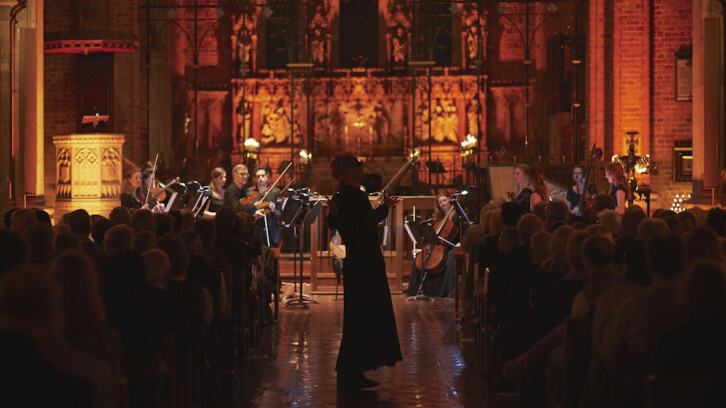 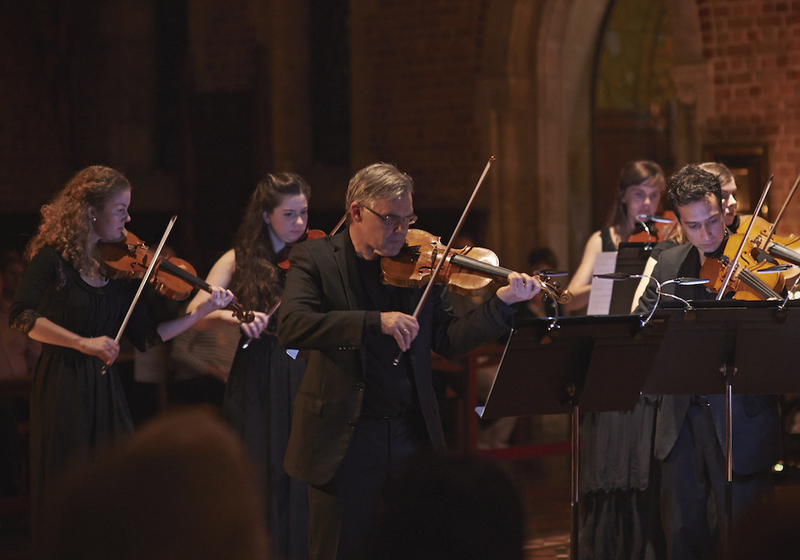 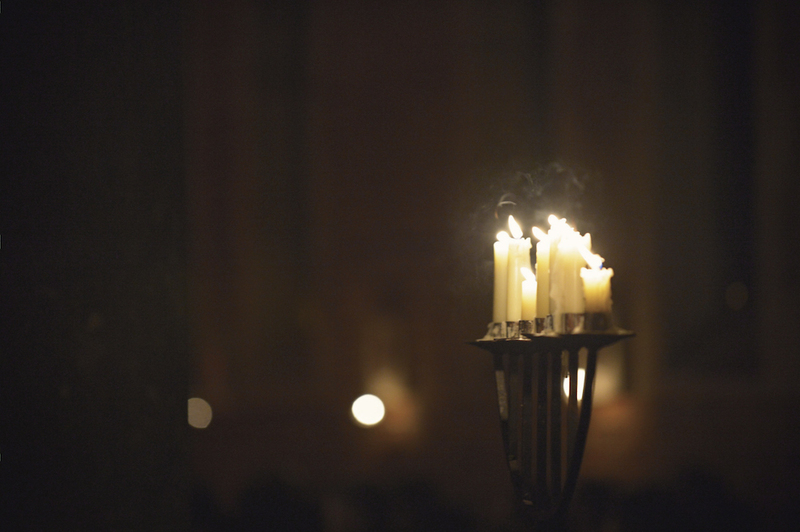 Performing to a capacity crowd at the beautiful St. George’s Cathedral, it was an incredible night with a unique program hand picked by Artistic Directors Paul Wright and Jessica Gethin and hosted by WA actor Nick Maclaine who brought the ghost of Vivaldi to life. 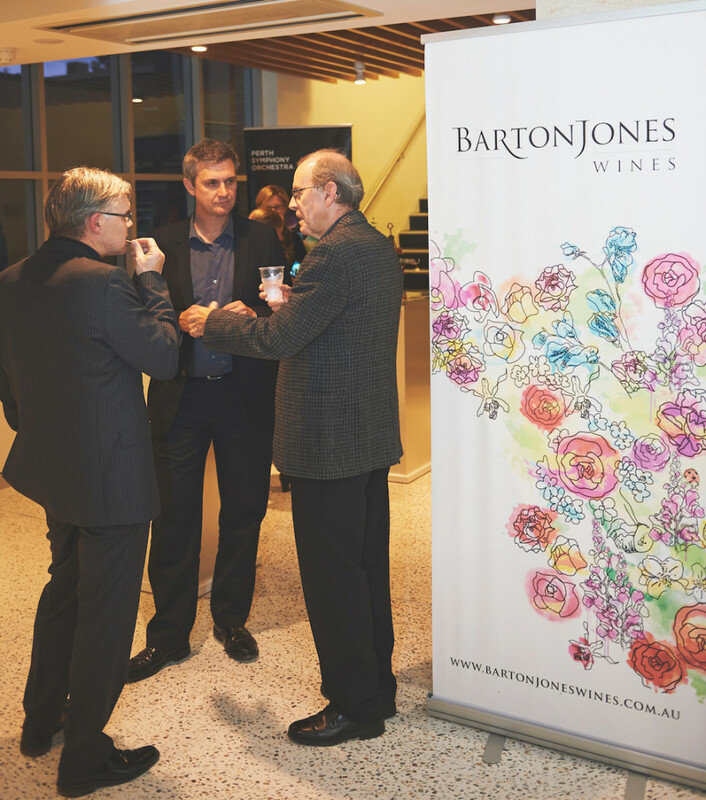 Thank you to Comestibles and Barton Jones Wines for the tasty food and delicious wines. 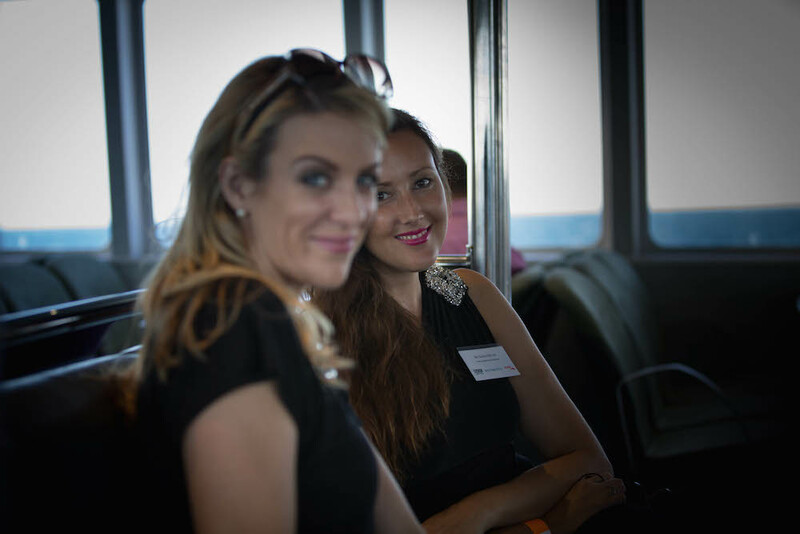 Photo credits – Richard Jefferson. 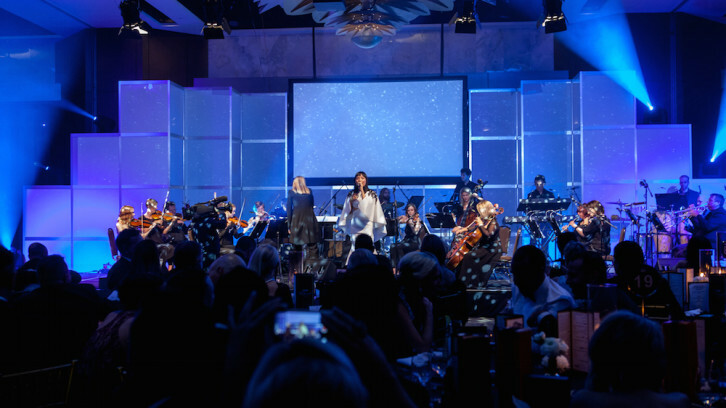 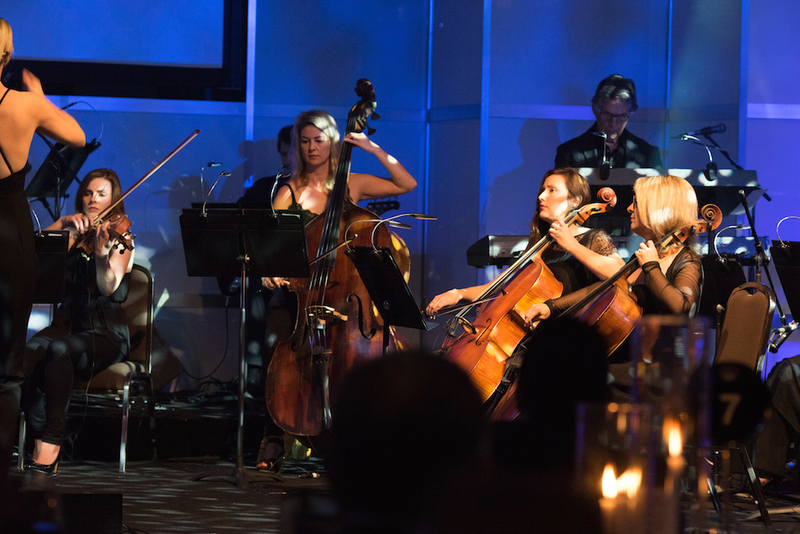 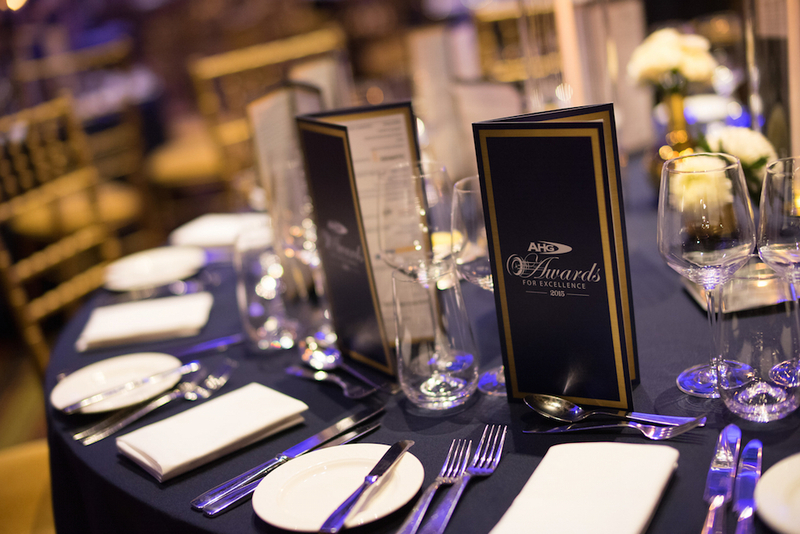 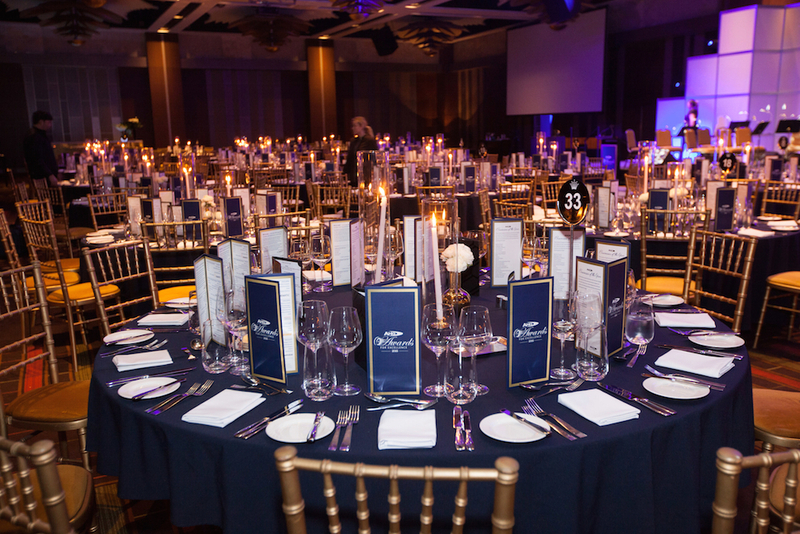 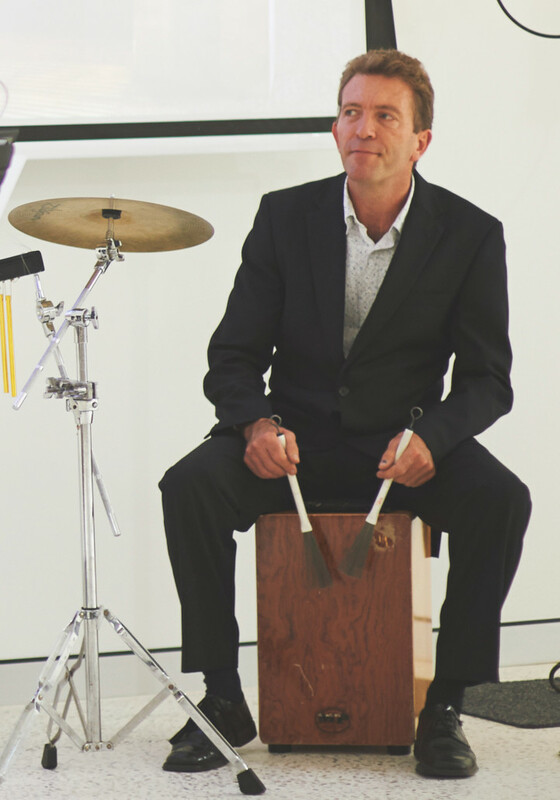 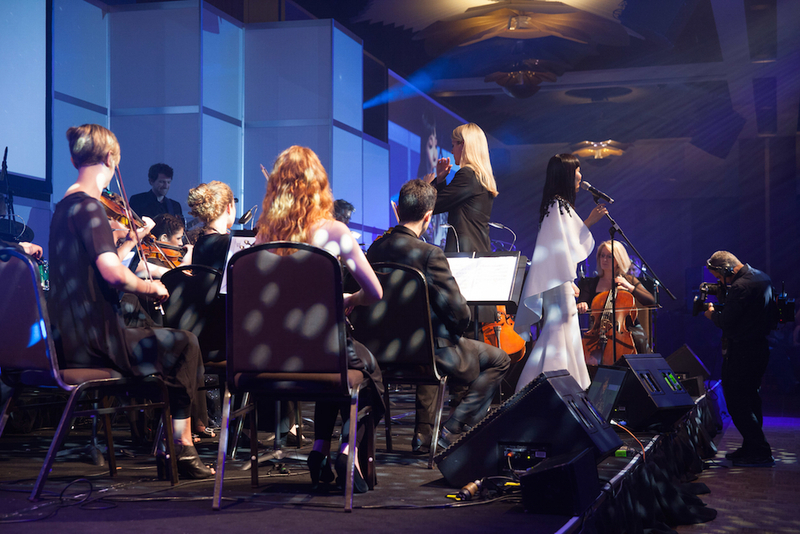 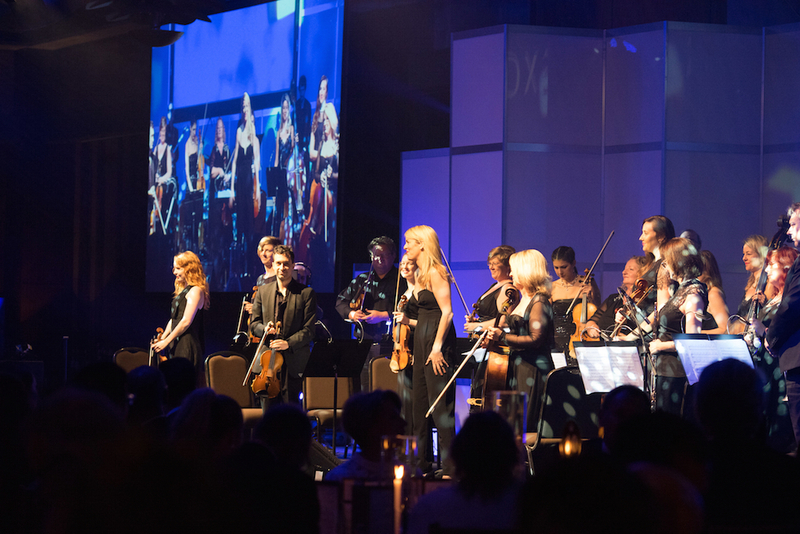 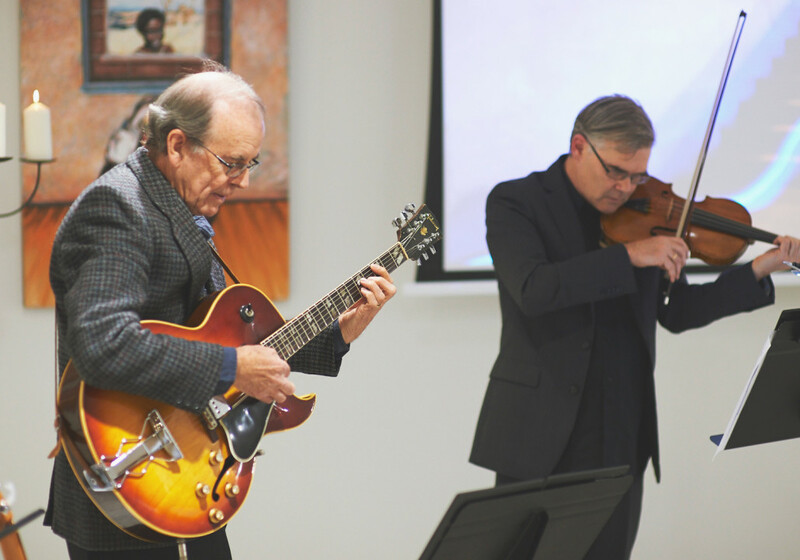 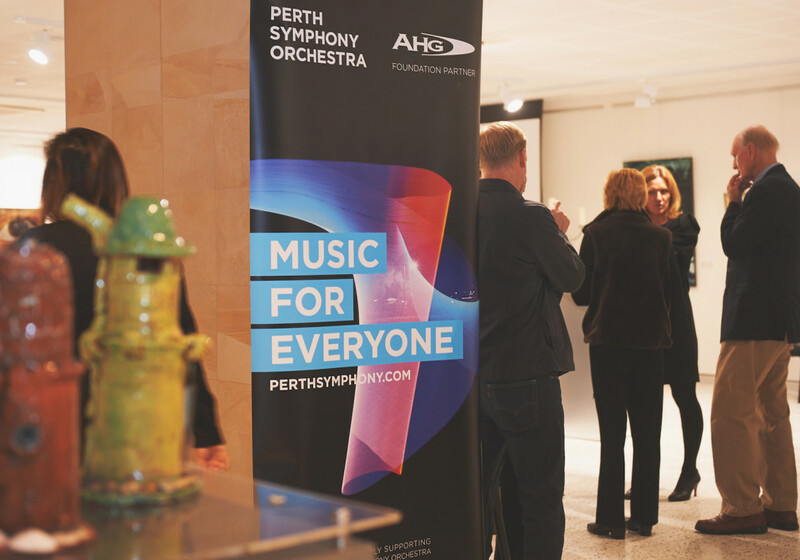 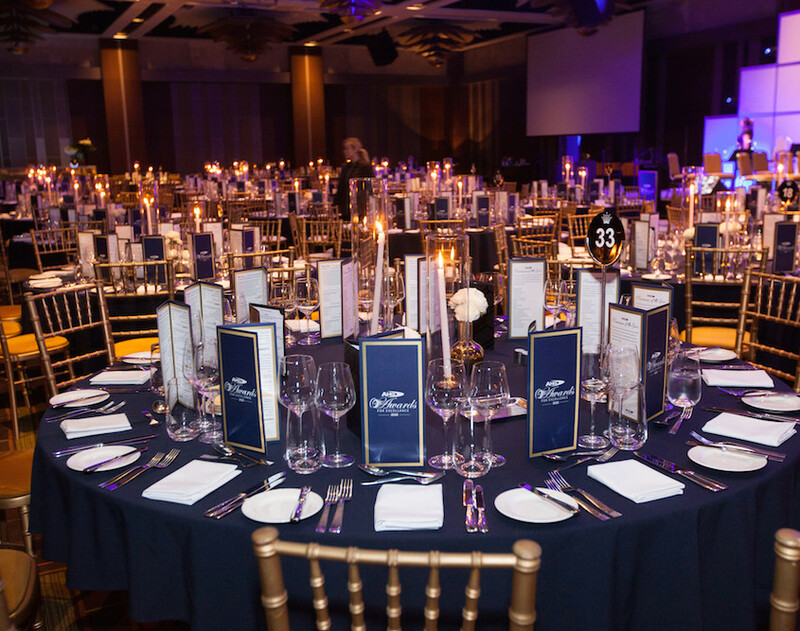 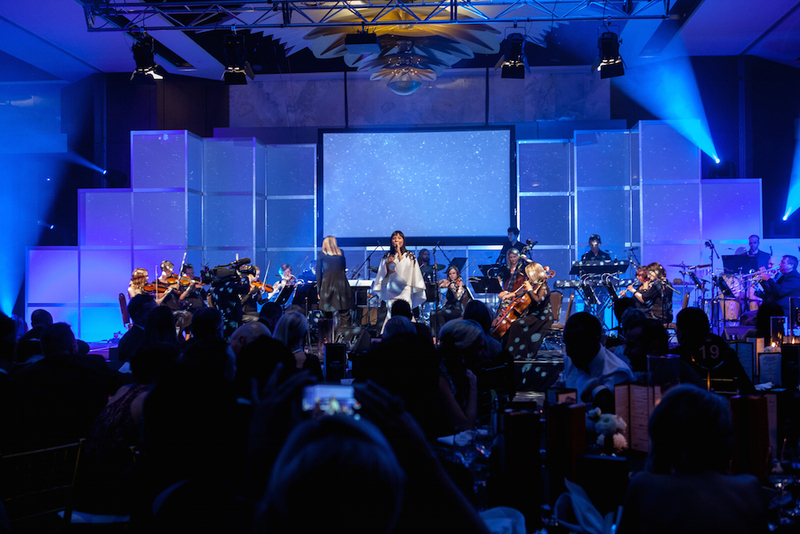 Perth Symphony was honoured to perform at Foundation Partner – AHG’s annual Awards for Excellence 2015. 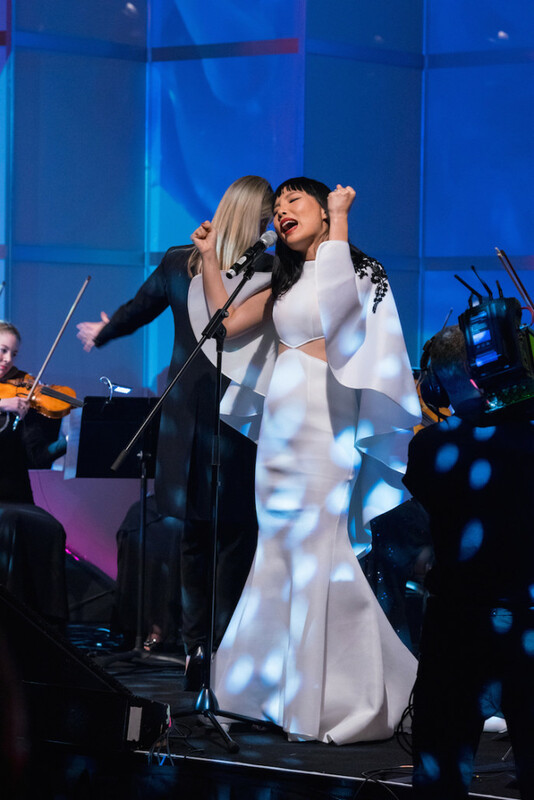 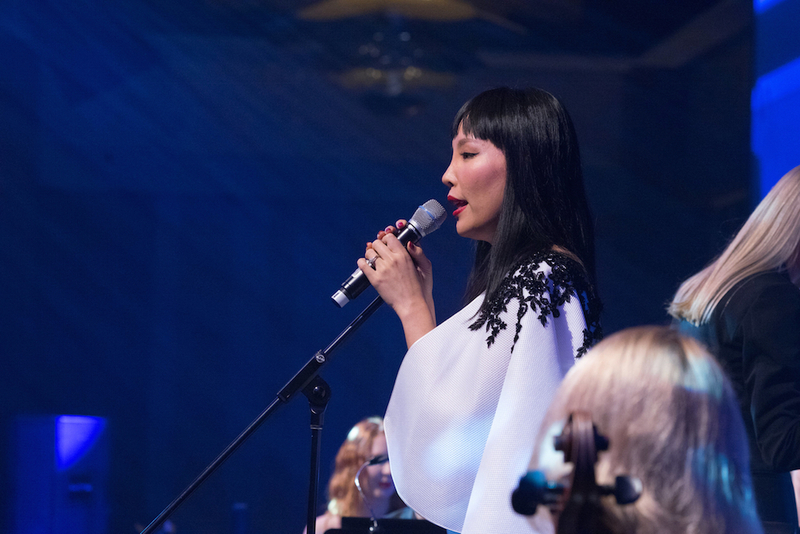 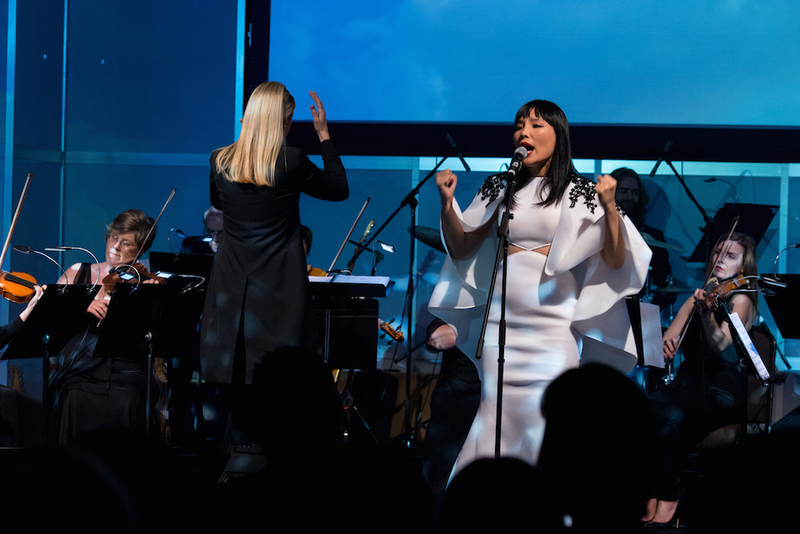 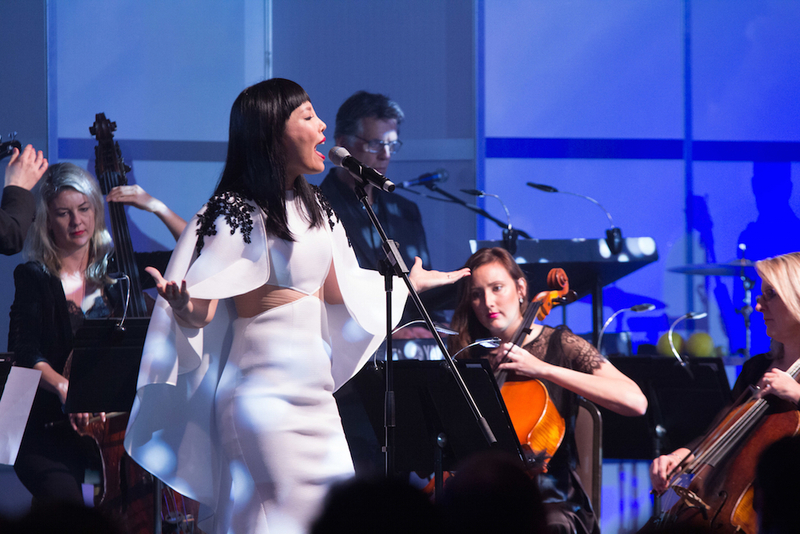 Opening with a Bond-esque style opening, followed by a feature set with 2013 X Factor winner – Dami Im. 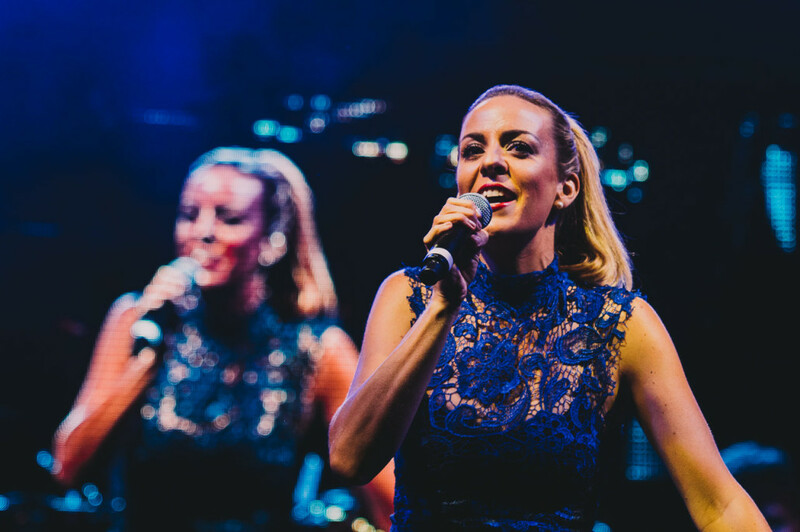 What a voice! 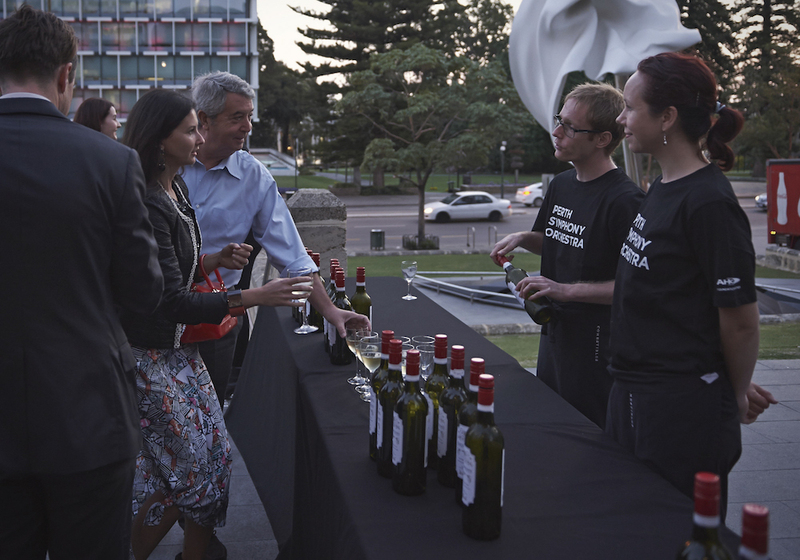 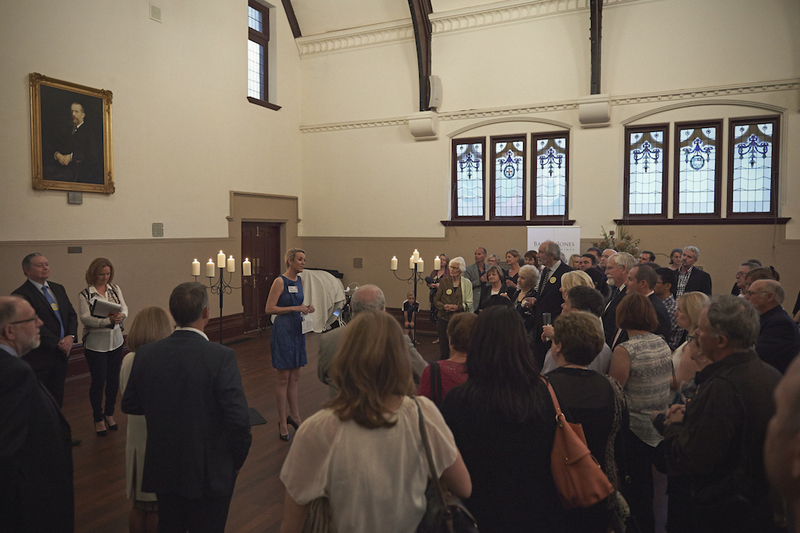 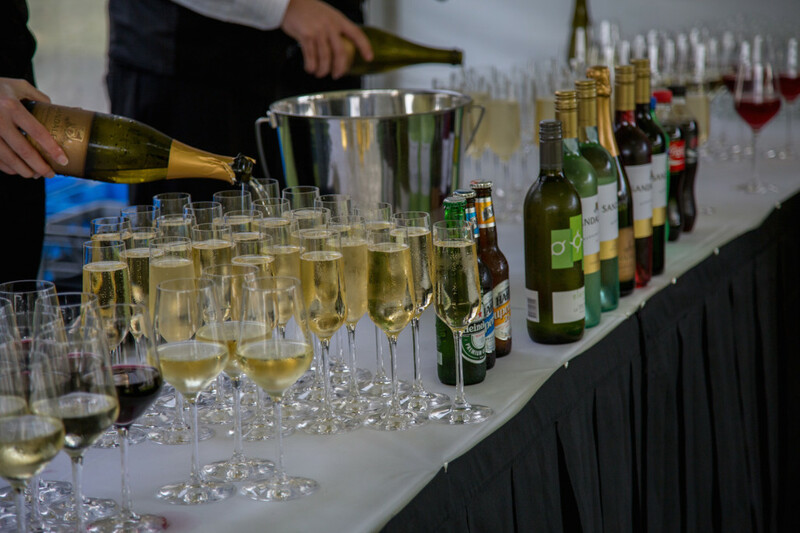 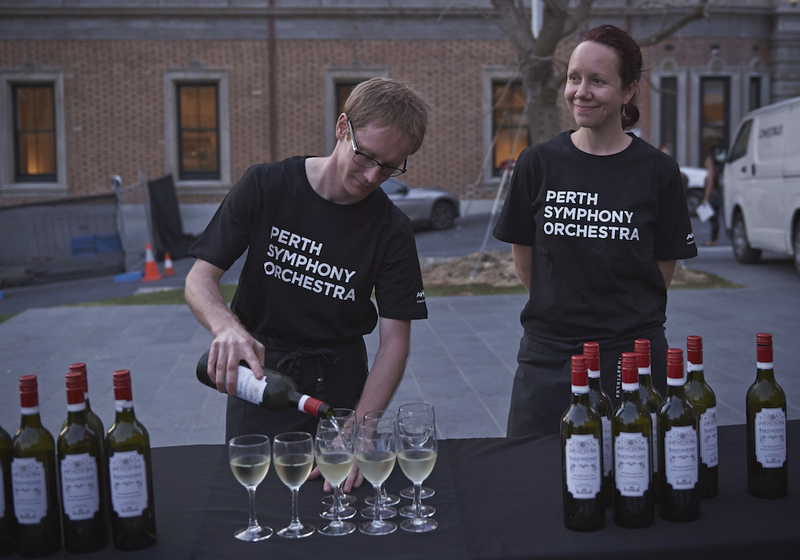 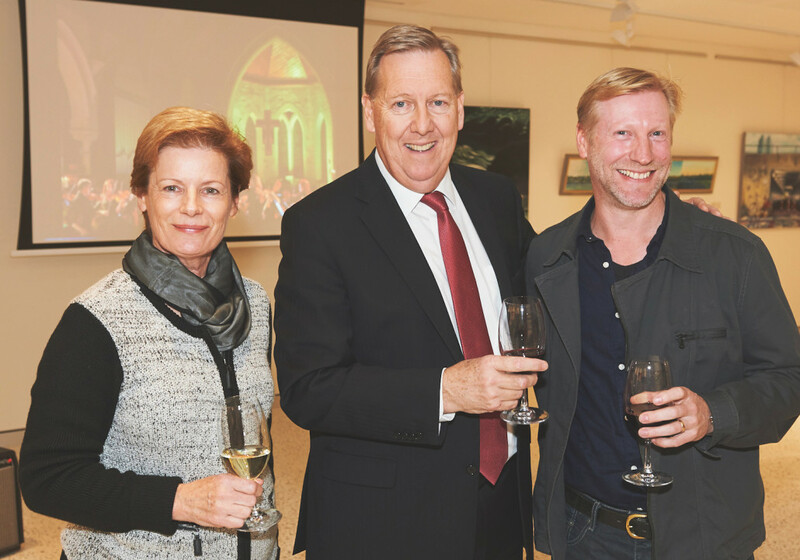 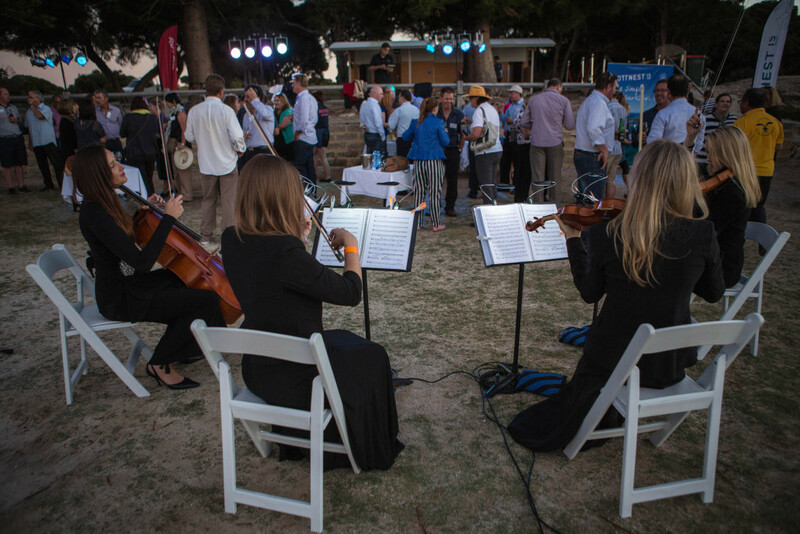 Perth Symphony organised a Thank You Sundowner to show our appreciation to those who had donated to the orchestra over the past financial year. 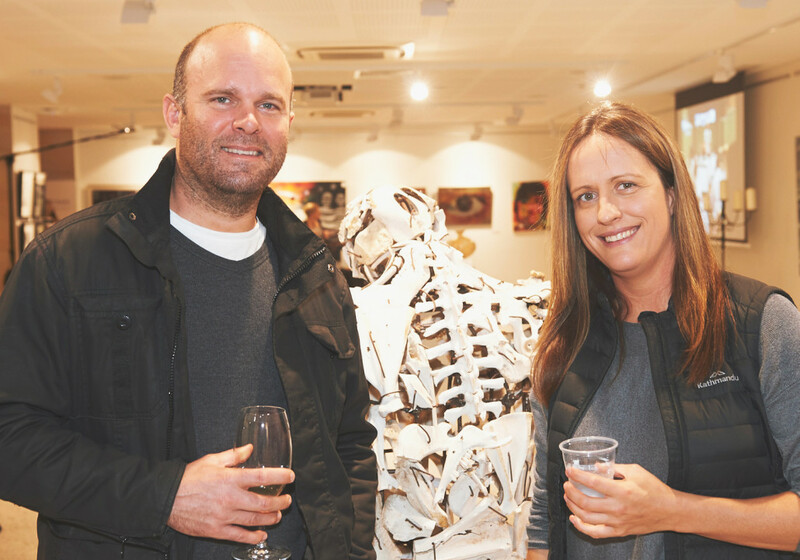 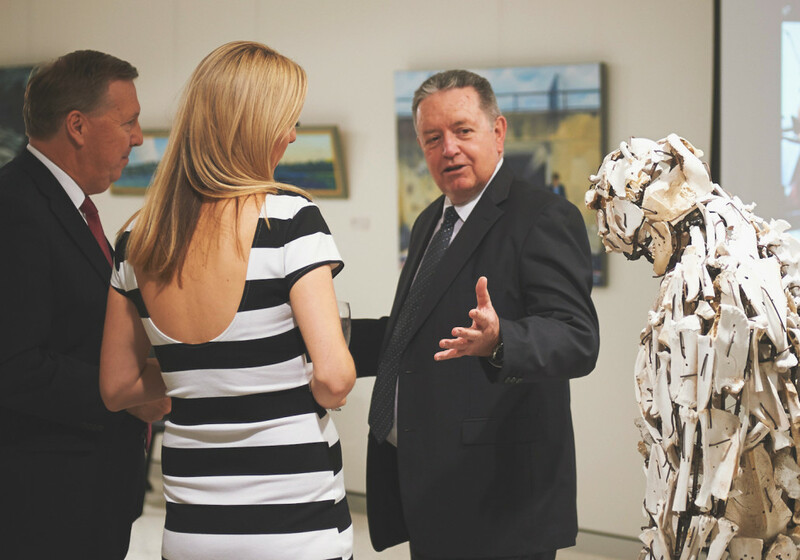 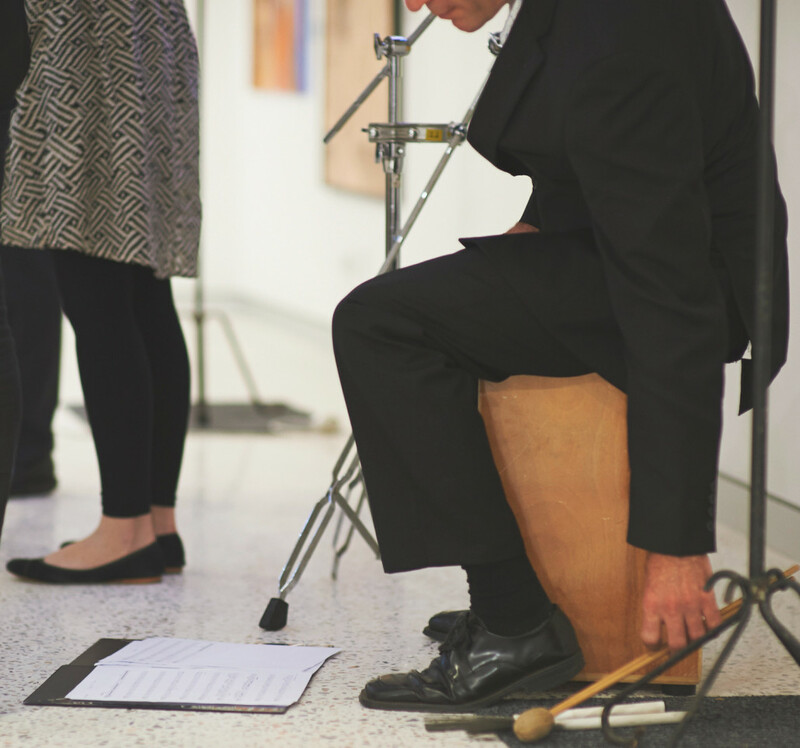 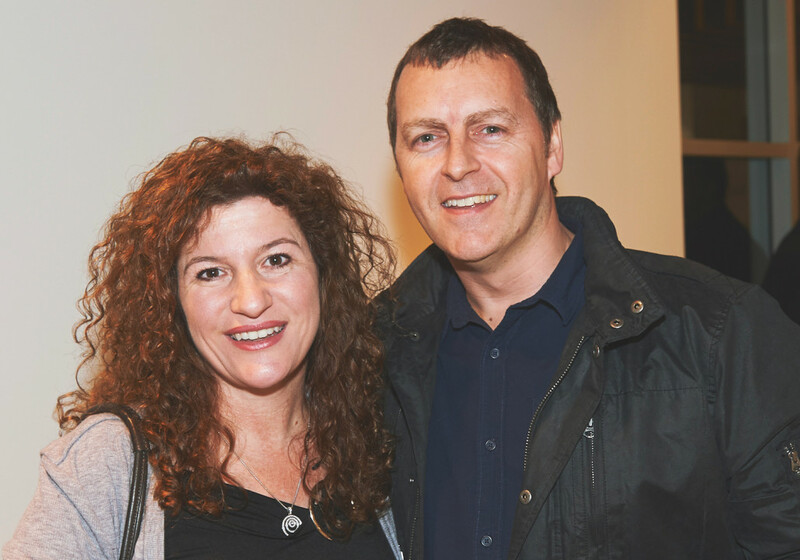 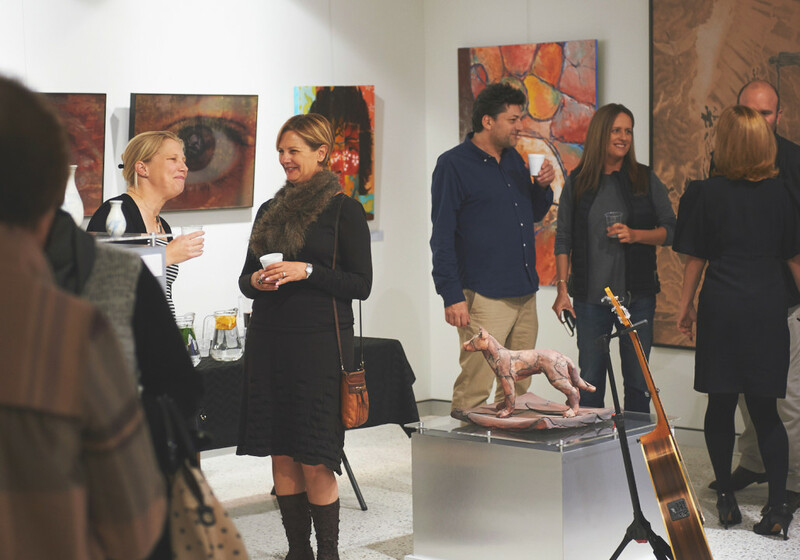 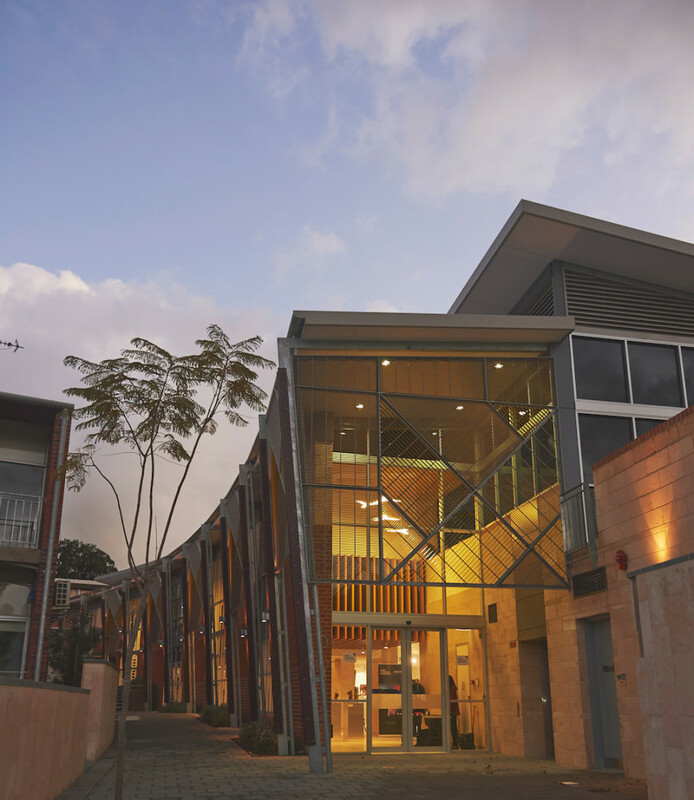 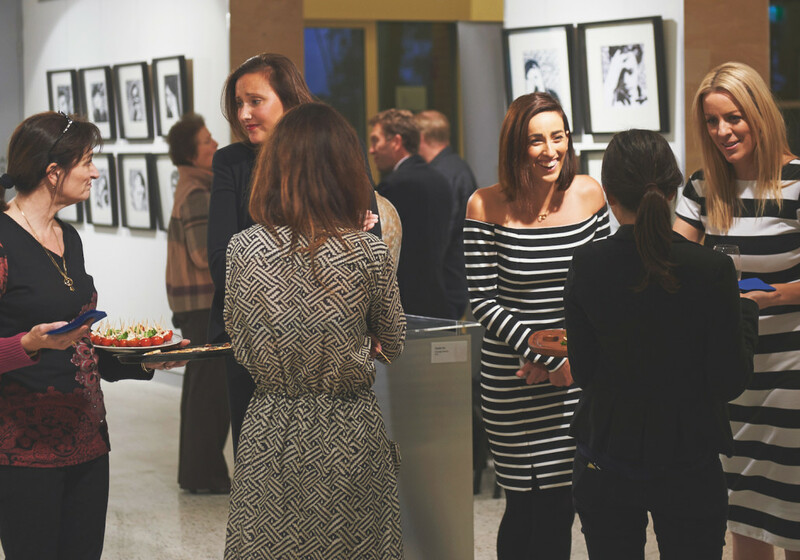 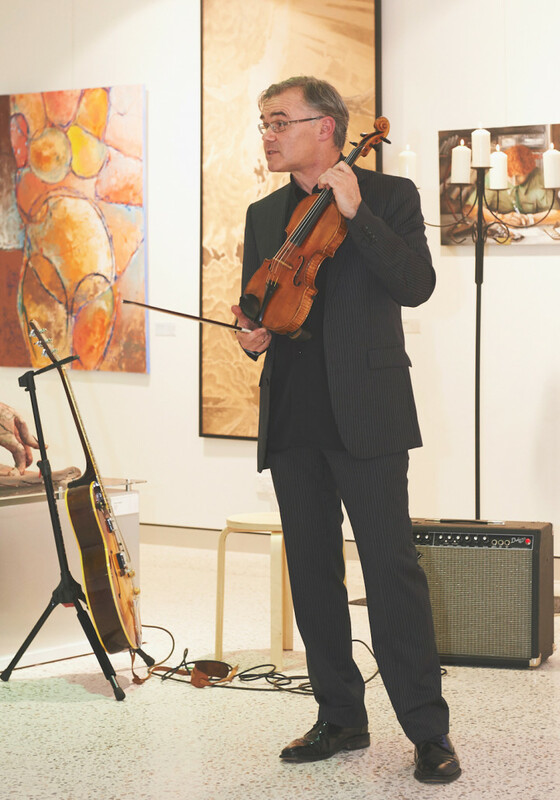 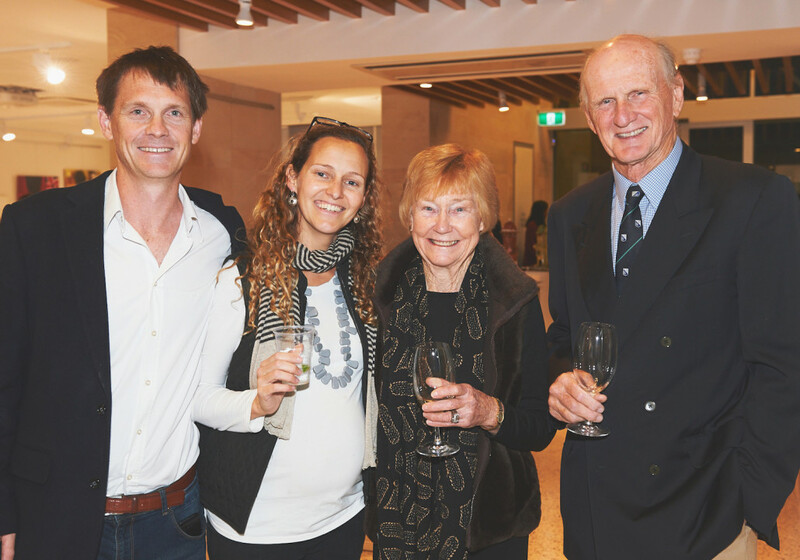 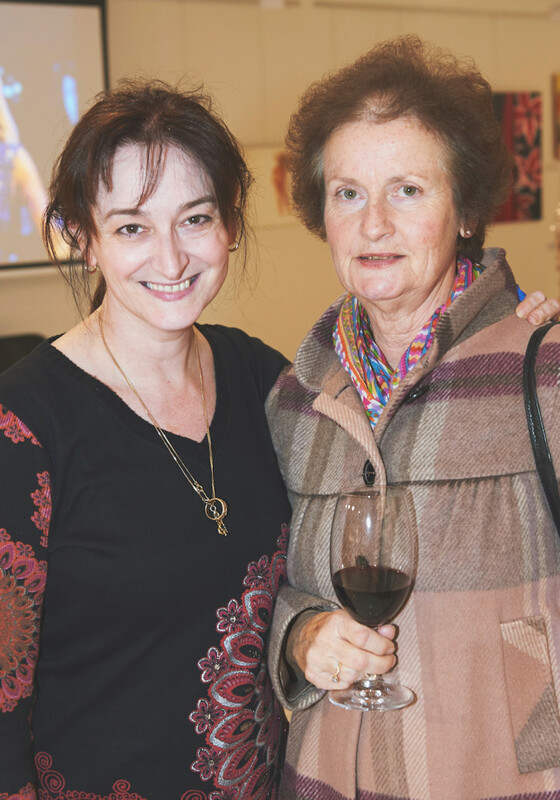 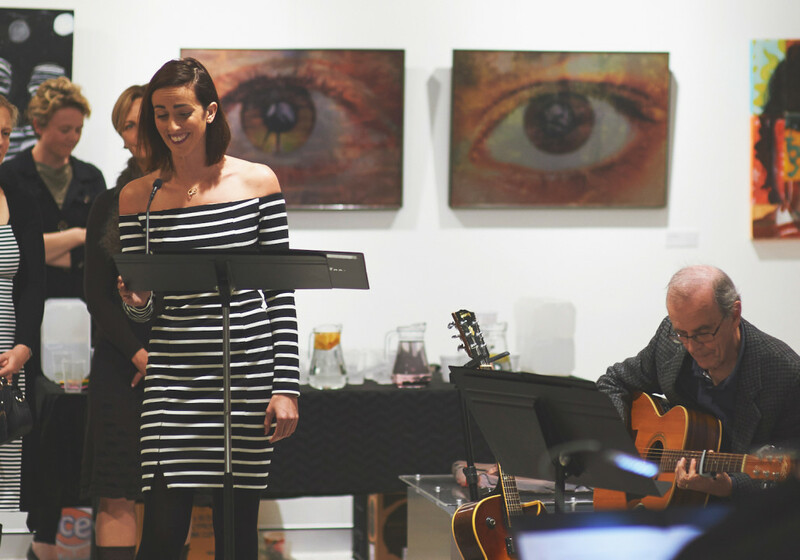 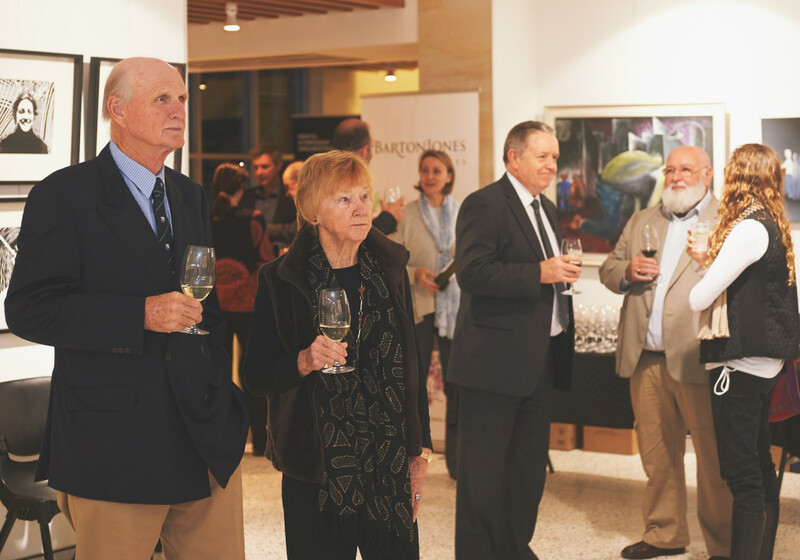 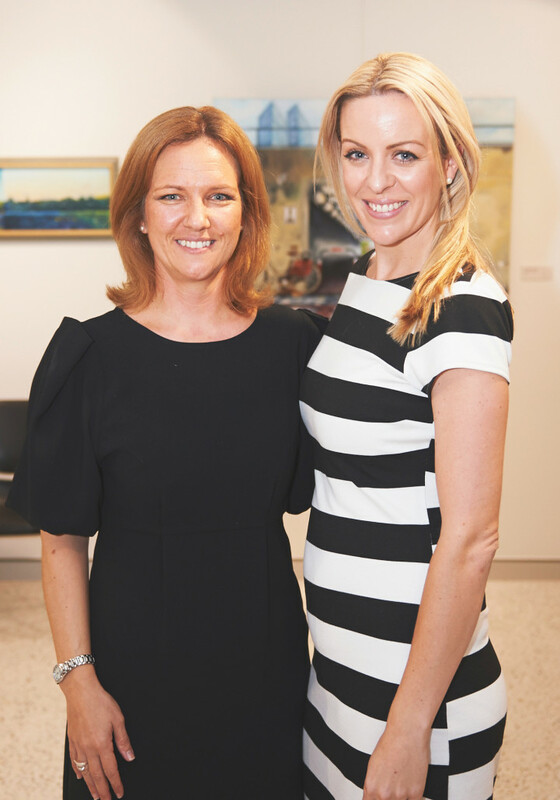 It was a lovely, intimate night at the brand new Middle School Arts Gallery at Scotch College. 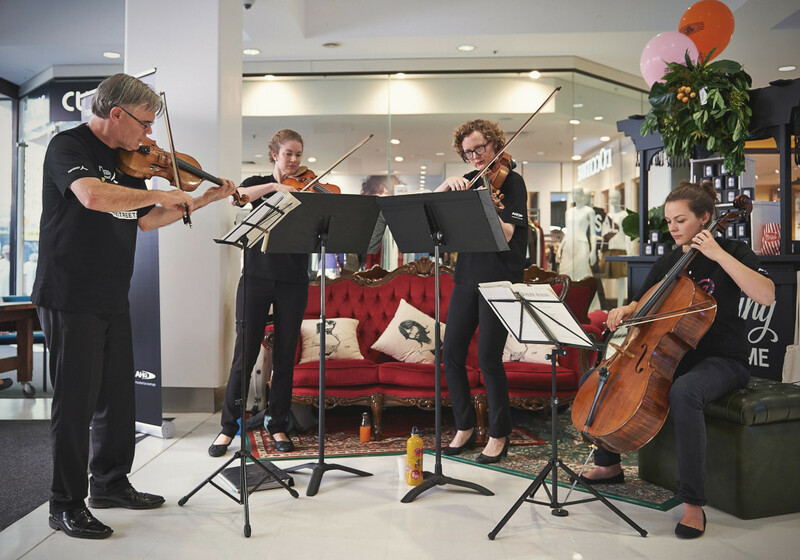 A ‘surprise’ musical feature took us on a journey from classical music to jazz, through contemporary and ending again with a stunning Vivaldi string quartet. 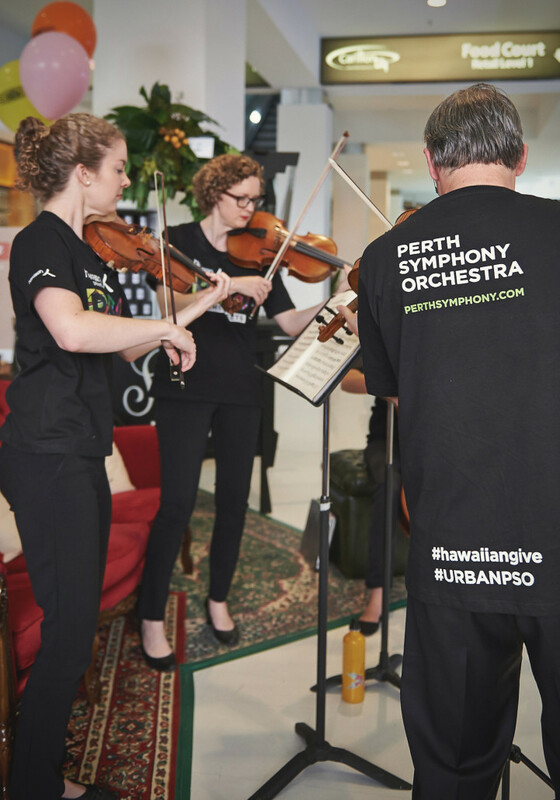 Thank you to Paul Wright, Kathryn Shinnick, Katie McKay, Sacha McCulloch, Paul Tanner, Ray Walker and Chris Goff who performed on behalf of Perth Symphony, with special guest soprano – Emma Pettemerides. 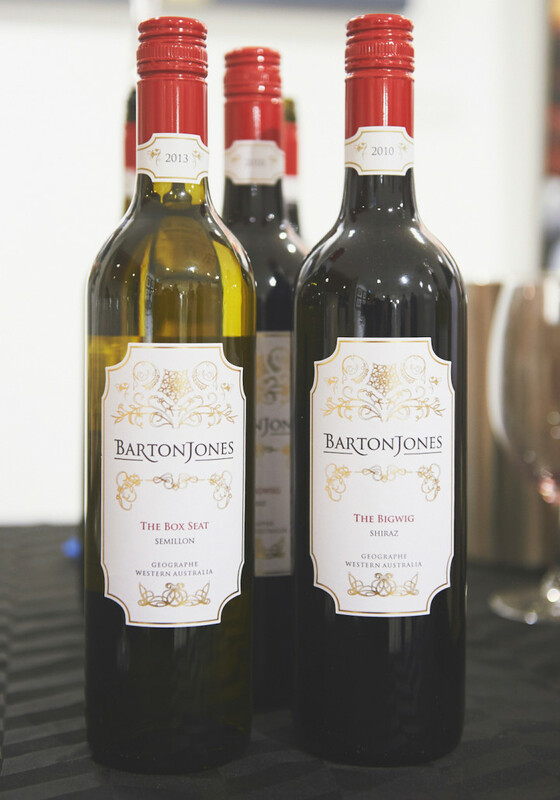 Photo credits: Richard Jefferson Photography. 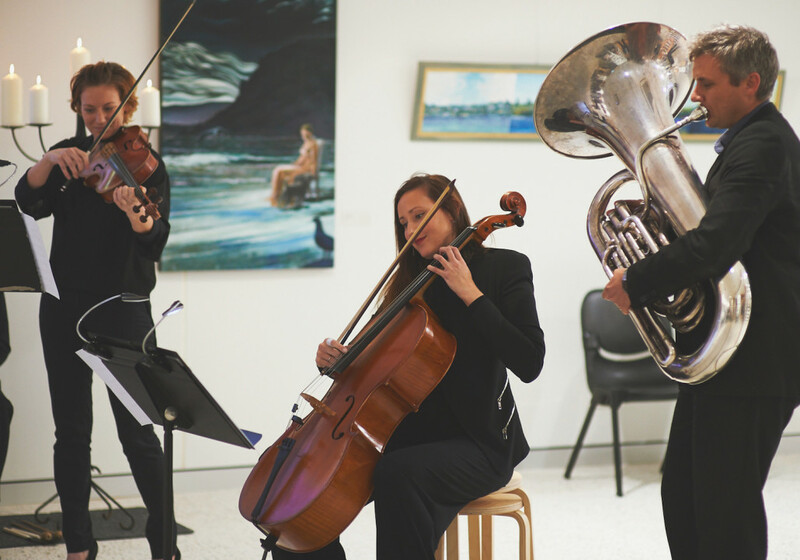 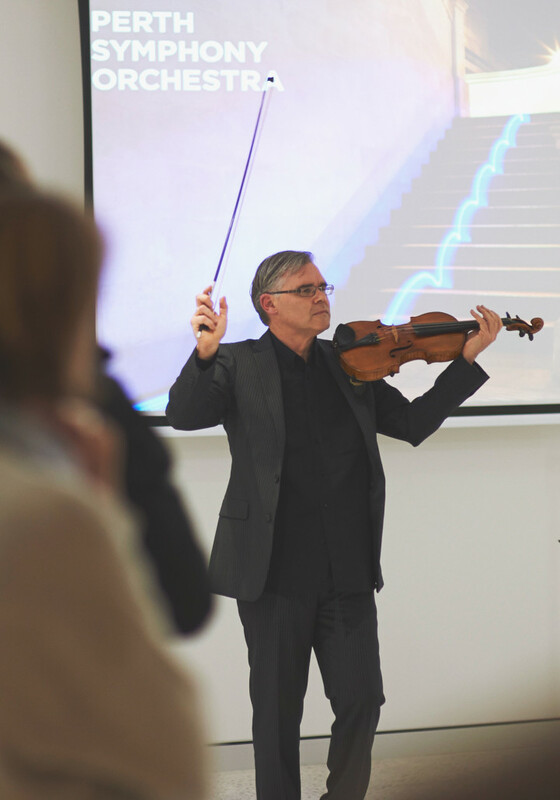 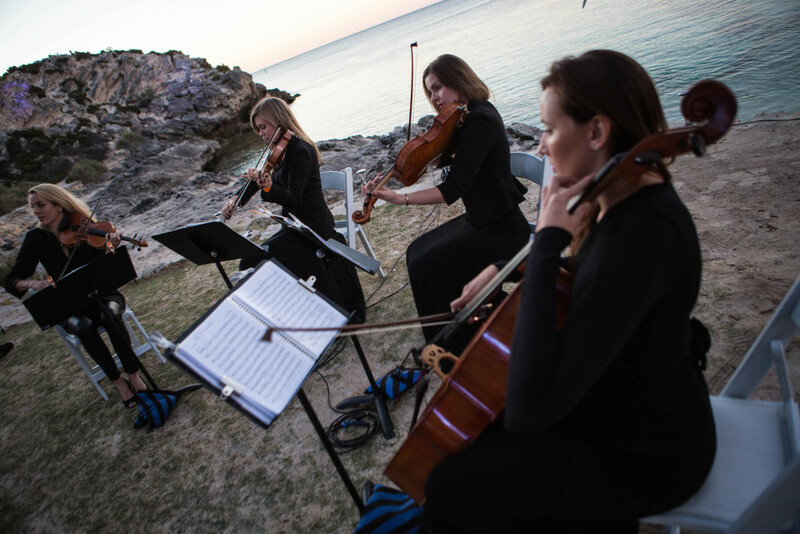 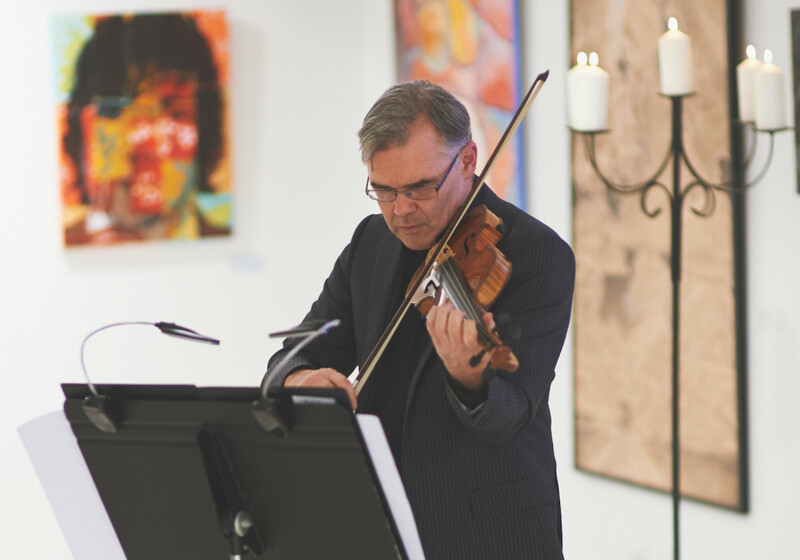 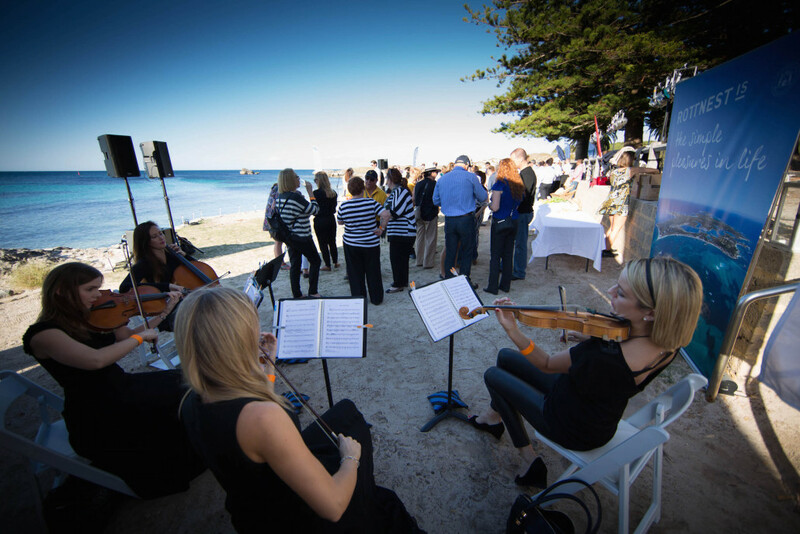 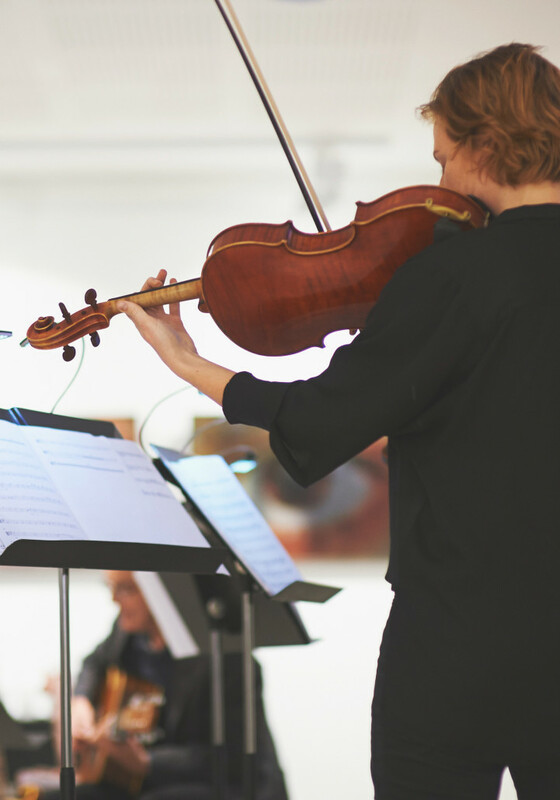 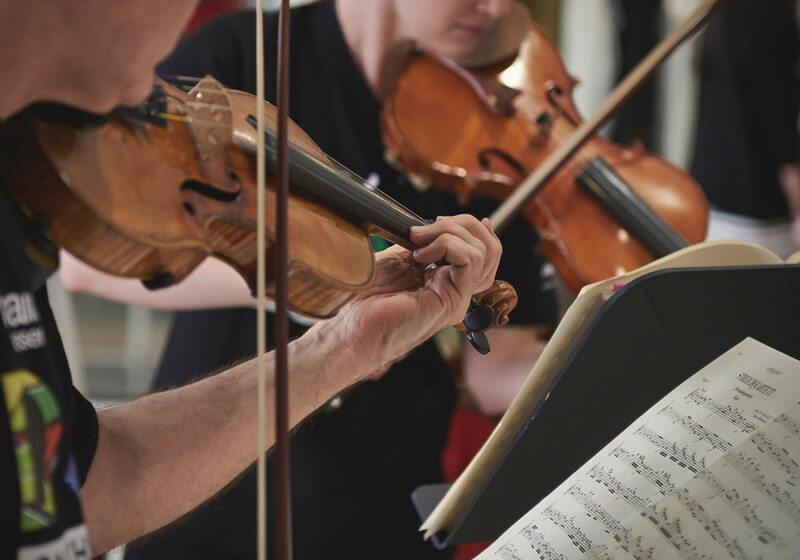 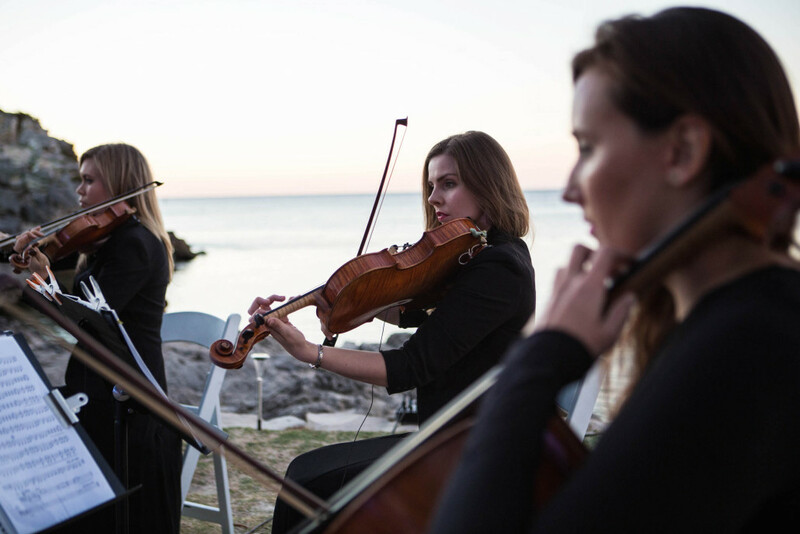 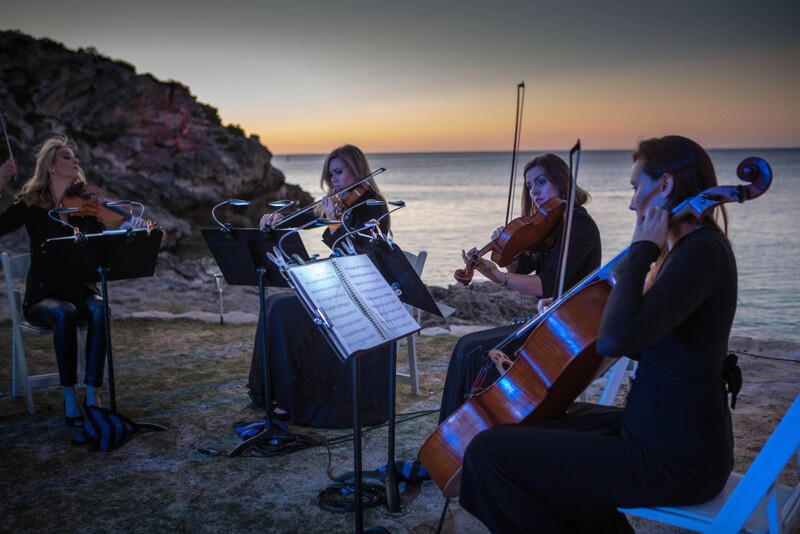 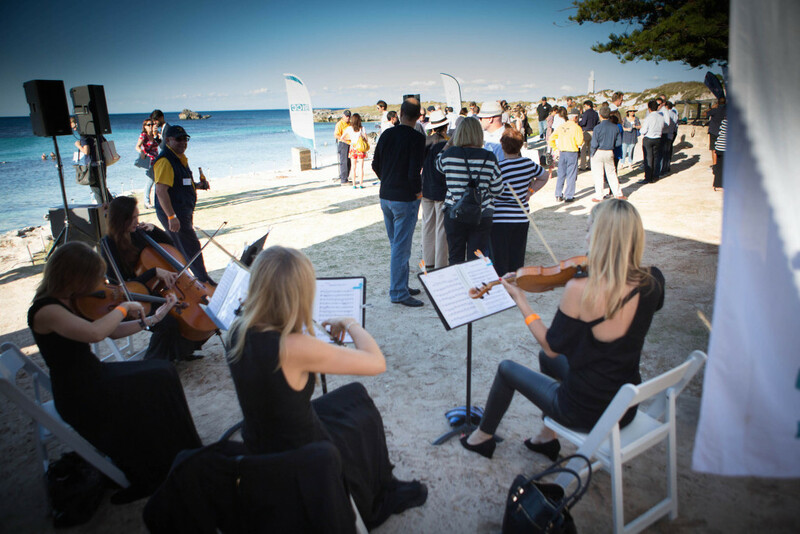 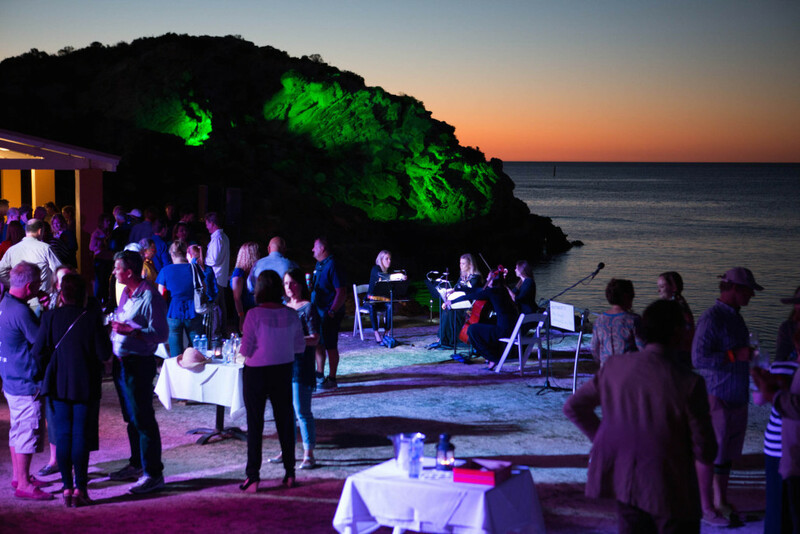 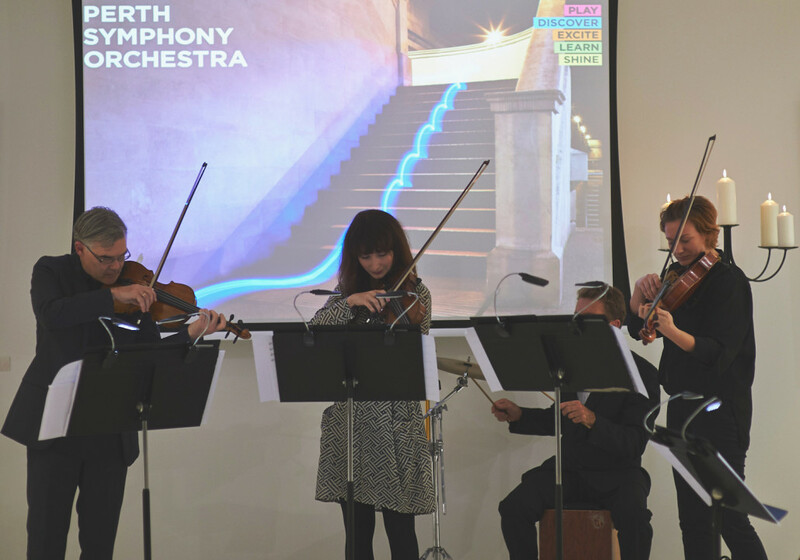 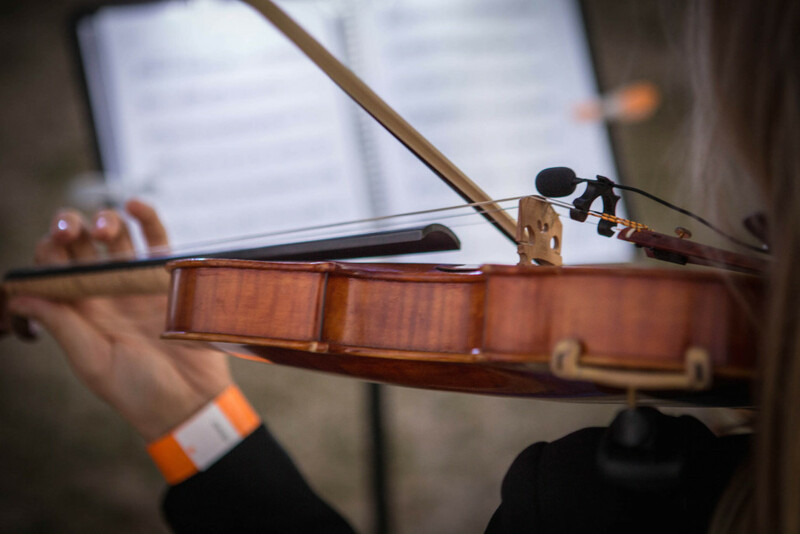 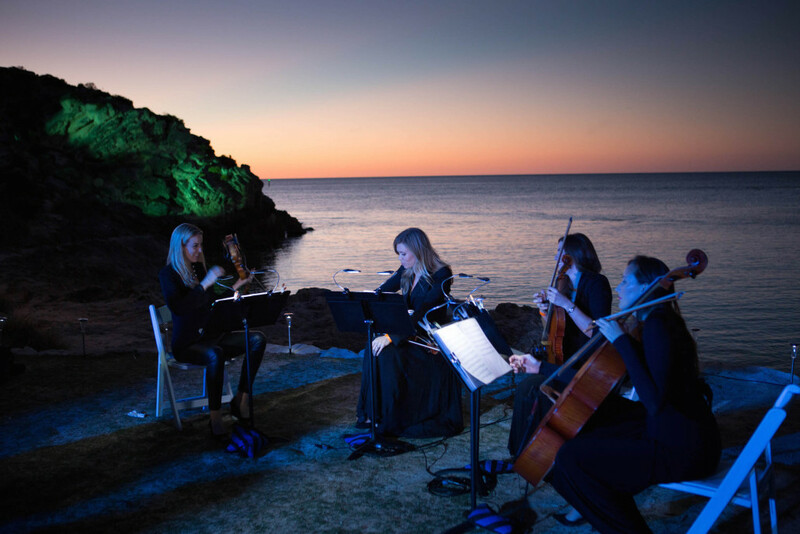 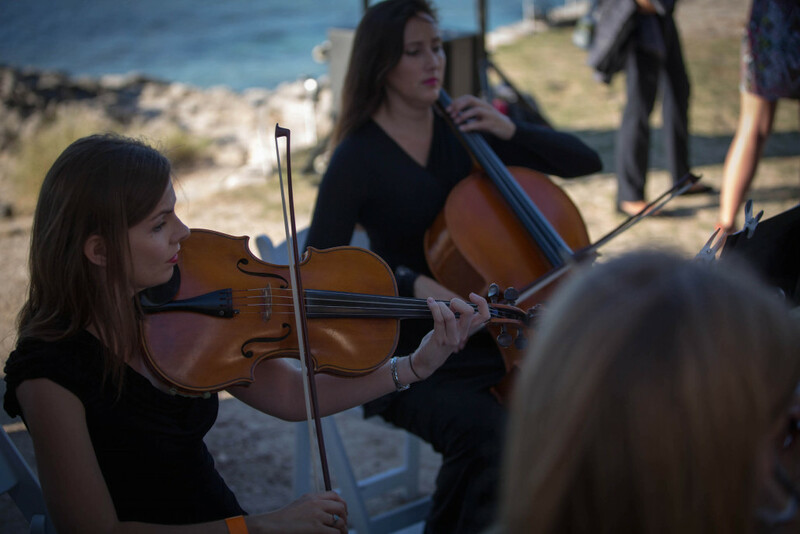 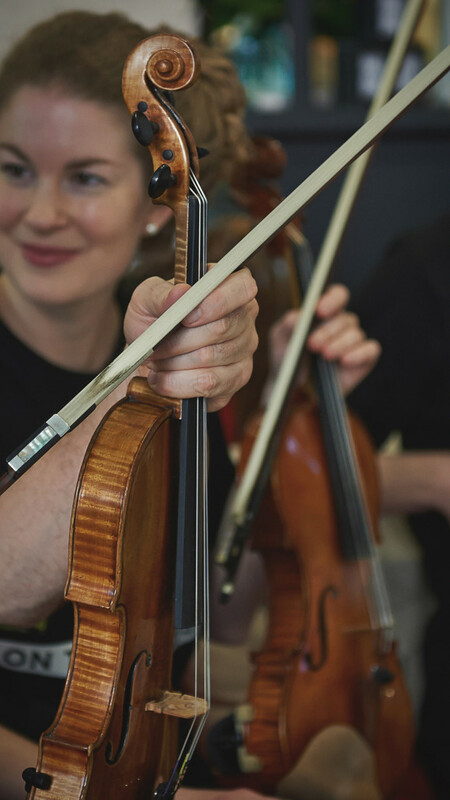 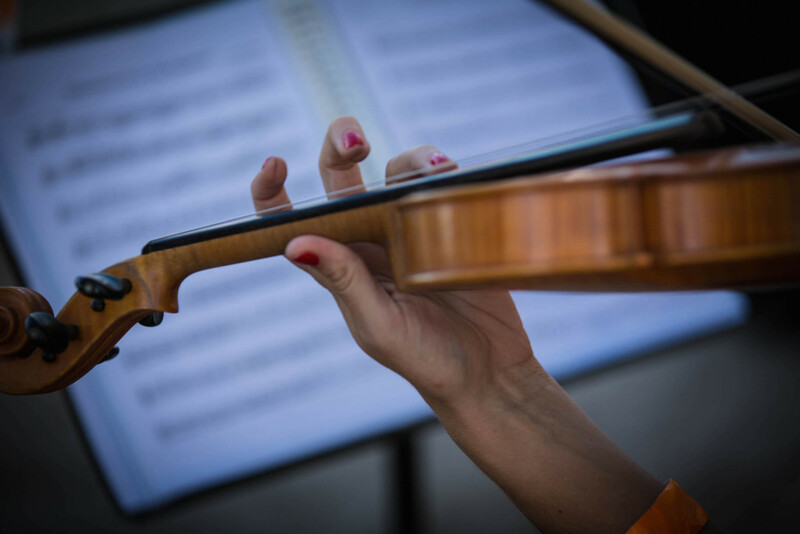 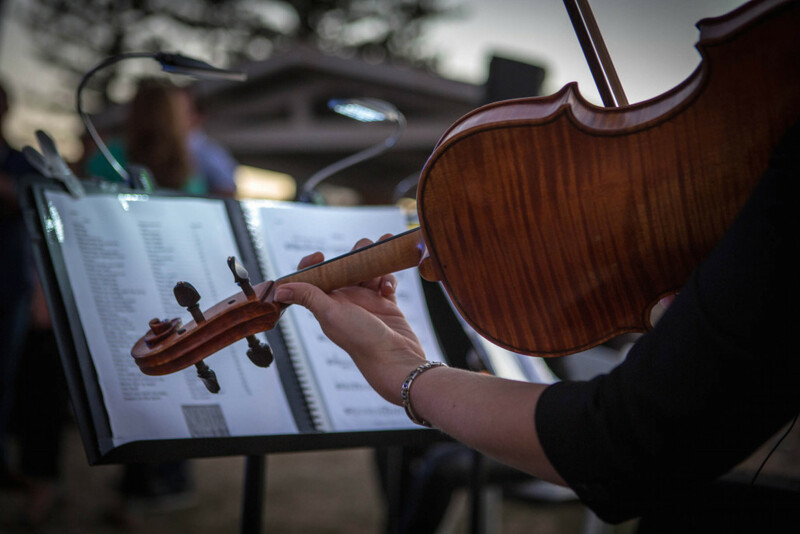 A Perth Symphony quartet was invited to play at the Rottnest Chamber of Commerce (R.I.C.C.) 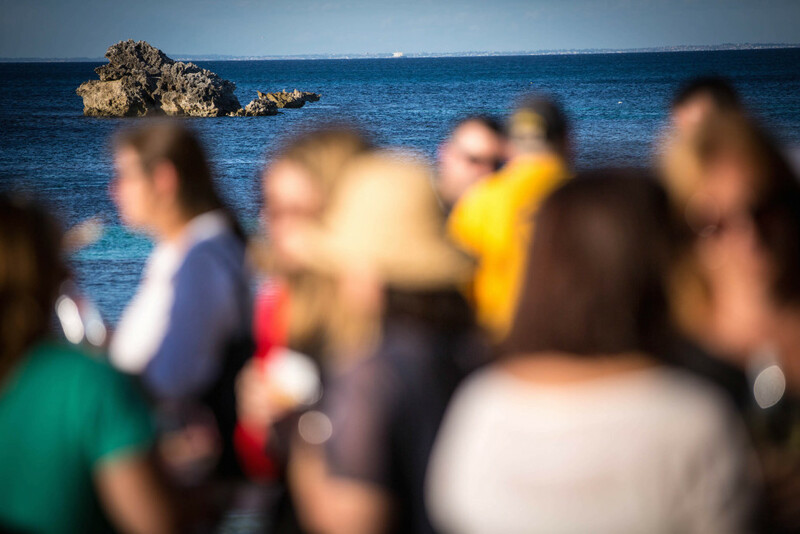 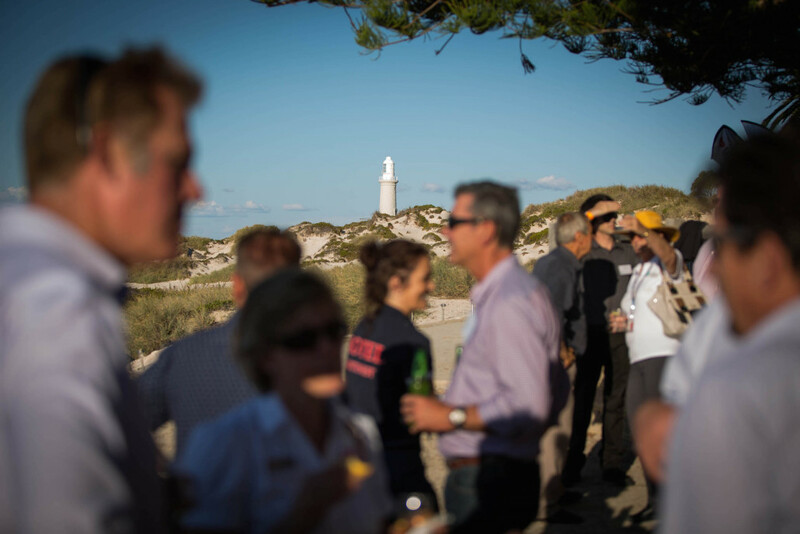 ‘Rottnest After Dark’ function on the 27th March 2015. 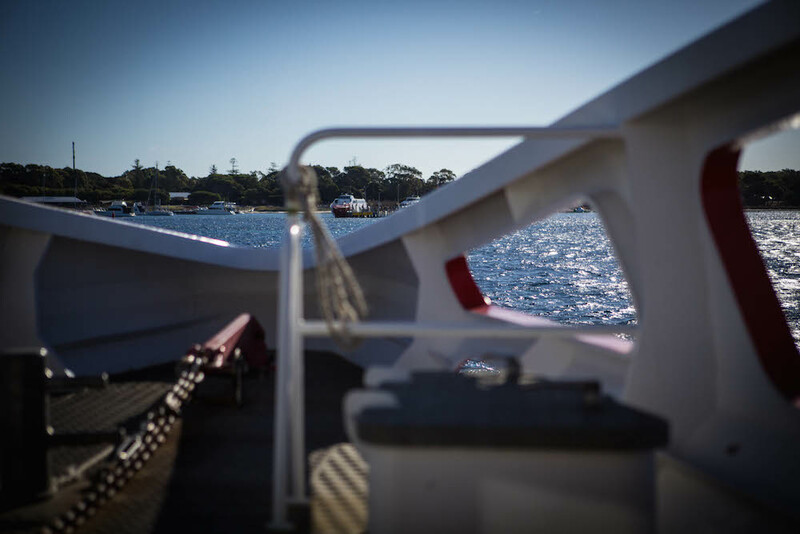 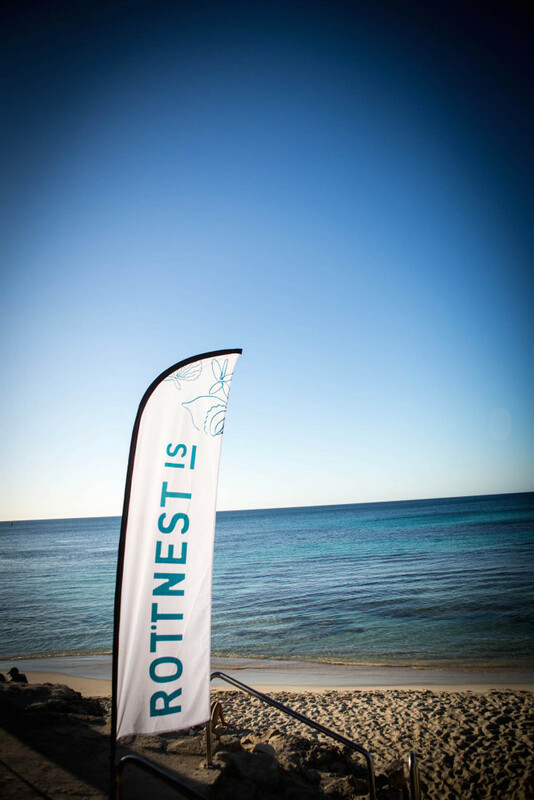 It was the perfect day to be out on the water, and to spend the day on Rottnest Island – with hardly a cloud in the sky. 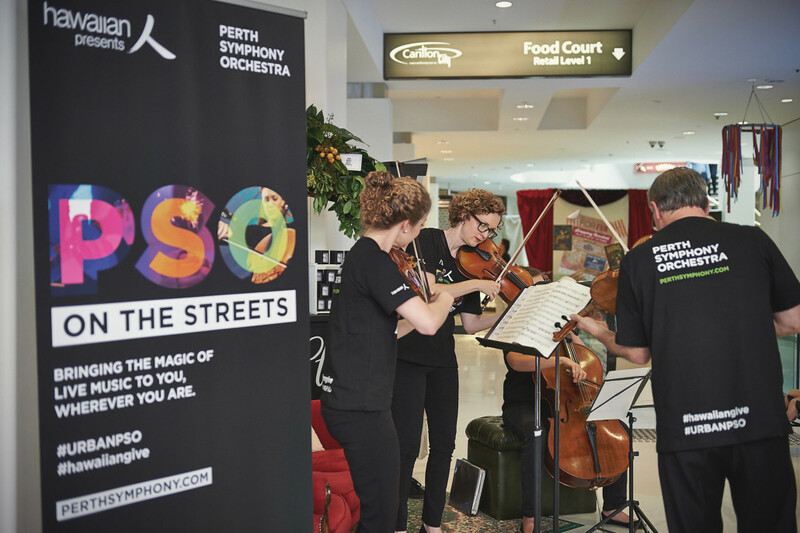 The quartet – made up of members of the Perth Symphony Orchestra provided background music for the day’s proceedings, with Orchestra Directors – Bourby Webster and Gaetan Schurrer attending the event. 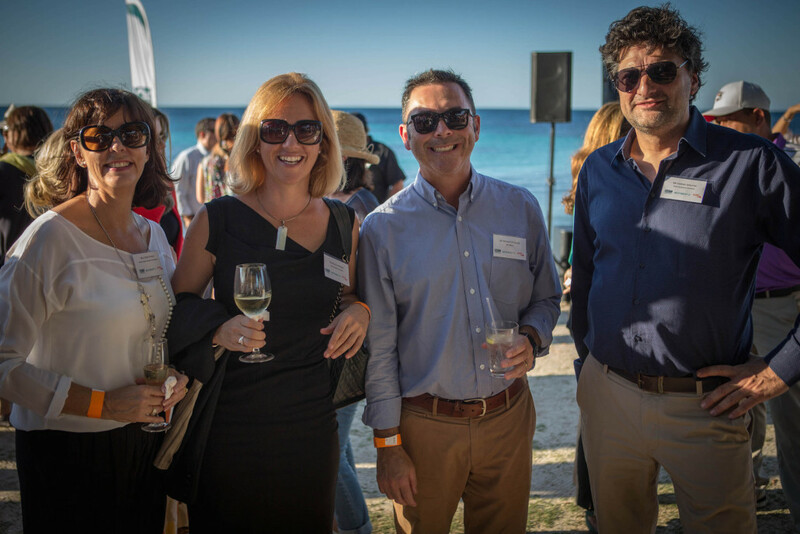 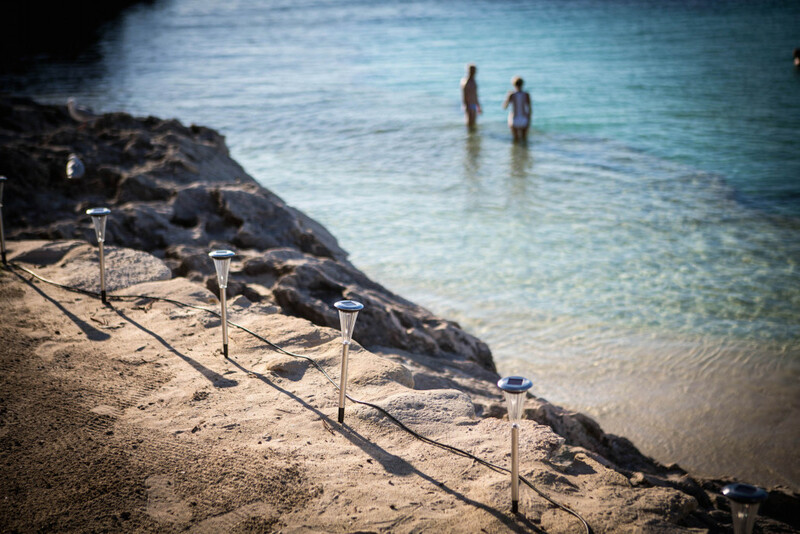 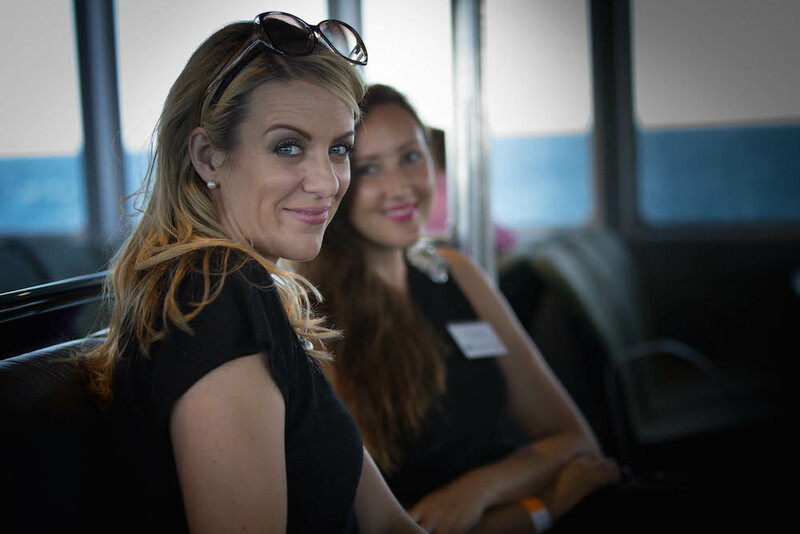 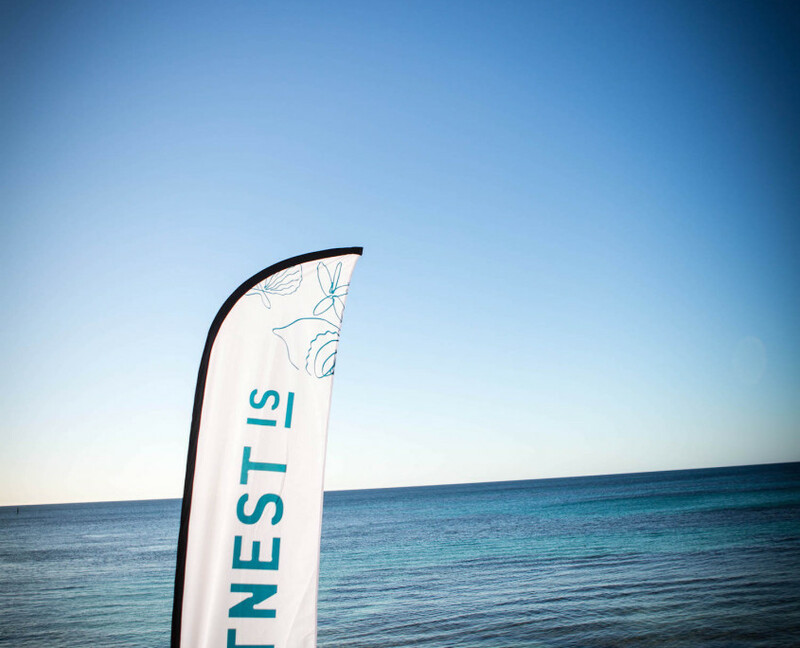 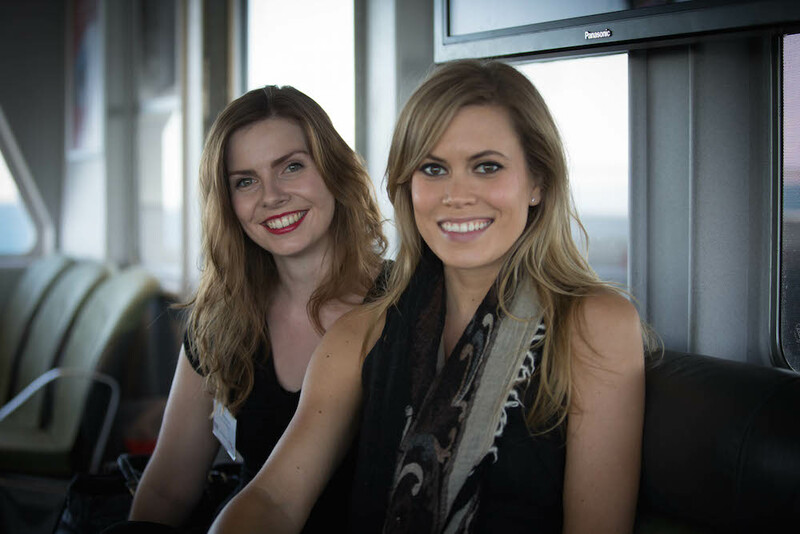 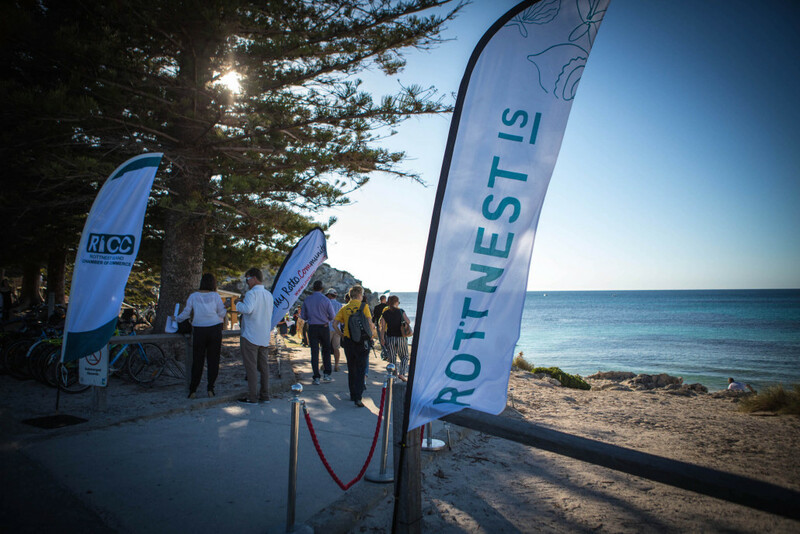 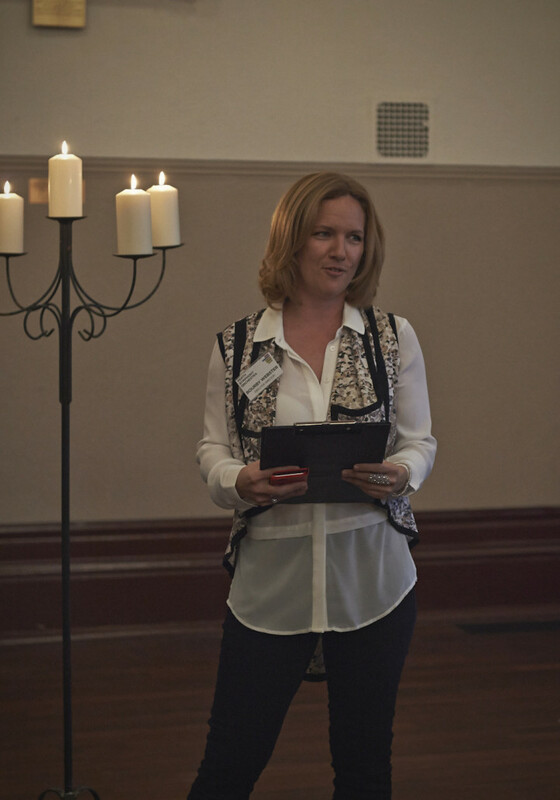 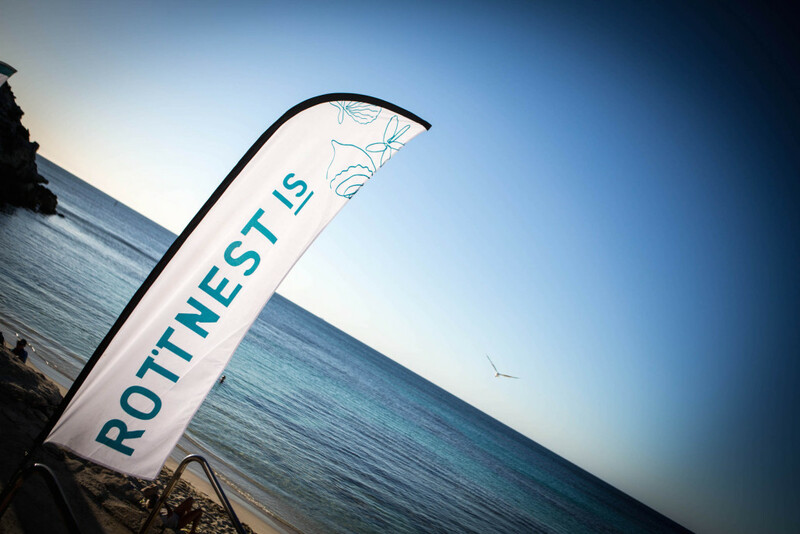 Photographs by Ross Tinney, kindly provided by the Rottnest Island Chamber of Commerce. 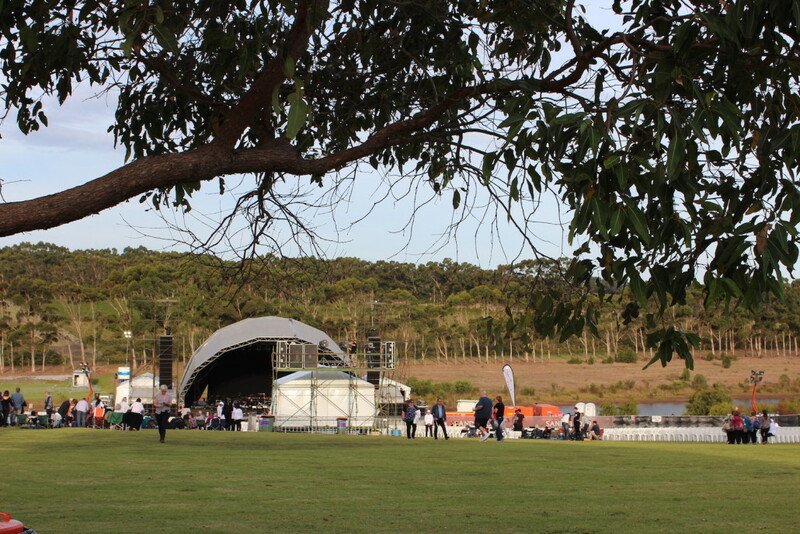 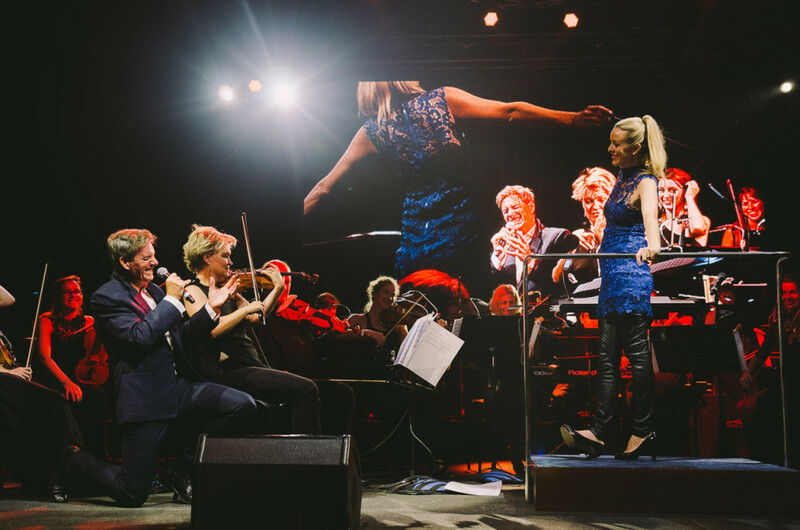 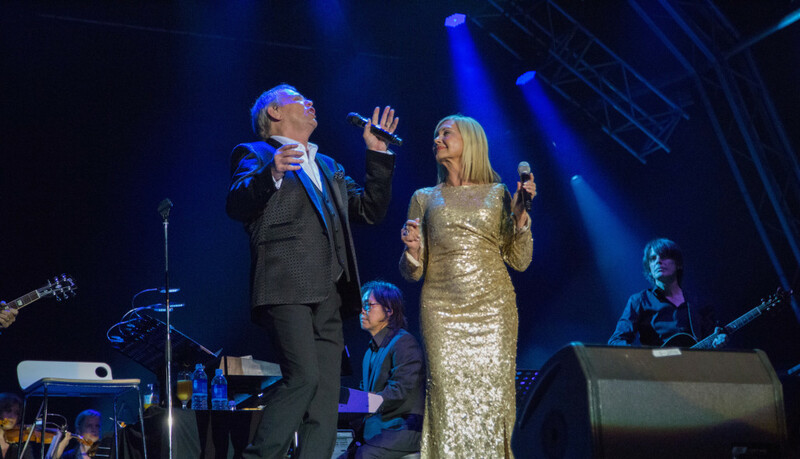 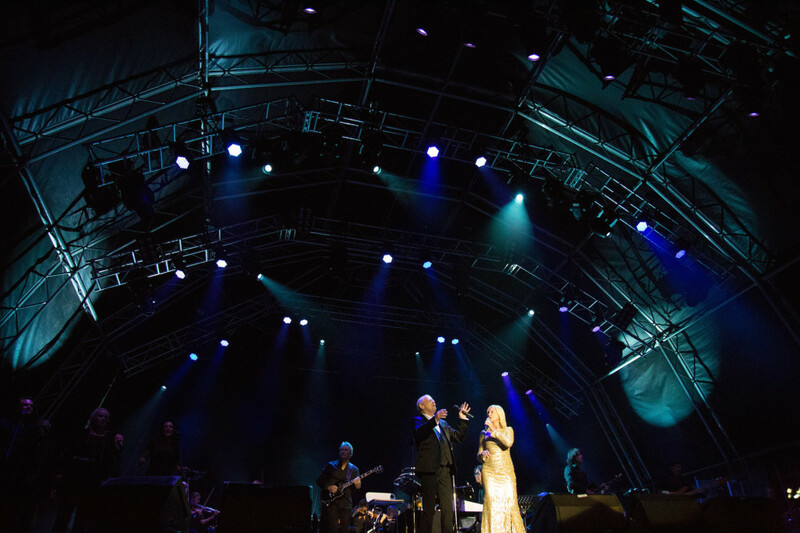 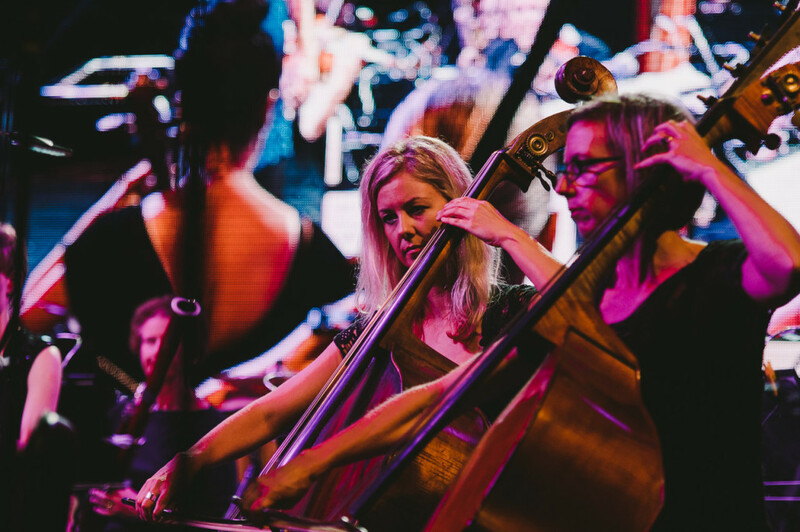 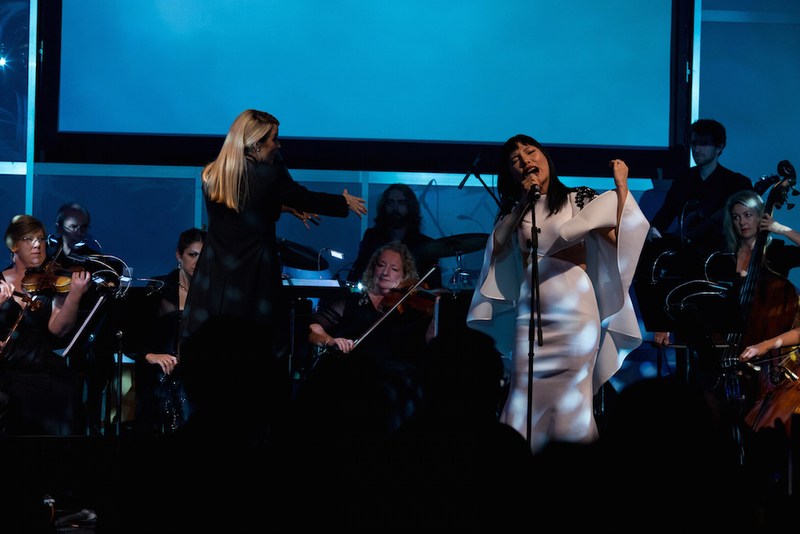 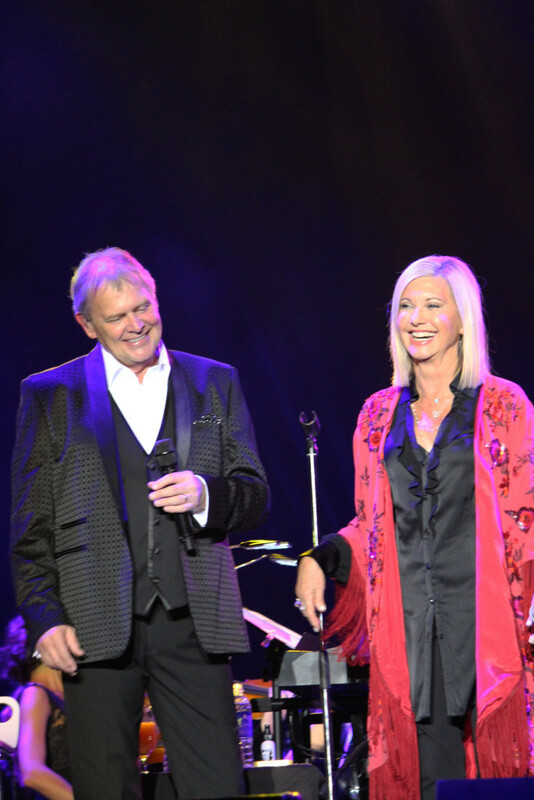 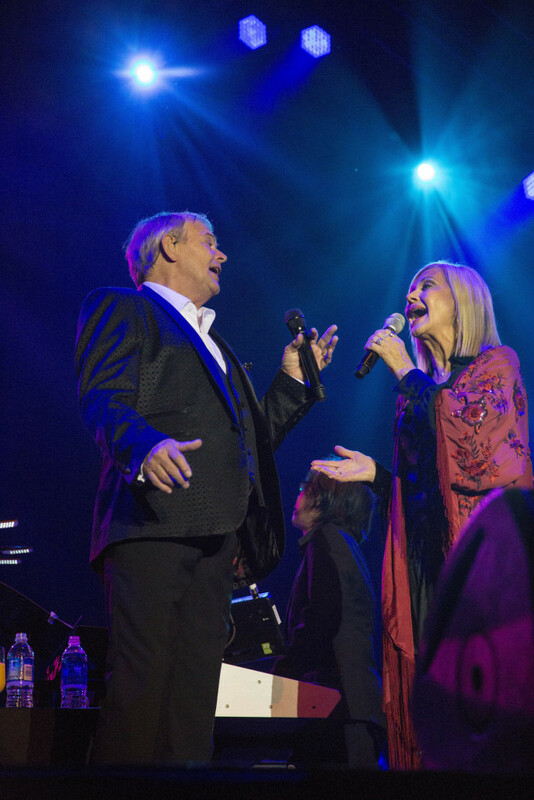 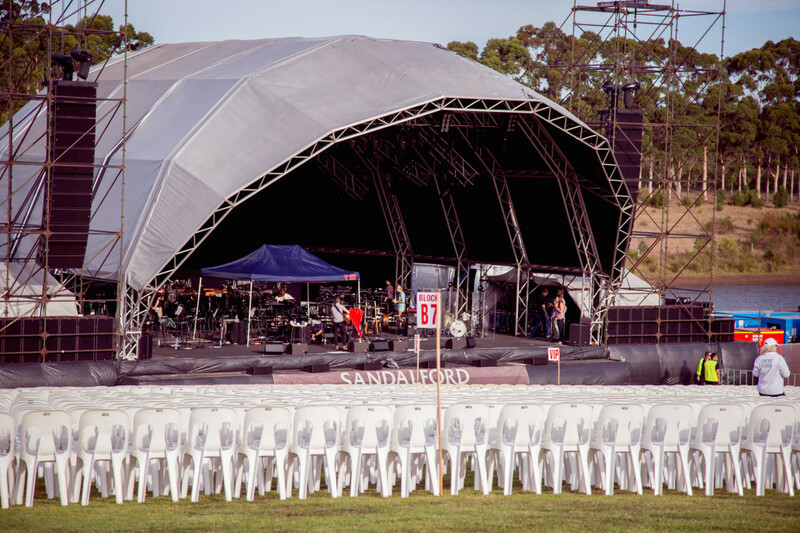 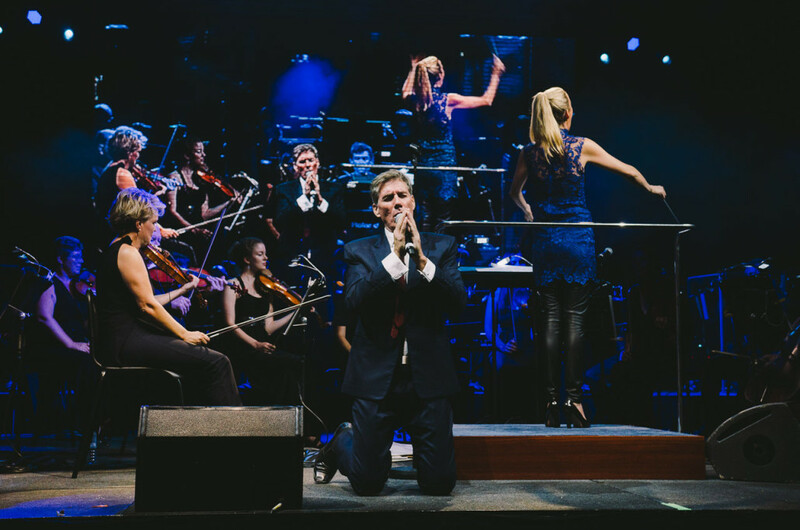 42 members of Perth Symphony was lucky enough to join Australian Pop legends – John Farnham and Olivia Newton-John on stage at Sandalford Winery in Margaret River over Easter weekend. 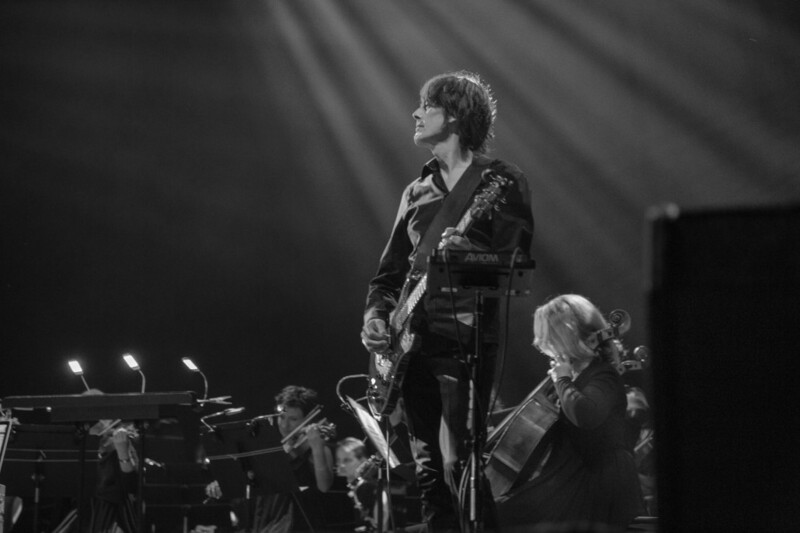 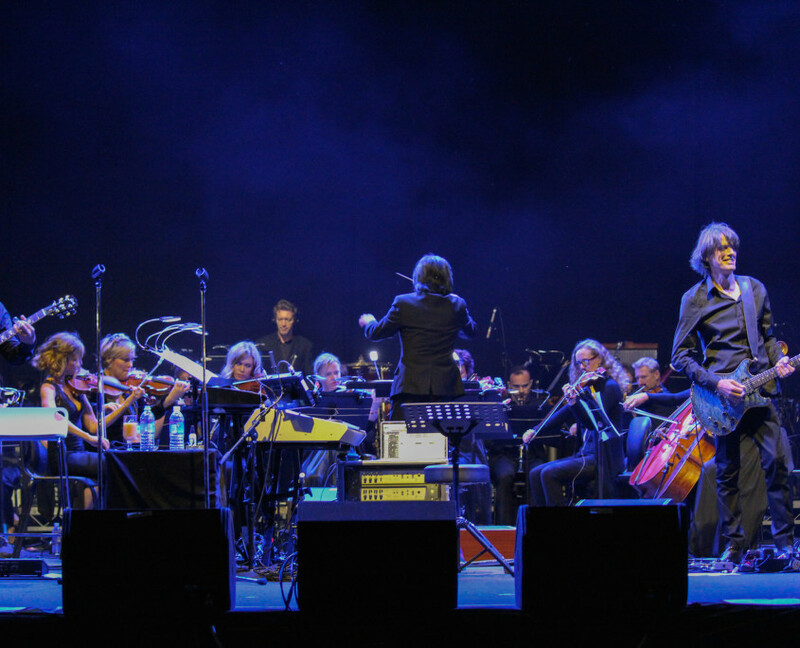 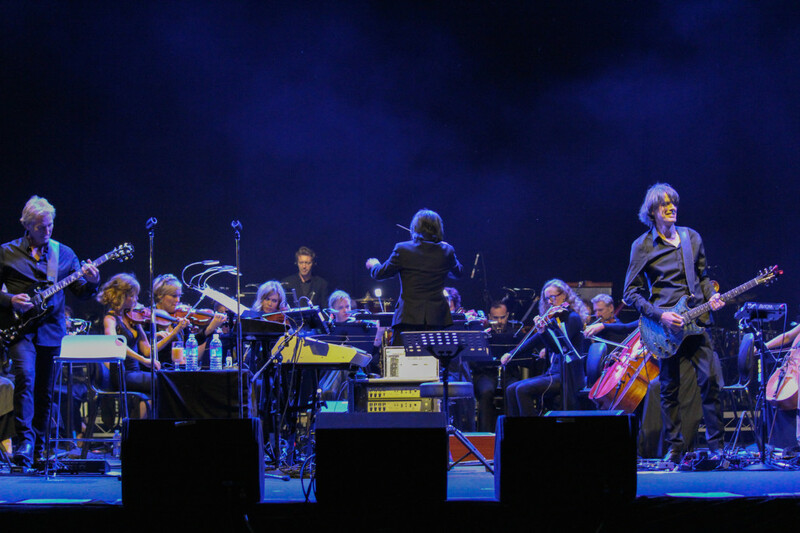 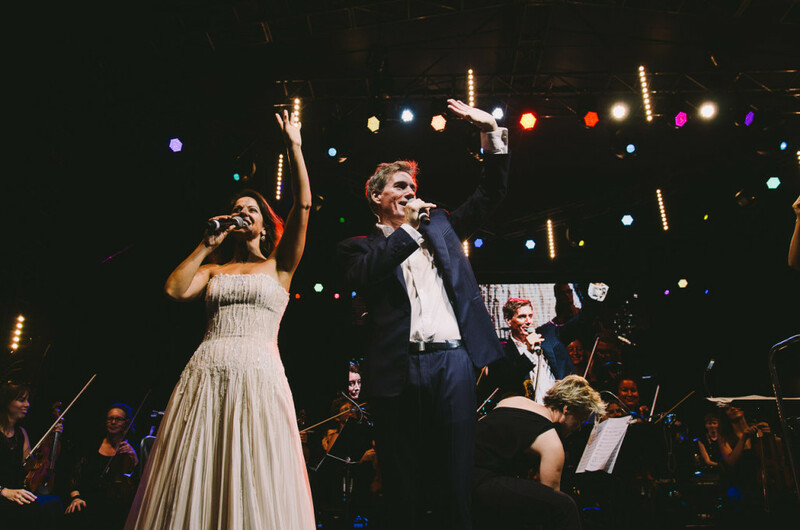 The orchestra had an absolute BLAST on stage with the Aussie stars! 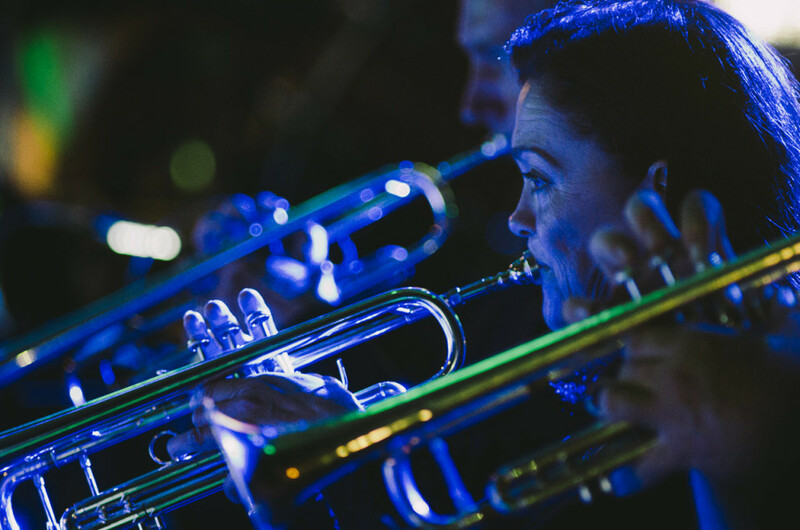 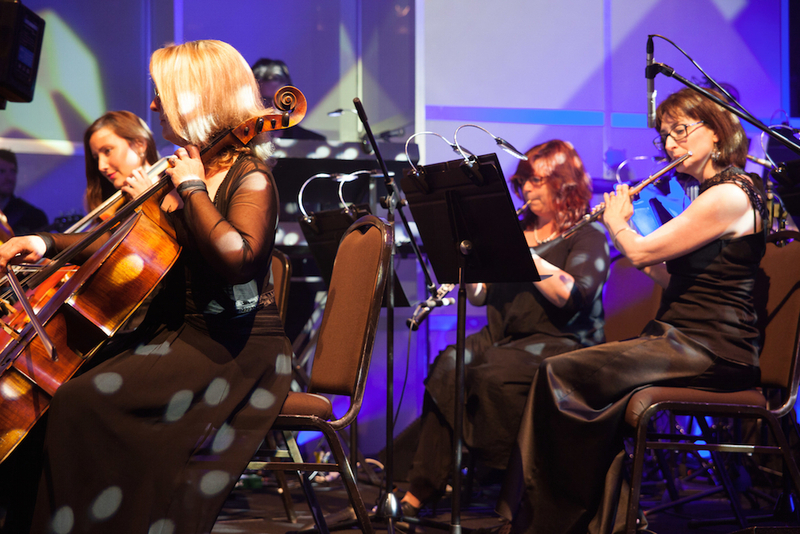 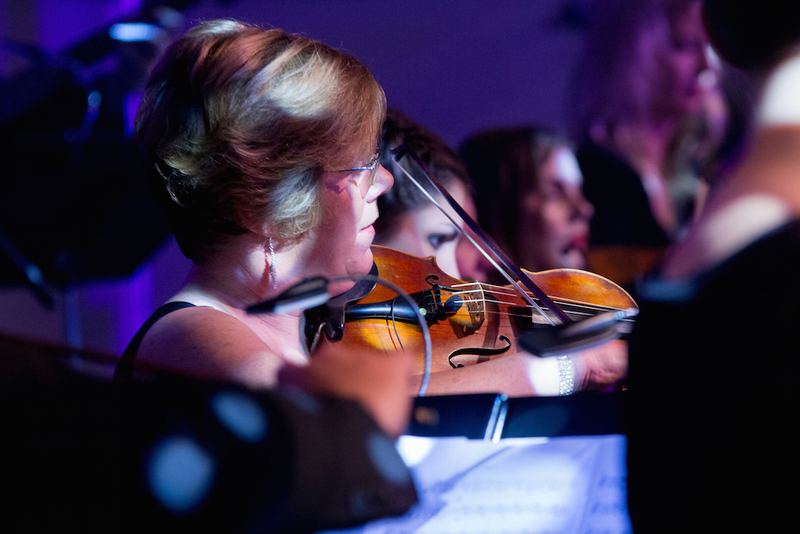 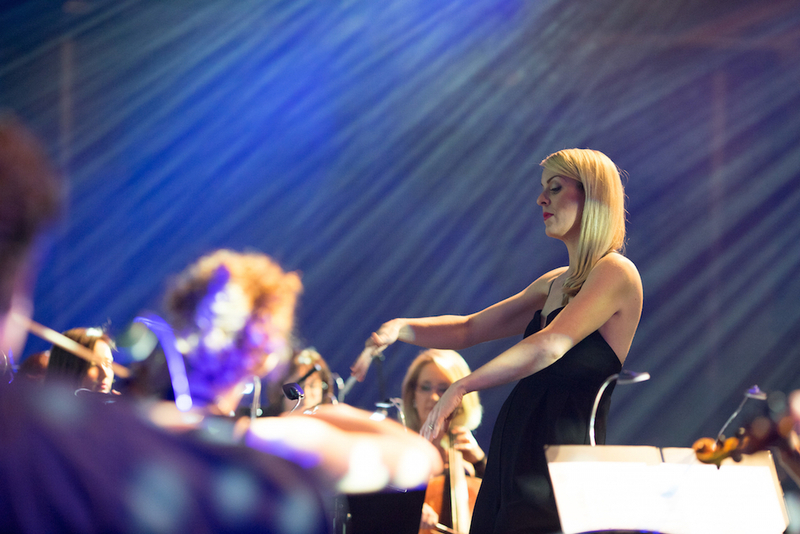 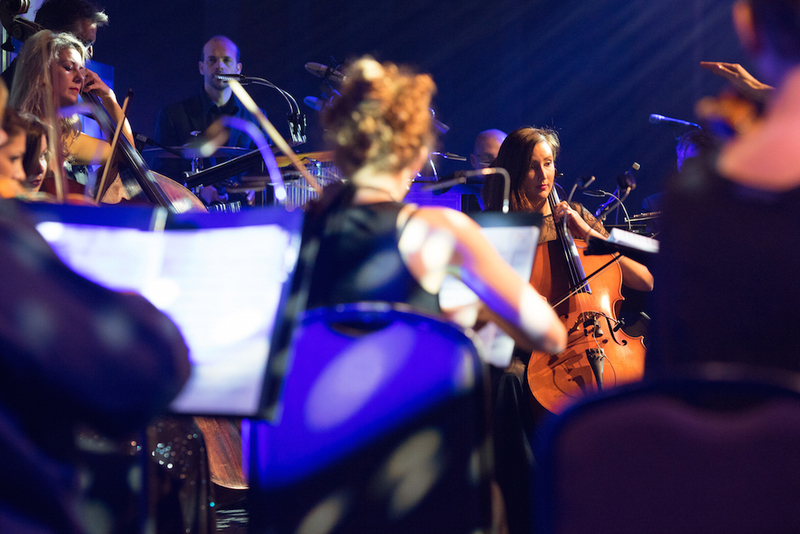 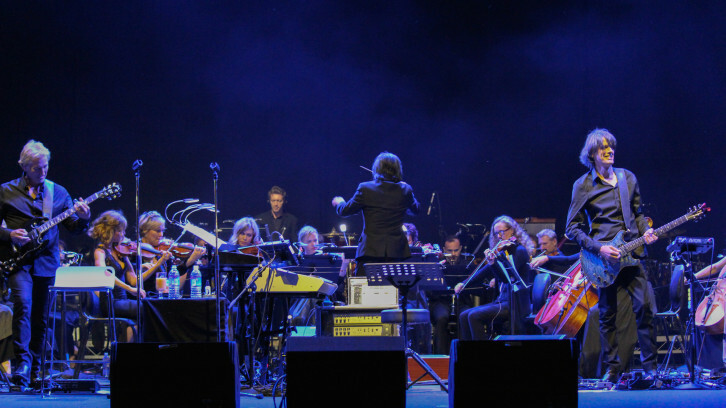 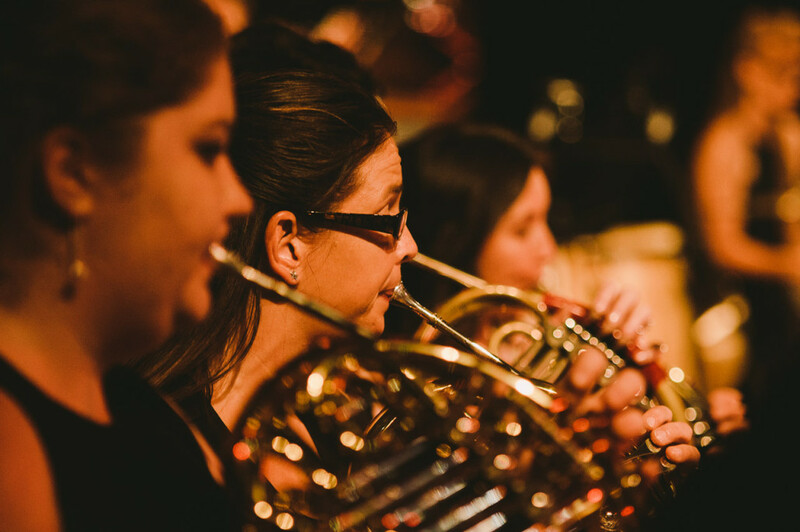 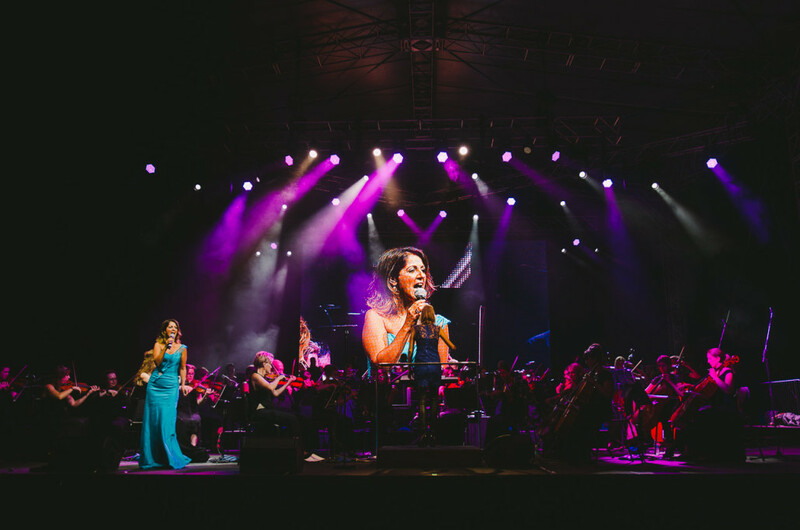 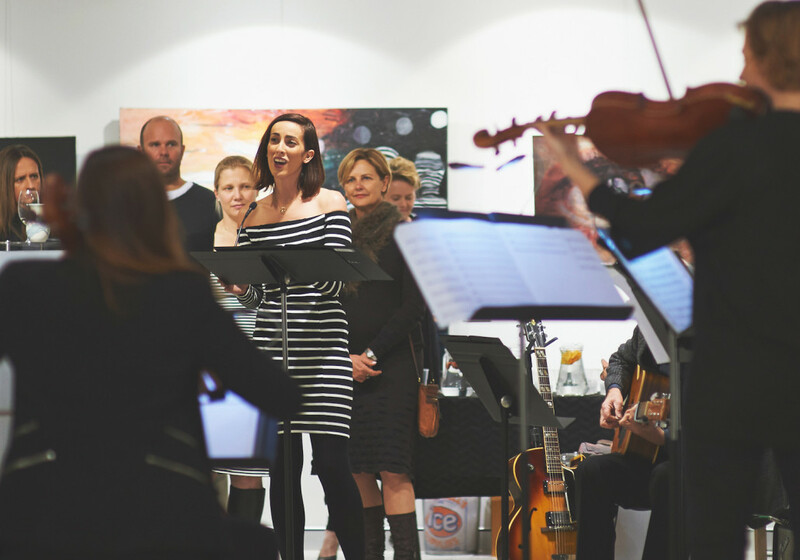 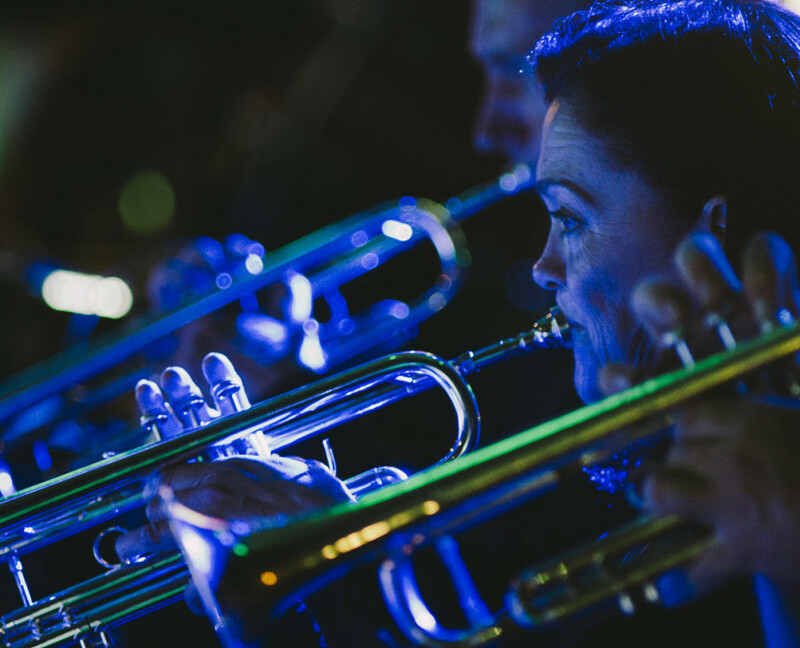 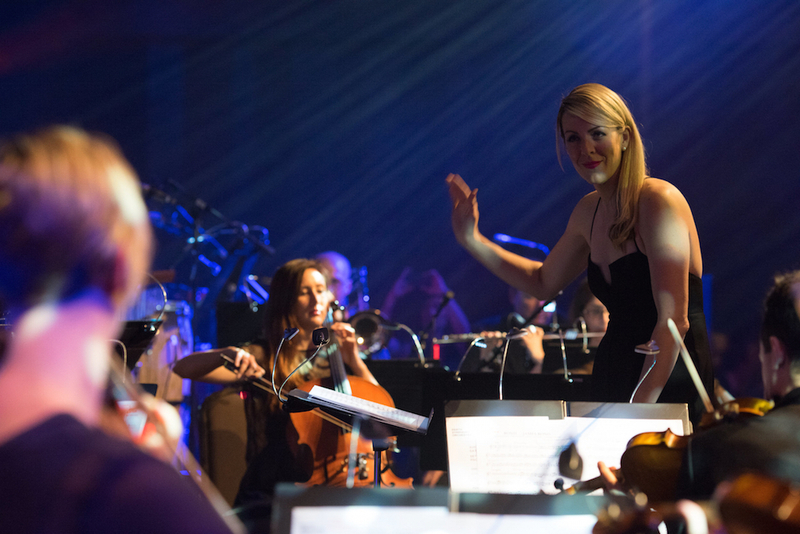 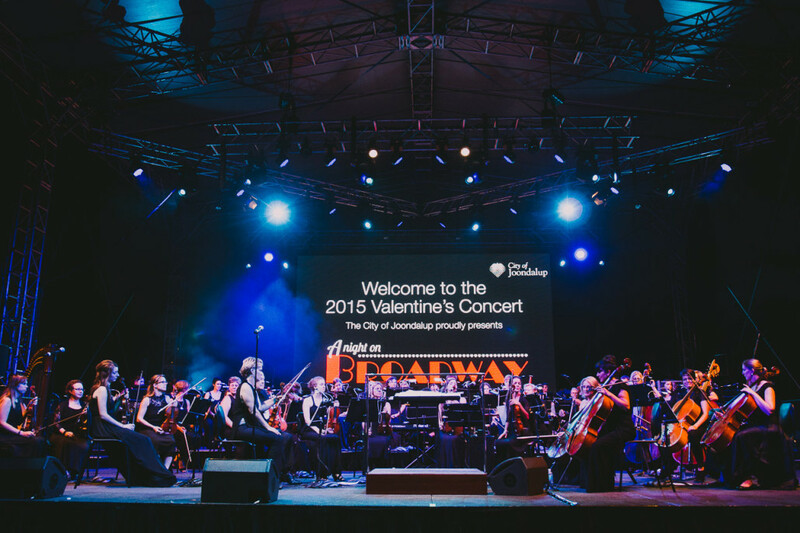 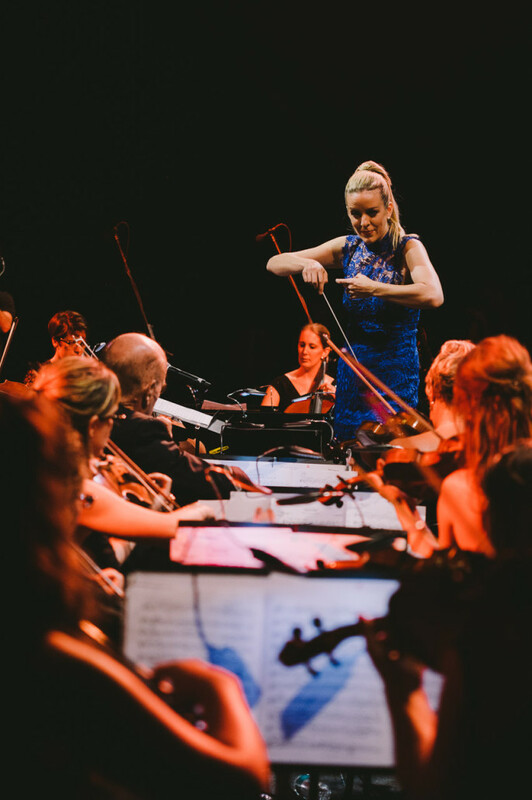 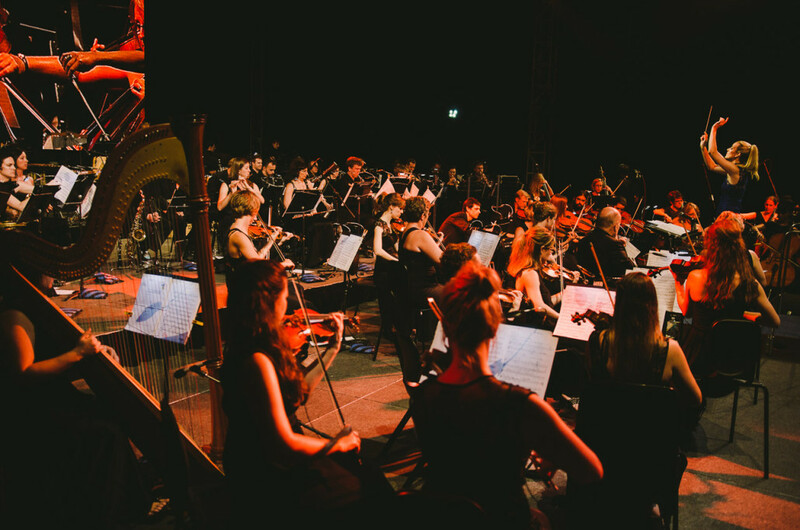 Perth Symphony performed ‘A Night on Broadway’ for the 2015 City of Joondalup’s 2015 Valentine’s Concert. 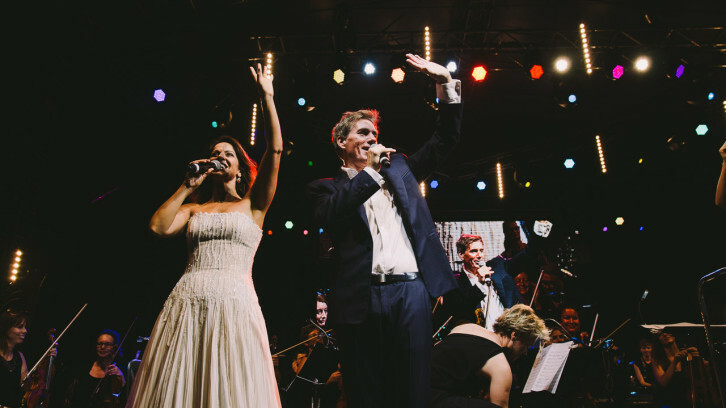 Along with Australian stars David Hobson and Silvie Paladino, they transported the 6000+ crowd form the beautiful greens of the Joondalup Golf Course to NYC’s Broadway and London’s West End for the evening. 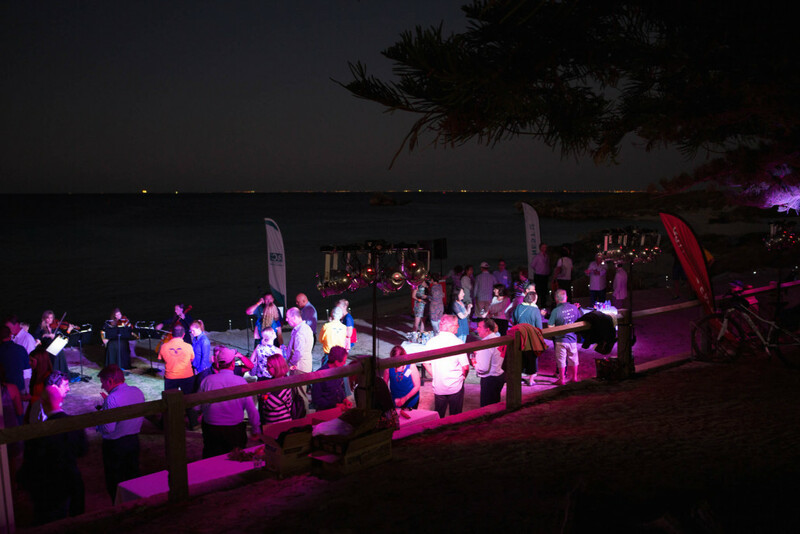 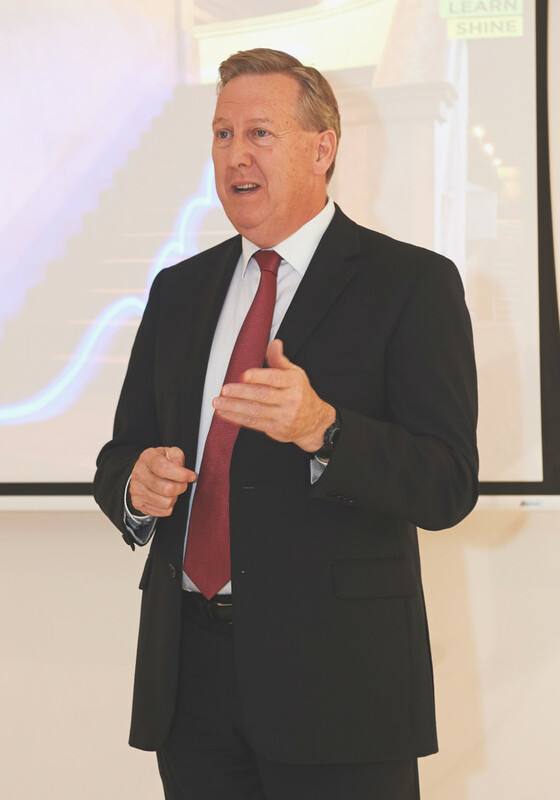 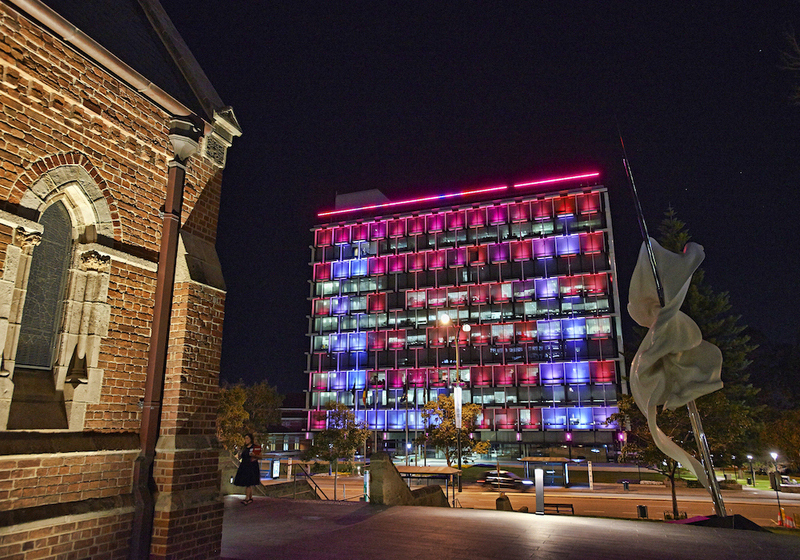 All images courtesy of the City of Joondalup.